Towards the end of the ice age there was a short cold period when the glaciers advanced once more, but soon they began their final retreat, and the ice age was over. The surface of this glacier just a few hundred years ago was hundreds of metres above the bare gravel surface from which I took this photo, and reached most of the way up the valley walls. 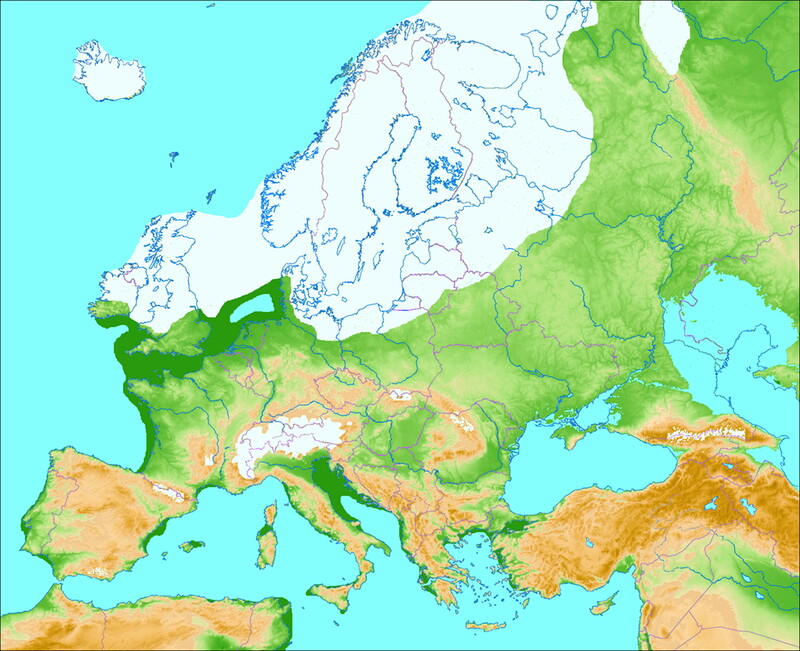 Map showing the maximum extent of the ice in Europe during its last glaciation, called in northern Europe the Weichselian Glaciation, and in the Alpine Region the Würm Glaciation. The maximum shown here occurred at 20 000 BP. The changes in average temperature, flora and fauna during the Late Glacial in Southern Scandinavia. 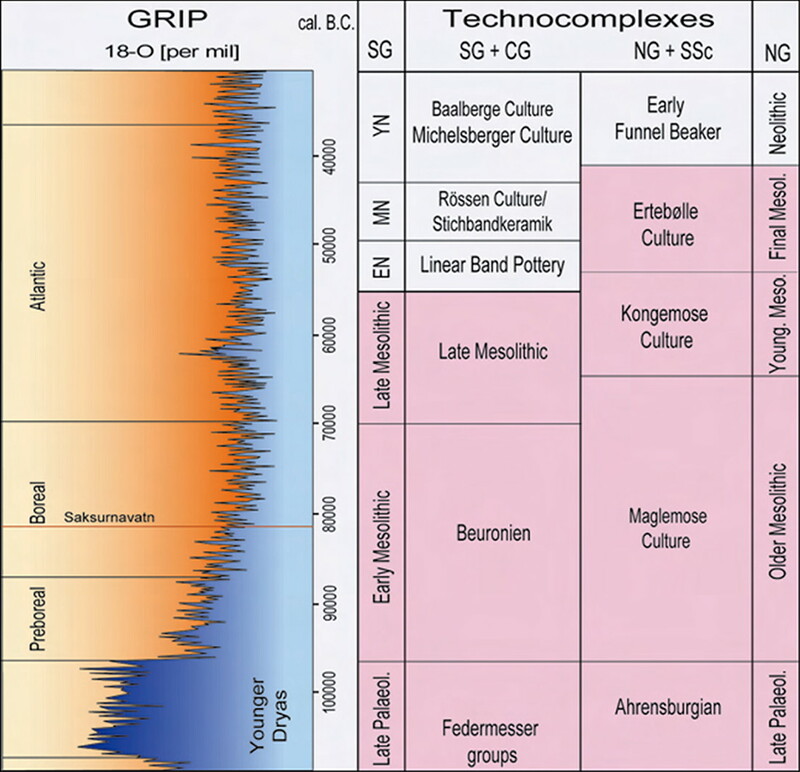 The Laacher See eruption occurred around 13 000 BP and acts as a useful chronostratigraphic marker for this time. 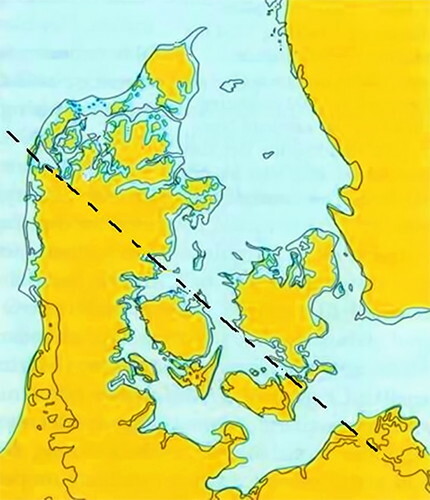 Top left: The Baltic Ice Sheet, 15 000 BP to 11 600 BP, known in Danish as Den Baltiske Issø, The Baltic Island. Beside it and created by it was the Baltic ice lake, which was a large freshwater lake and predecessor to the Baltic Sea. 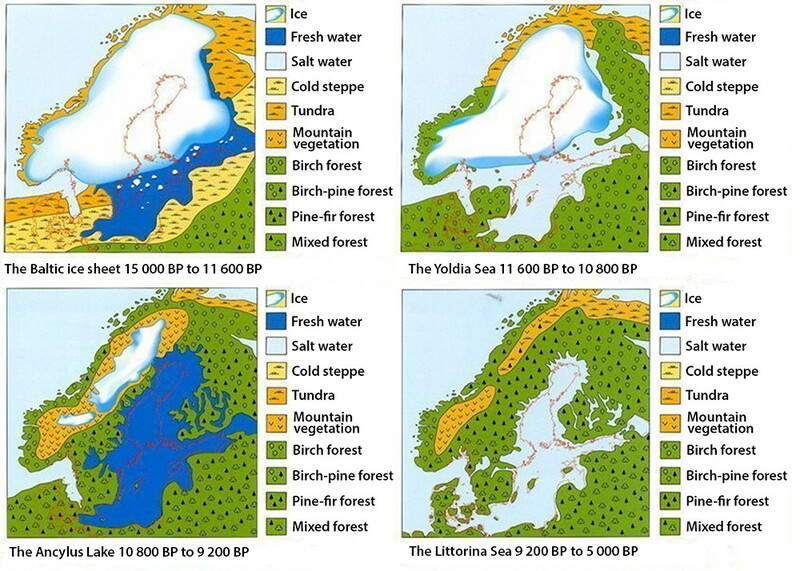 It was created when the inland ice sheet gradually began to retreat to the north, and a freshwater reservoir was formed in the southern part of the Baltic Sea basin. The lake was dammed partly by the surrounding lands and partly by the inland Baltic Ice Sheet, was higher than the ocean, and had icebergs drifting on its surface. 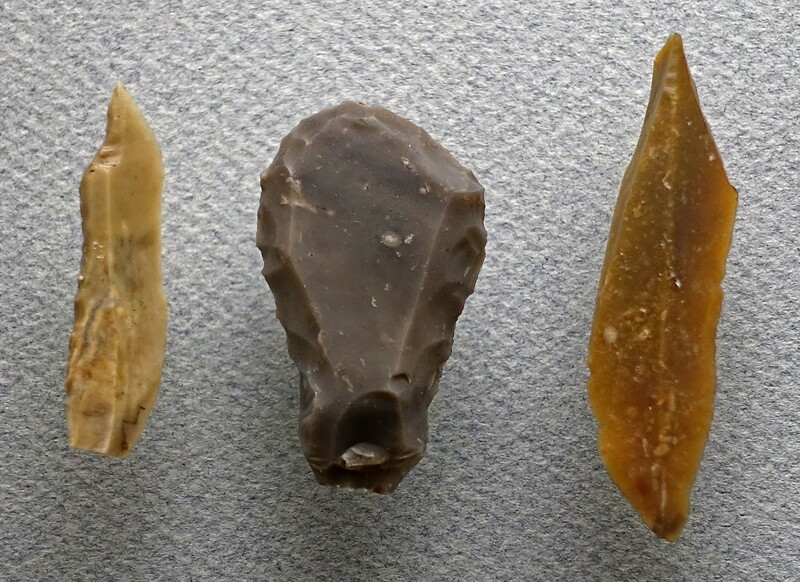 Top right: The Yoldia Sea, 11 600 BP to 10 800 BP, dated by material from ancient sediments, shore lines, and from clay-varve chronology. The Yoldia Sea is the name given by geologists to a variable brackish-water stage in the Baltic Sea basin that prevailed after the Baltic ice lake was drained to sea level. The name derives from the bivalve, Yoldia arctica, now known as Portlandia arctica, which requires cold saline water. 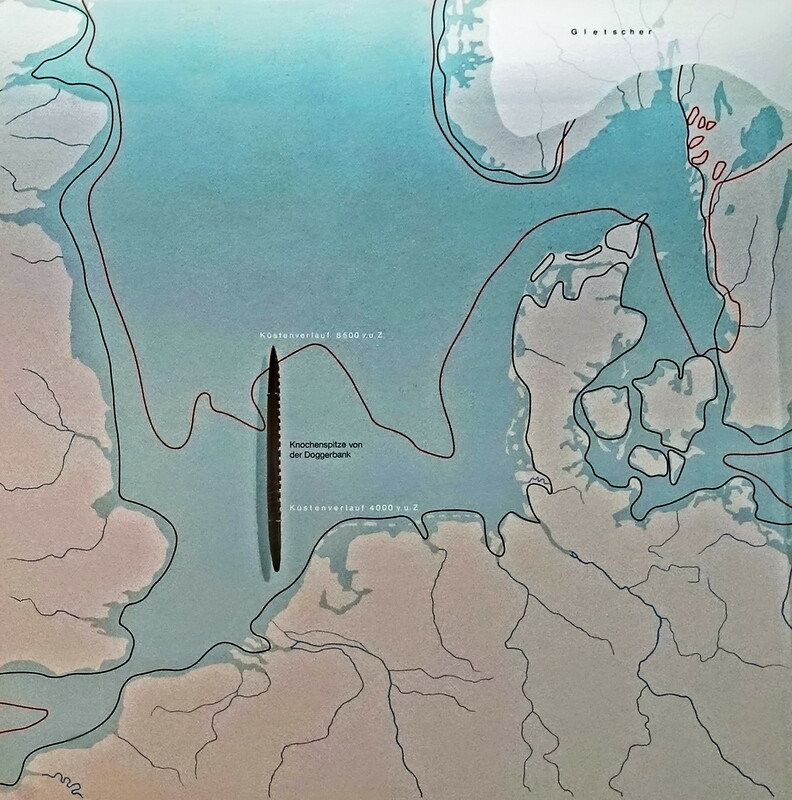 Its presence indicates the middle phase of the Yoldia Sea, when saline water poured into the Baltic, before the acceleration of glacial melting. Bottom left: The Ancylus Lake, 10 800 BP to 9 200 BP, which replaced the Yoldia Sea after the latter had been severed from its saline intake across a seaway along the Central Swedish lowland, roughly between Gothenburg and Stockholm. The cutoff was the result of isostatic rise, itself because of the removal by melting of the weight of several kilometres thickness of ice, being faster than the concurrent post-glacial sea level rise. In 1887 Henrik Munthe was the first geologist to draw the conclusion that the Baltic Sea must once have been a freshwater lake, after finding fossils of the fresh water snail Ancylus fluviatilis in sediments. 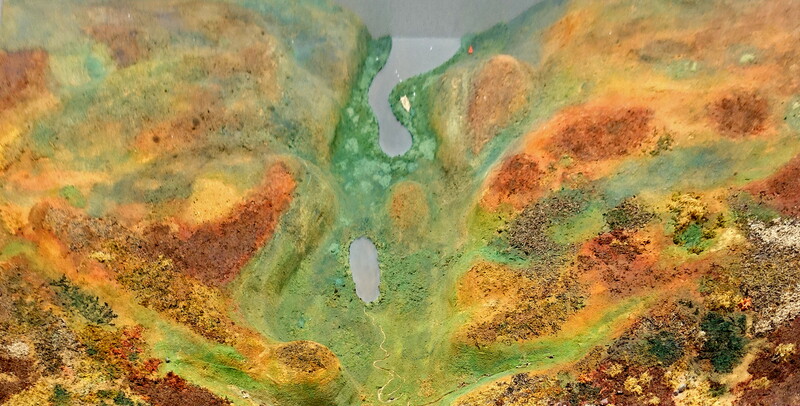 Bottom right: The Littorina Sea, 9 200 BP to 5 000 BP replaced the Ancylus lake when rising sea levels began to break through the Dana River valley. This transformation was gradual, and the salt-water that began to enter the lake resulted in episodic brackish water pulses. The proper end of the Ancylus Lake came however around 7 800 BP – 7 200 BP when the Øresund, or the Sound, the strait which forms the Danish–Swedish border, was completely breached by the sea, causing a massive inflow of salt-water. The Littorina Sea is named after the common periwinkle Littorina littorea, then a prevailing mollusc in the Baltic Sea, which indicates that the water was saline. The climate became increasingly warm. In front of the receding ice edge, tree-poor, but herbaceous and shrubby grassy steppes formed the habitat for large reindeer herds. They meant life for the hunter groups of the Hamburg culture. In a period of further warming, northern Europe was covered with sparse birch and pine forests. Now the moose was at home, in forested areas where there was snow cover in the winter, and there were nearby lakes, bogs, swamps, streams and ponds. They were stalked by the hunters of the Federmesser and Bromme cultures. Once again the climate worsened with the onset of the Younger Dryas, the last cold snap of the Ice Age. In many areas of northern Europe, the forest retreated to the tundra, where small groups of birch and pine trees could be found. 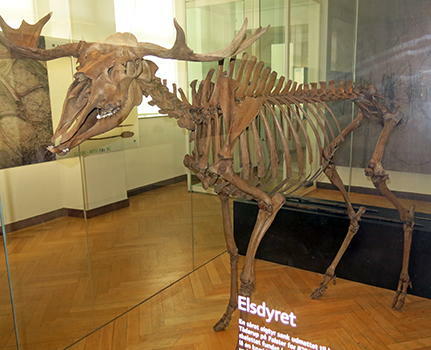 The reindeer returned and became the most important prey for the hunting groups of the Ahrensburg culture. 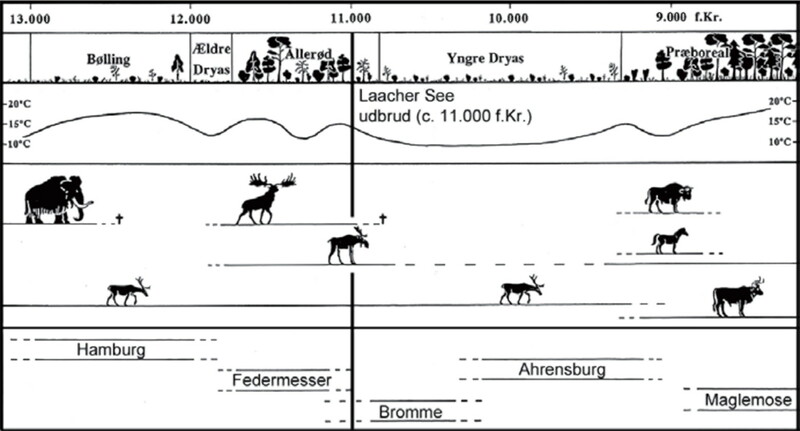 The Ahrensburg culture was a late Upper Paleolithic nomadic hunter culture during the Younger Dryas, the last spell of cold at the end of the Weichsel glaciation resulting in deforestation and the formation of a tundra with bushy arctic white birch and rowan. ( The Federmesser (literally, feather knife) culture is named after a characteristic small knife, dubbed in English a penknife. Both terms refer to a small knife used to cut a pen from, typically, a goose quill. In common English usage it now means a small sharp knife which folds into its handle, kept in the pocket, sometimes called a pocket knife in fact, and used for minor tasks, though few users of the term now would be aware of its etymology. 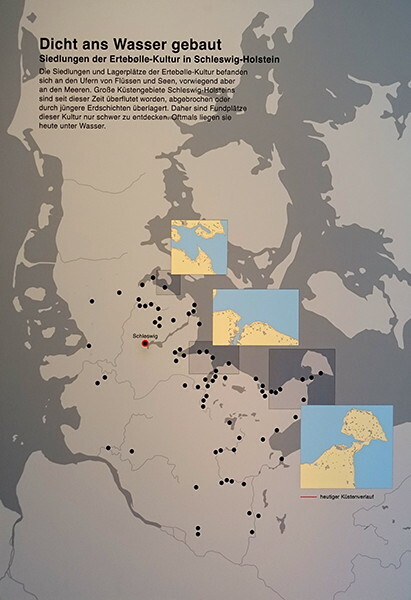 Map showing sites of the Hamburg culture. 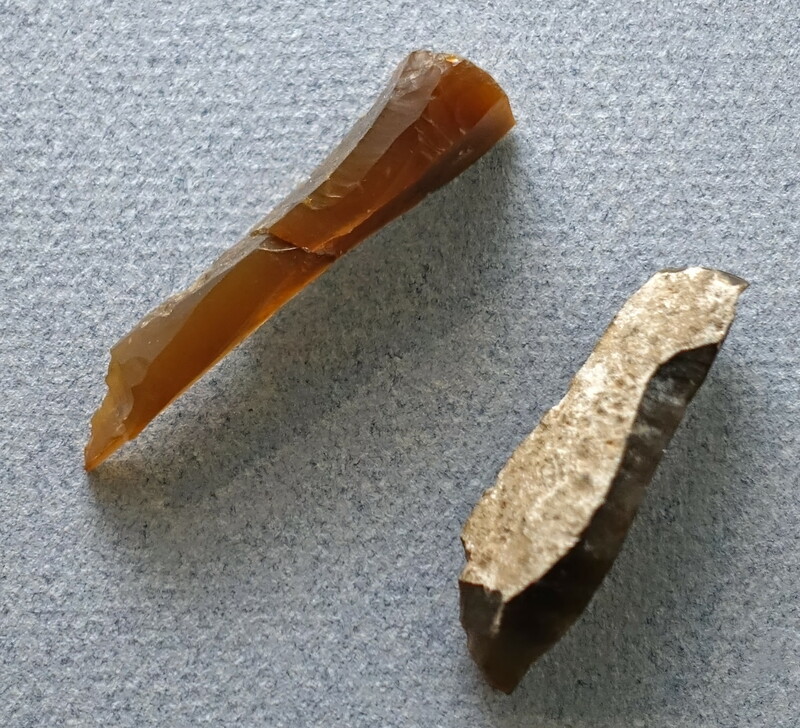 Among the finds from the reindeer hunters' camps, flint tools predominate. 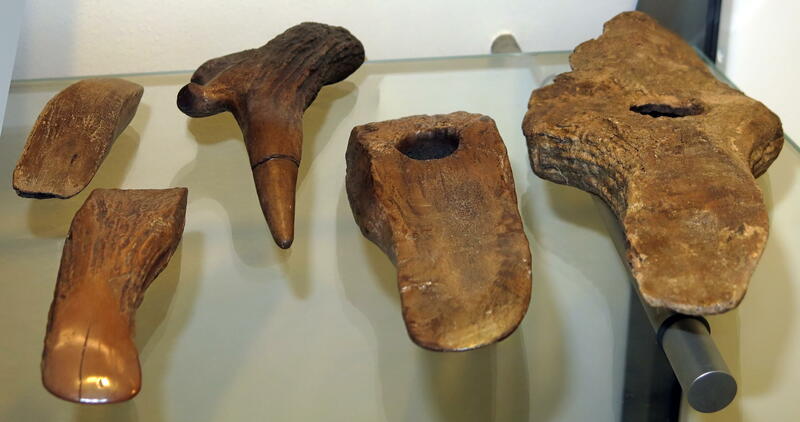 The original hafts of wood, bone or antler are usually gone. 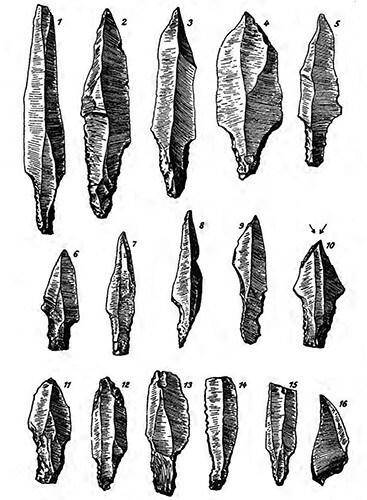 The characteristic stone implements were made of blades: shouldered points used as arrow or spear points, scrapers made on a blade for processing fur, borers and burins for the working of wood, antlers or bones. 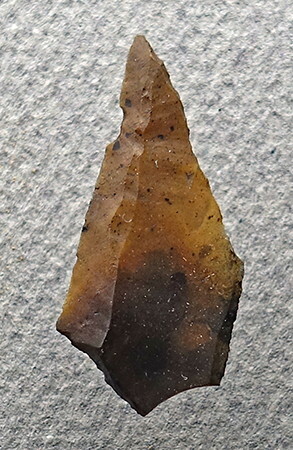 Suitable flint was often found in the vicinity of the camps. 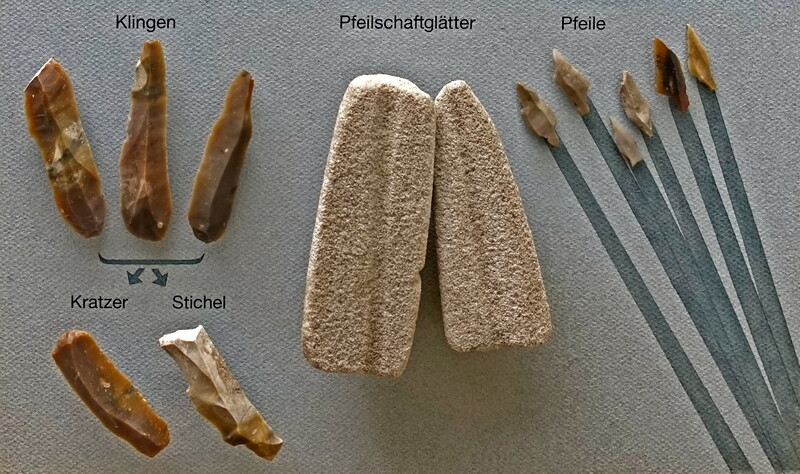 The Hamburg culture or Hamburgian was a Late Upper Paleolithic culture of reindeer hunters in northwestern Europe during the last part of the Weichsel Glaciation beginning during the Bölling interstadial. Sites are found close to the ice caps of the time. 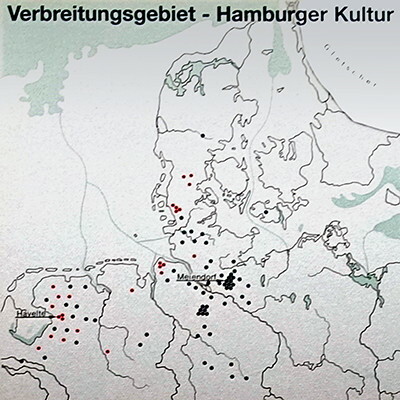 The Hamburg Culture has been identified at many places, for example, the settlement at Meiendorf and Ahrensburg north of Hamburg, Germany. It is characterised by shouldered points and borers, which were also used as burins when working with antler. In later periods tanged Havelte-type points appear, sometimes described as most of all a northwestern phenomenon. 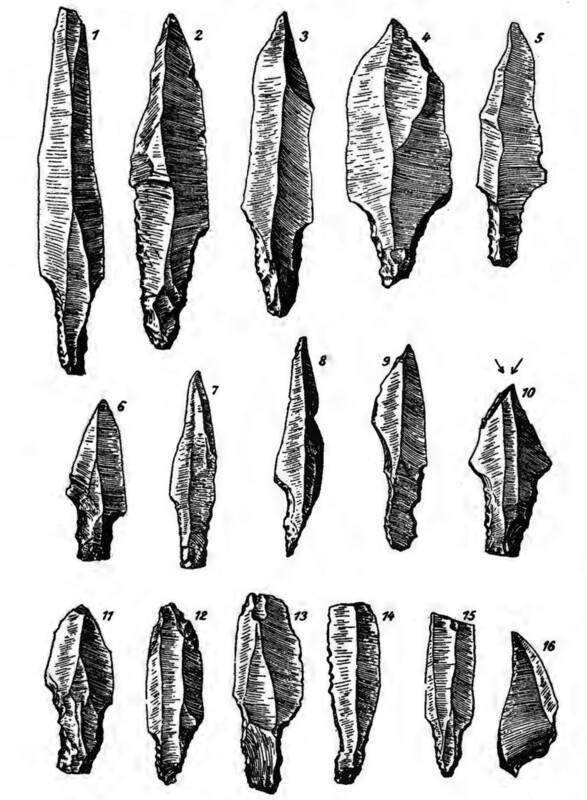 Kerbspitzen / notched edge points / shouldered points / flint blades with a tang, typical of the Hamburgian culture. 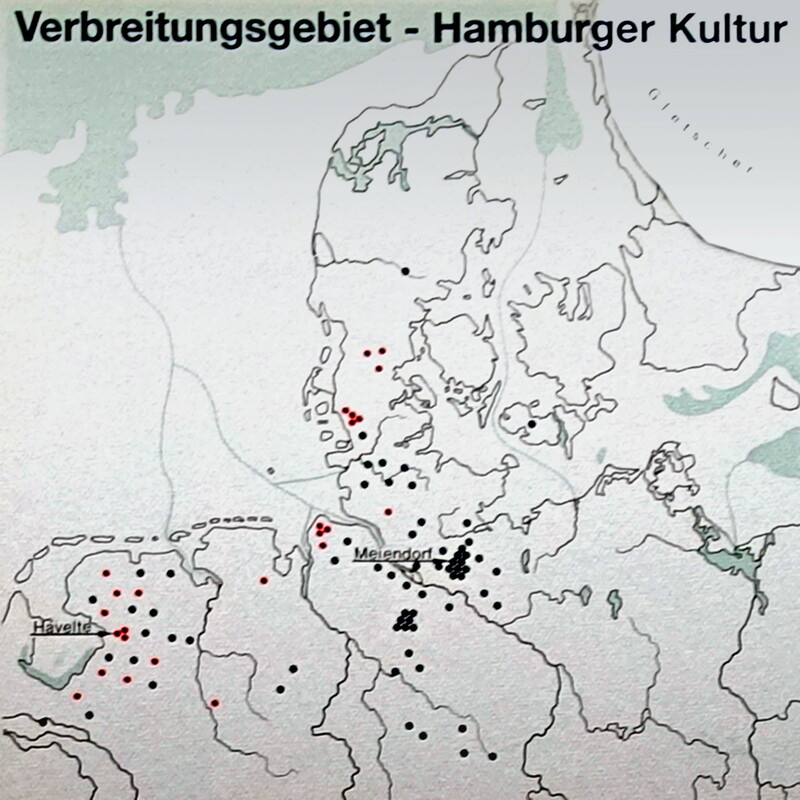 Some points in this image are of the classic Hamburgian style, whilst others are those known as Havelte shouldered points. 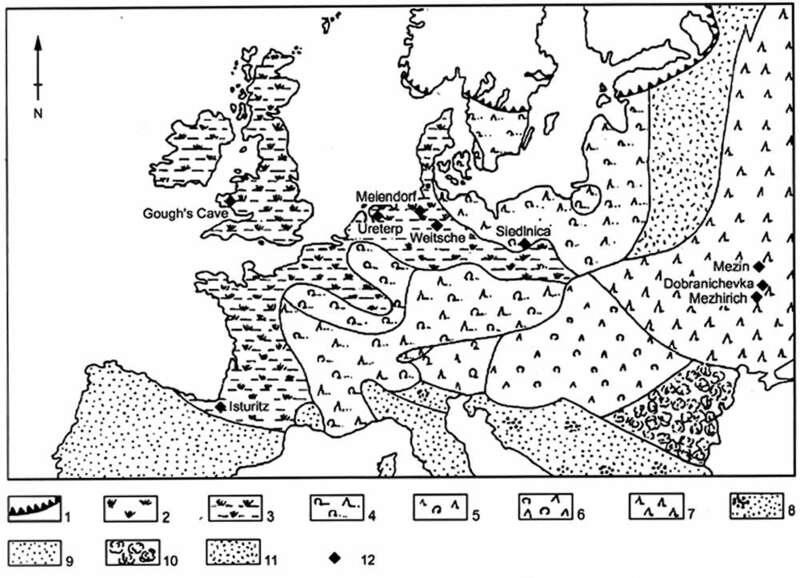 Distribution map of classic Hamburgian, Havelte Group and Hamburgian sites on the North European Plain at the beginning of the Lateglacial Interstadial. 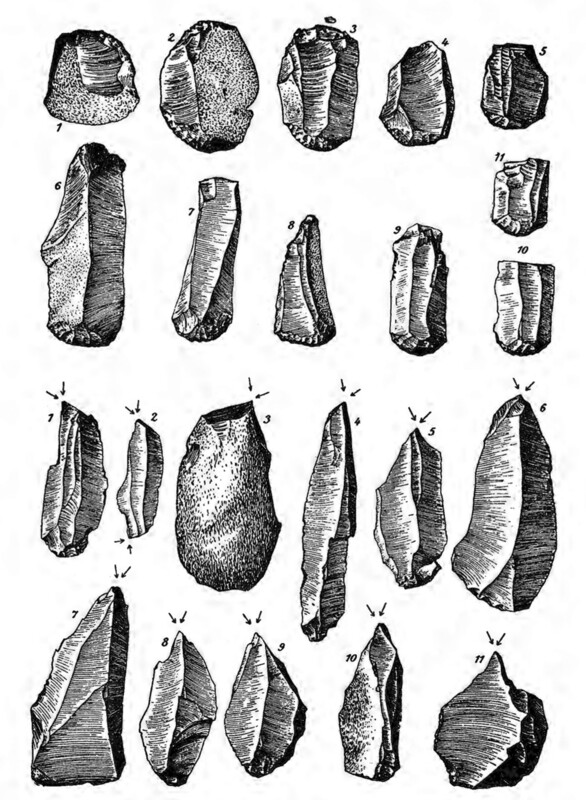 Stichel - burin, Kratzer - scraper, Zinken - awl or drill. The Bølling-Allerød interstadial was an abrupt warm and moist interstadial period that occurred during the final stages of the last glacial period. This warm period ran from circa 14 700 to 12 700 BP. 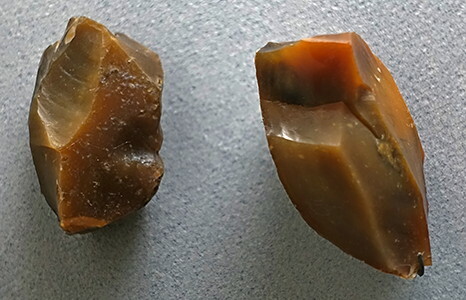 It began with the end of the cold period known as the Oldest Dryas, and ended abruptly with the onset of the Younger Dryas, a cold period that reduced temperatures back to near-glacial levels within a decade. In some regions, a cold period known as the Older Dryas can be detected in the middle of the Bølling-Allerød interstadial. In these regions the period is divided into the Bølling oscillation, which peaked around 14 500 BP, and the Allerød oscillation, which peaked closer to 13 000 BP. Vegetation and game hunted in the Allerød. In the Allerød warm phase, extensive birch and pine forests were created. The reindeer followed the tundra, retreating to the north. 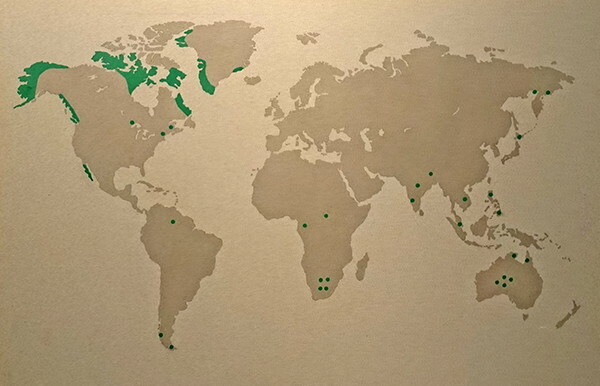 Moose migrated from the south and became the most important hunting animal. Megaloceros, Giant deer or Irish elk. Aland, Leuciscus idus, a type of carp. The Federmesser and Bromme cultures were Hunting cultures of the Bølling-Allerød interstadial, an abrupt warm and moist period at the end of the Oldest Dryas cold period. During the Bølling-Allerød warm phase, two cultures overlapped in Schleswig-Holstein, the South Scandinavian Bromme culture and the penknife culture of northern Germany. Both cultures are distinguished by characteristic flint tools, which are believed to indicate different hunting techniques. The Final Palaeolithic cultural geography of the Allerød according to Newell & Constandse-Westermann (1996). In their interesting and innovative analytical approach the Bromme culture is imbued with not only territorial and economic but also linguistic and ethnic significance ( Niekus, 1995). 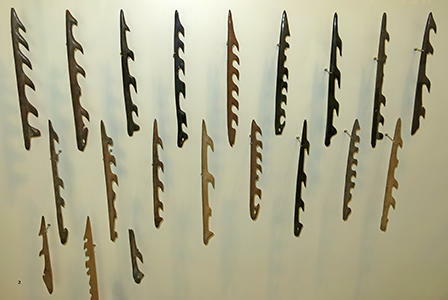 Federmesser, after which the culture is named. 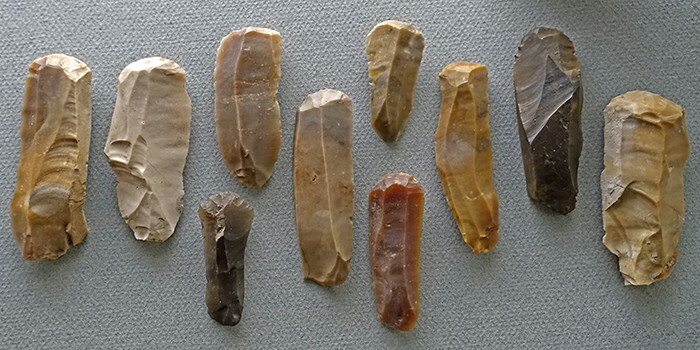 These are small backed knives named after their similarity in shape and size to 'feather knives' or 'quill knives' or 'pen knives' which were used in much later times to cut a sharp point on (typically) a goose quill, which was then dipped in ink, and used for writing on parchment or paper. Moose bone broken open for marrow extraction. Antler and bone were scored by burins to decorate or split them into more suitable dimensions for tools. In these two examples, the object of the exercise was for decoration. 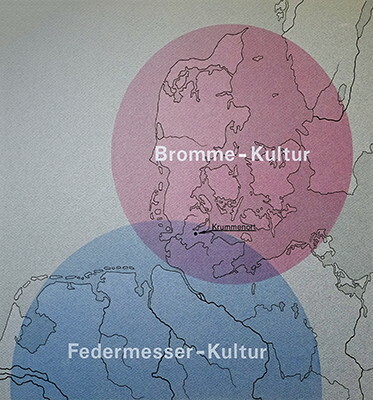 Map of the Federmesser and Bromme cultures in the Schleswig-Holstein general area. The Federmesser (14 800 BP to 12 800 BP) and Bromme (13 600 BP to 11 800 BP) cultures overlapped somewhat, in both location and time, but with the Bromme culture starting (and ending) about 1000 years later than the Federmesser. It may be that the more northerly Bromme culture developed as new lands opened up with the warming of the northern parts of the range. The Bromme culture is a late Upper Paleolithic culture dated to circa 13 600 cal BP to 11 800 cal BP, which corresponds to the second half of the Allerød Oscillation. 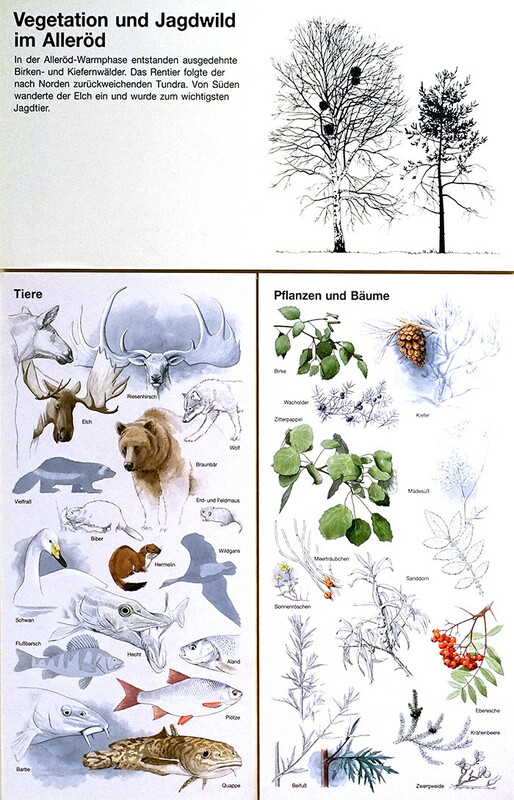 At this time, reindeer was the most important prey, but the Bromme people also hunted moose, wolverine and beaver. The landscape was a combination of taiga and tundra. The culture is named after a settlement at Bromme on western Zealand, and it is known from several settlements in Denmark and Schleswig-Holstein. In Sweden, it is known from the country's earliest known settlement at Segebro, near Malmö. 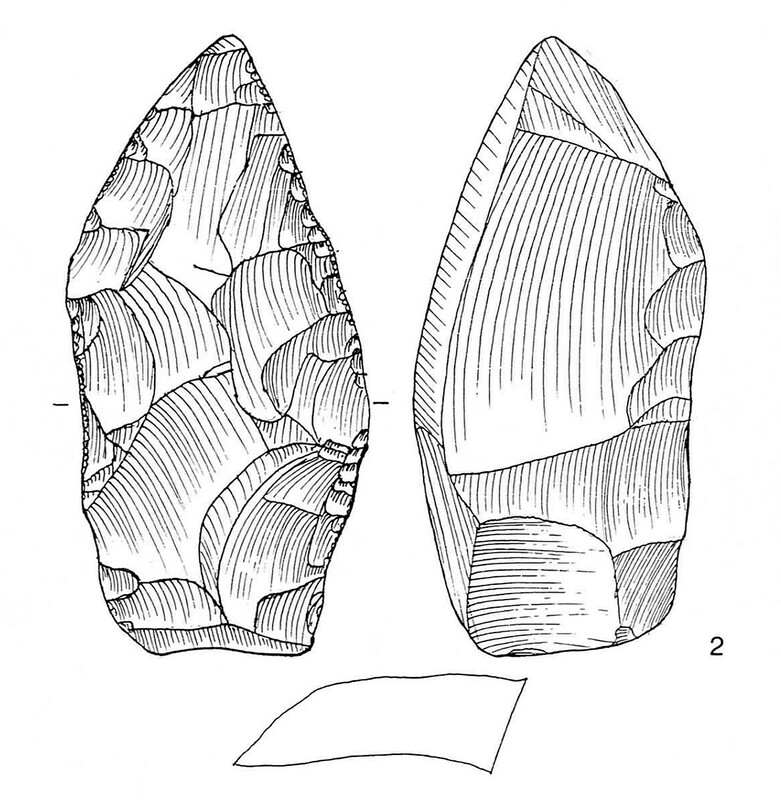 It is characterised by sturdy lithic flakes that were used for all tools, primarily awls (sticklar), scrapers and tanged points. 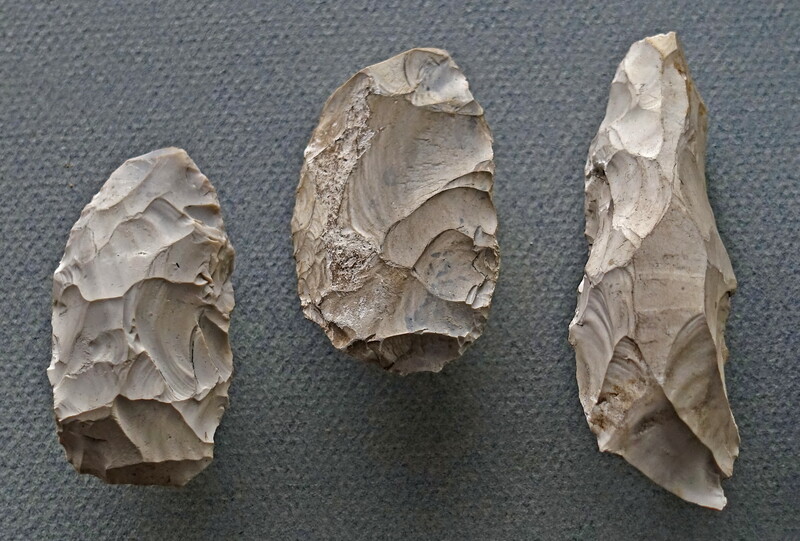 No stone axes have been found. 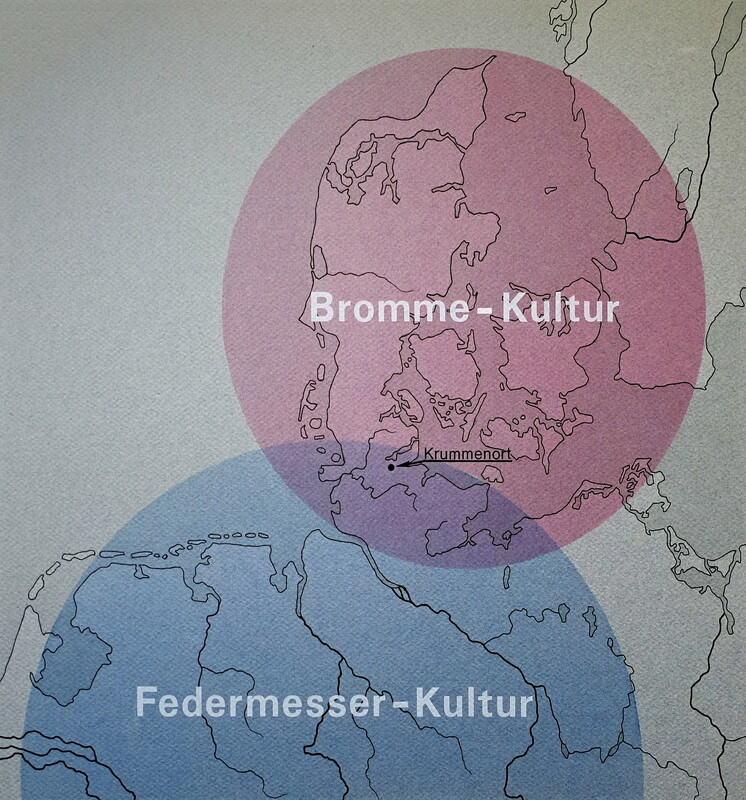 The Bromme culture and the Ahrensburg culture are so similar that it has been proposed that they should be classed as one and the same, under the label Lyngby culture, with the Bromme culture being recognised as an older northern branch of the same culture as the Ahrensburg culture. 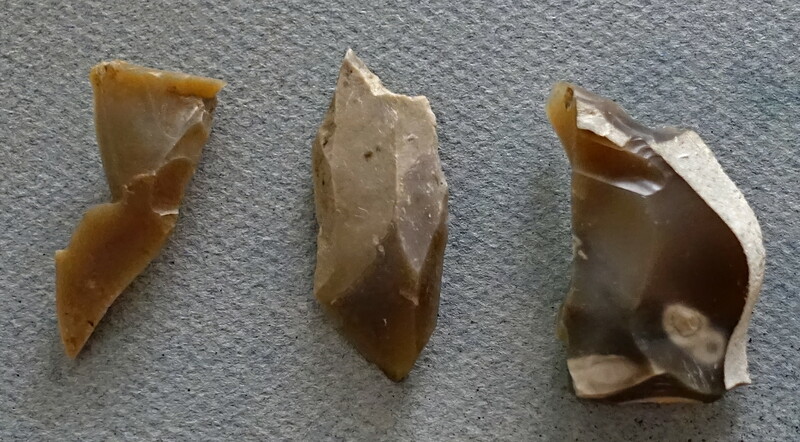 Bromme point, scraper, and burin. Bromme Point, and two Federmesser. (right) Bromme scrapers and burins. Left to right: Federmesser (quill knife), scraper, and burin. Locations of Ahrensburg sites in the Schleswig-Holstein area. Under the glaciers of the last ice age, meltwater carved out wide tunnels beneath the ice. Thus, although the glaciers eventually thawed completely, large blocks of ice, called dead ice, remained in low-lying areas under the sediments, and were protected from melting to some extent by these sediments. The Ahrensburger Tunnel valley had to be crossed by migrating reindeer herds, and thus became a favoured area for the hunters of the Hamburg and the Ahrensburger culture. The hunters' stations at Meiendorf and Stellmoor lay on the bank of a lake that had formed over the very slowly melting dead ice. In this lake, the bones and antlers of killed reindeer thrown into the lake have been well preserved because of the exclusion of air. With the inevitable complete melting of the dead ice, the layers sank by several metres. 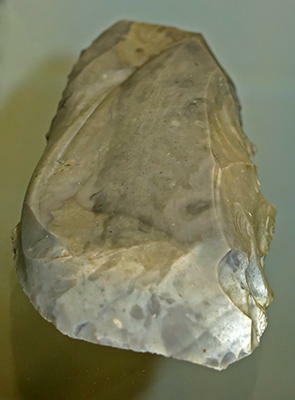 Thus the discovery remained preserved until today. Diorama of the hunting station at the tunnel valley. This photograph shows clearly the way that the reindeer remains were preserved by the anaerobic conditions in the lake, and the swift burial of the objects. Here we may also see the way that the originally horizontal deposits were tilted by the eventual melting of the dead ice, and the resultant collapse of the sediments into the void created. 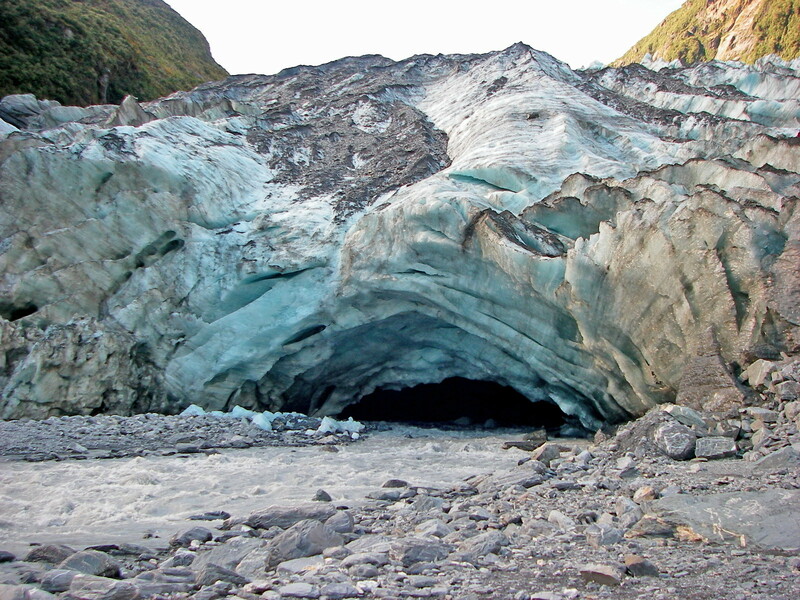 Meltwater pouring out from a tunnel beneath the Franz Josef Glacier in New Zealand. Note the grey colour of the water from the rock flour suspended in it, made when the glacier grinds across its bed. 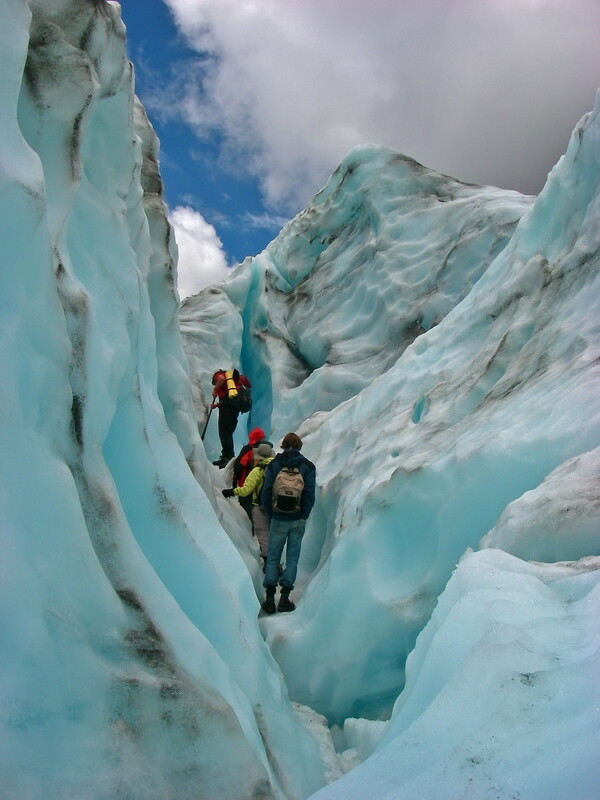 Left: Climbing dead ice in order to reach the active toe of the Fox Glacier in New Zealand. 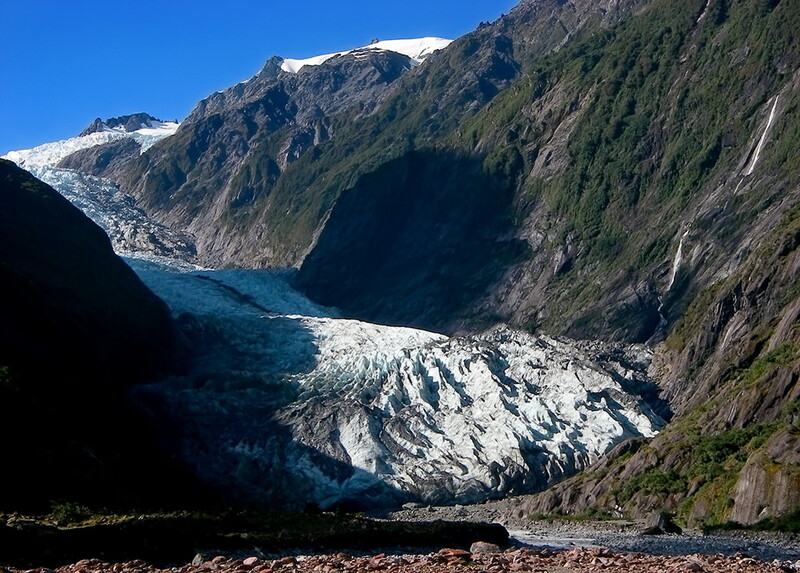 Right: The toe of Fox Glacier. At this time, 2007, the glacier was advancing, temporarily and paradoxically, because of global warming. Rising temperatures in the Tasman Sea to the west and the resulting increase in evaporation meant an increase of precipitation on the Southern Alps, which fell as snow, making the snow budget positive - the snow that fell more than replaced the ice that melted at the toe of the glacier. By the following year, 2008, melting again got the upper hand despite the increased snowfall, and the glacier is now in rapid retreat, such that views and climbs like this are no longer possible, except by helicopter, since the glacier has retreated far up the valley. 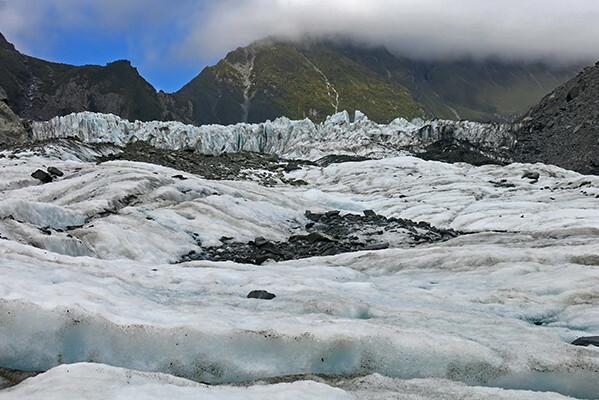 The active toe of the Fox Glacier shown here (the low wall of fissured ice in the background of this image, reduced to just a few metres in thickness, and much further back up the valley in the scant six years from when I saw it last, and by then but a sad remnant of its former glory) is still connected to the rest of the glacier. In the foreground of this image is dead ice, partially covered with sand, gravel, and rocks. 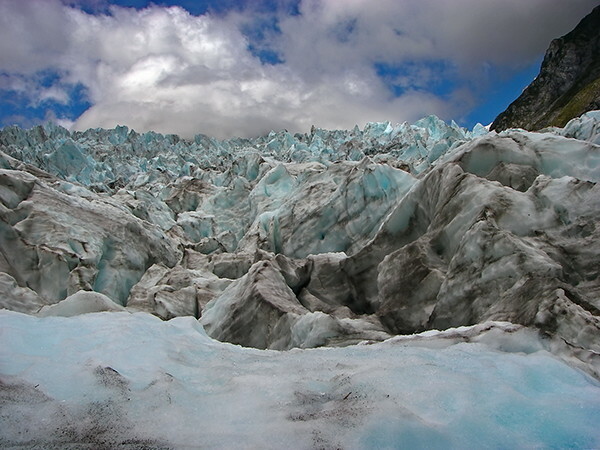 It is called dead ice, since it is no longer connected with the (moving) glacier proper, which is, in this case, like most others in the world, in retreat because of global warming. This shot, six years later, is taken a considerable distance further up the valley than the shots above, because of the retreat of the glacier. The guides predicted at the time that in five years there would be no such 'glacier walks' available, and this has come to pass. 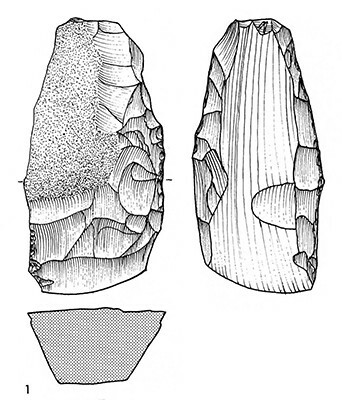 At the Stellmoor site, of the Ahrensburg culture, many pine arrow shafts were observed. They consisted of an approximately 80 cm long main shaft and a 15 cm long removable foreshaft. 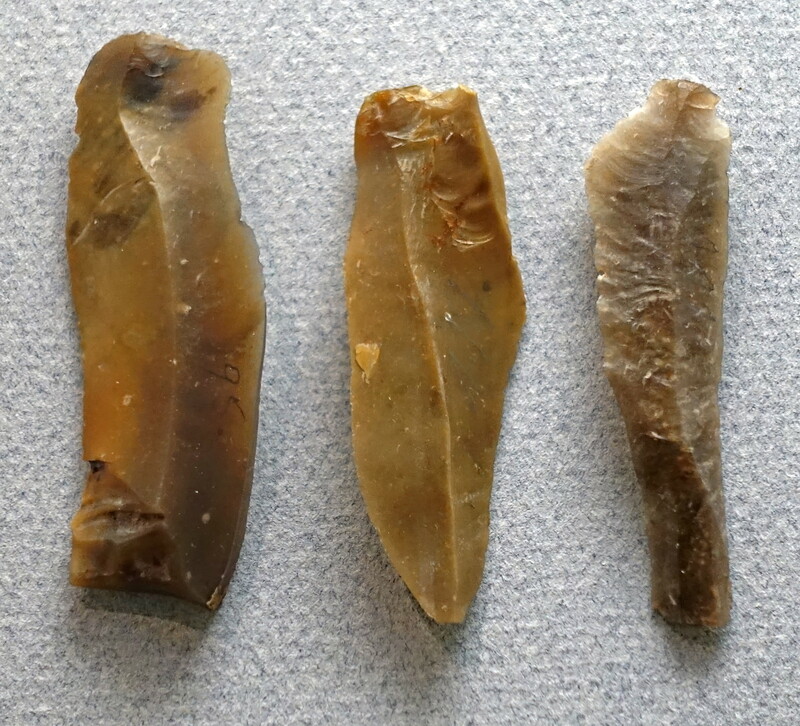 These finds are the first sure evidence in Europe for bow and arrow hunting. 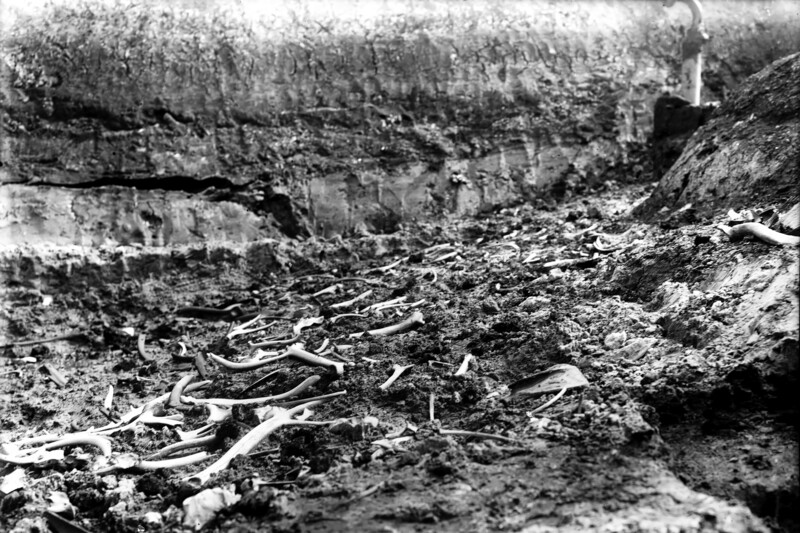 Among the wastes of the hunting stations at both Meiendorf and Stellmoor were found many skeletal remains of killed reindeer. 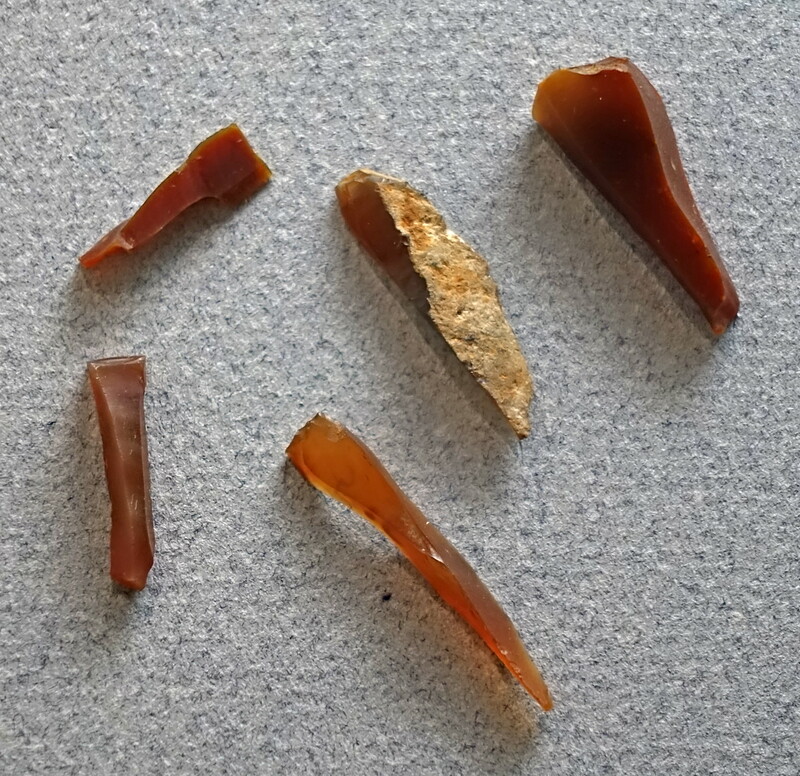 In some bones, the fragments of flint arrowheads were discovered. Stellmoor was a seasonal settlement inhabited primarily during October, and bones from 650 reindeer have been found there. The hunting tool was bow and arrow. From Stellmoor there are also well-preserved arrow shafts of pine intended for the culture's characteristic skaftunge (shaft tongue) arrowheads of flint. 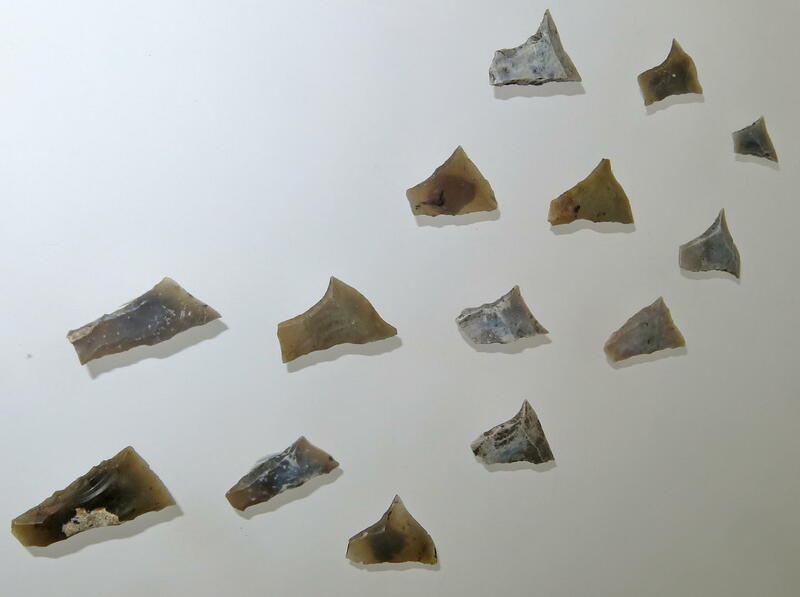 A number of intact reindeer skeletons, with arrowheads in the chest, has been found, and they were probably sacrifices to higher powers. 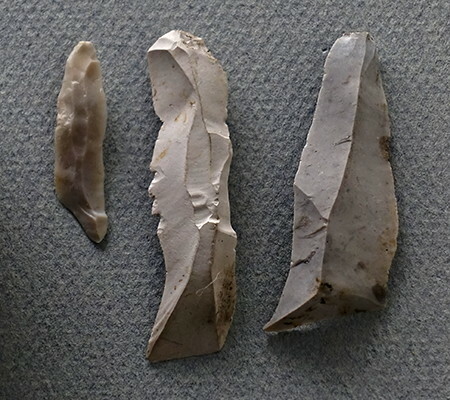 At the settlements, archaeologists have found circles of stone, which probably were the foundations of hide teepees. 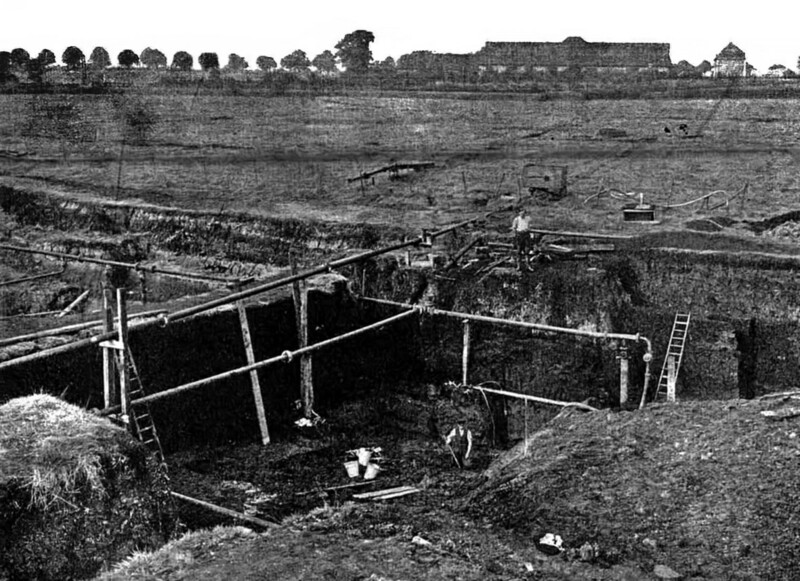 The site of Stellmoor during the excavation. Top right the excavator Alfred Rust, taking a photograph of progress with a large glass plate camera steadied by a tripod. These glass negative cameras were used up until quite recent times because of their lack of distortion of the negative and resulting print. 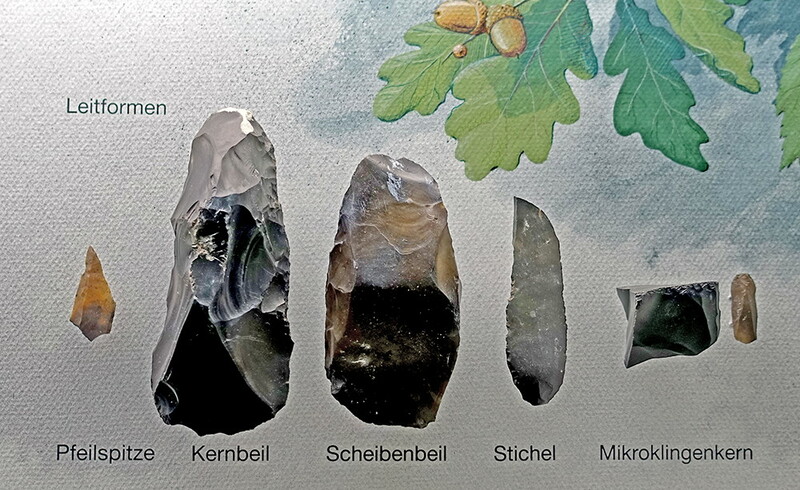 Stellmoor is an archaeological site of the late Palaeolithic near the Meiendorf area not far from Hamburg. 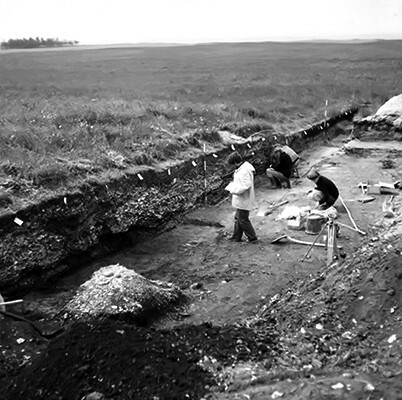 The archaeologist Alfred Rust carried out excavations there in a silted late ice age lake in the years 1934 to 1936. There were two cultural layers. 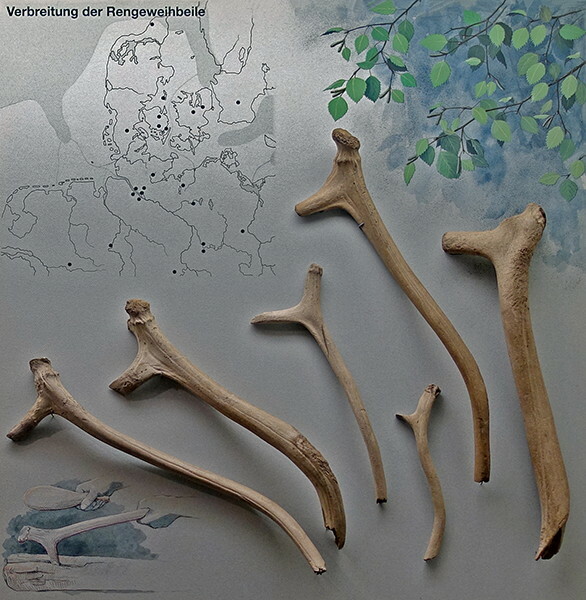 At a depth of 650 cm, artefacts of the Upper Palaeolithic Hamburg culture were discovered: stone implements , animal bones (especially from reindeer ) and reindeer antlers, as well as two reindeer weighted with stones. 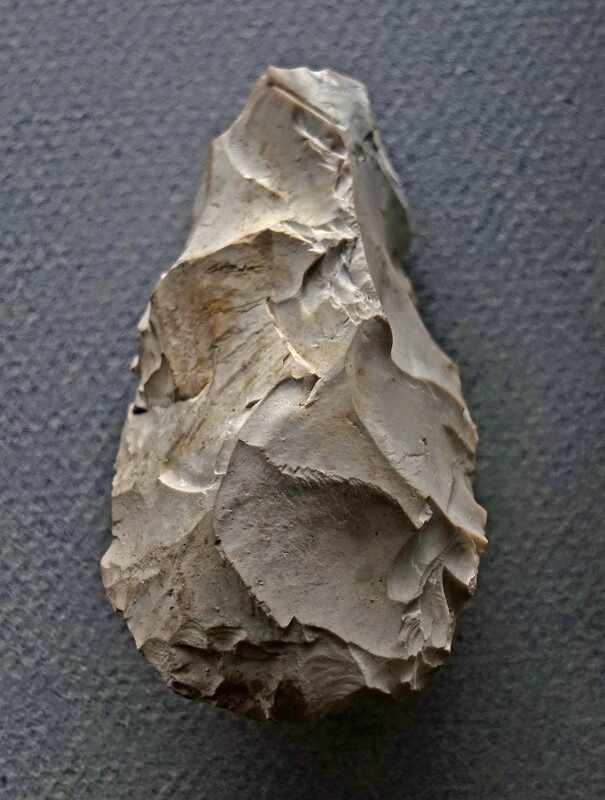 At a depth of 400 cm, there was a rich find with artefacts from the late Palaeolithic Ahrensburg culture. In addition to stone, bone and antler artefacts and wooden arrows, the remains of 650 reindeer were found. Twelve reindeer had been sacrificed. In addition, there was a cult object, which consisted of a two metres long pine wood pole, on which was mounted a reindeer skull with large antlers. This has been interpreted as a cult object. The typical tools are short, squat scrapers. 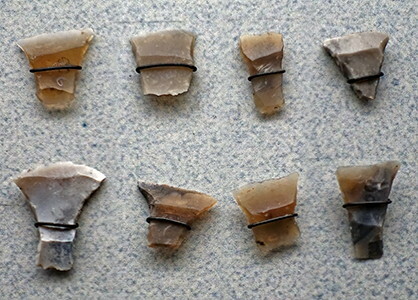 Awls, typical of the Hamburg culture, are missing entirely, but there were flint arrowheads. 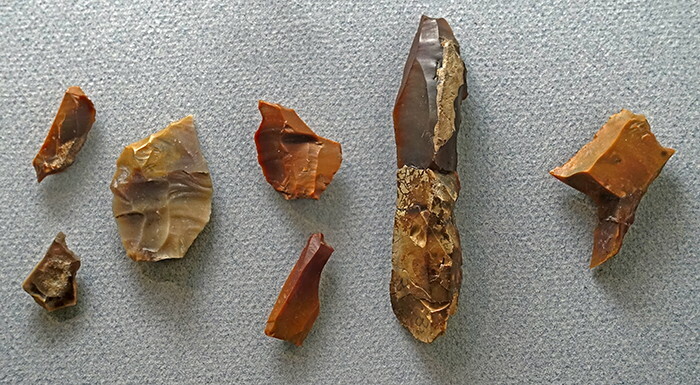 The antlers, wood and bones used for other tools were cut with burins and large, sharp blades. Using a large, sharp blade to cut an antler or bone into a useable size. 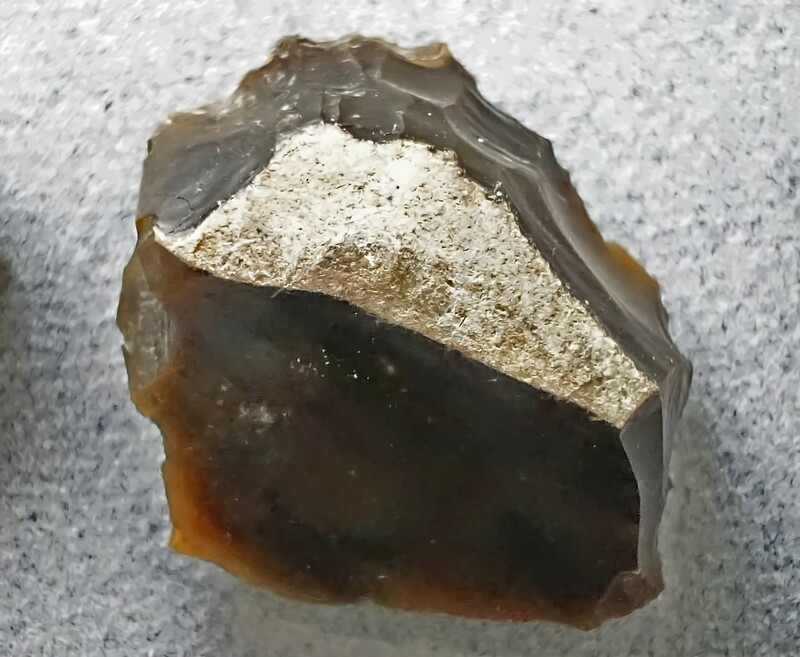 It is likely that the maker of the tool simply scored right around the outside of the antler, and snapped it at the score mark, since that is the fastest and easiest way to do it. Sharp knife on a large blade. End scrapers on blades, grattoirs. 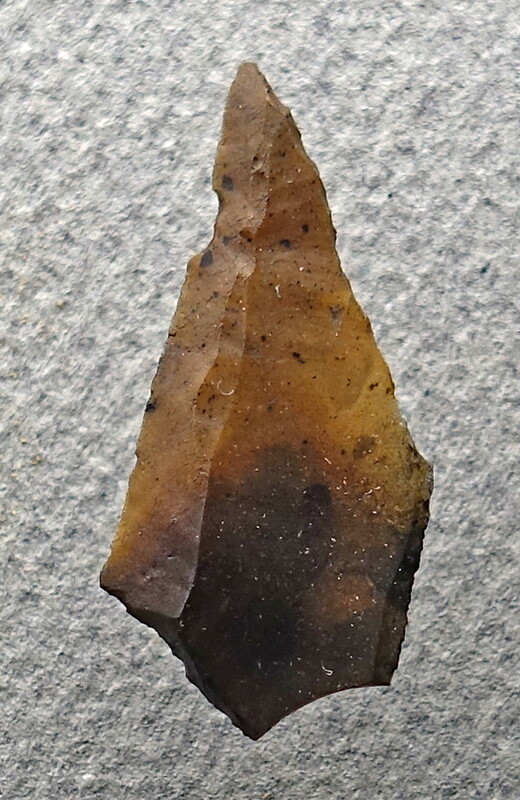 Skaftunge (shaft tongue) Ahrensburg culture arrowhead. Arrowheads of this type may be seen in the image above. An important characteristic of reindeer hunter communities is their high mobility. During the warmer months, they moved from the larger autumn and winter camps in small groups to the summer hunting grounds. 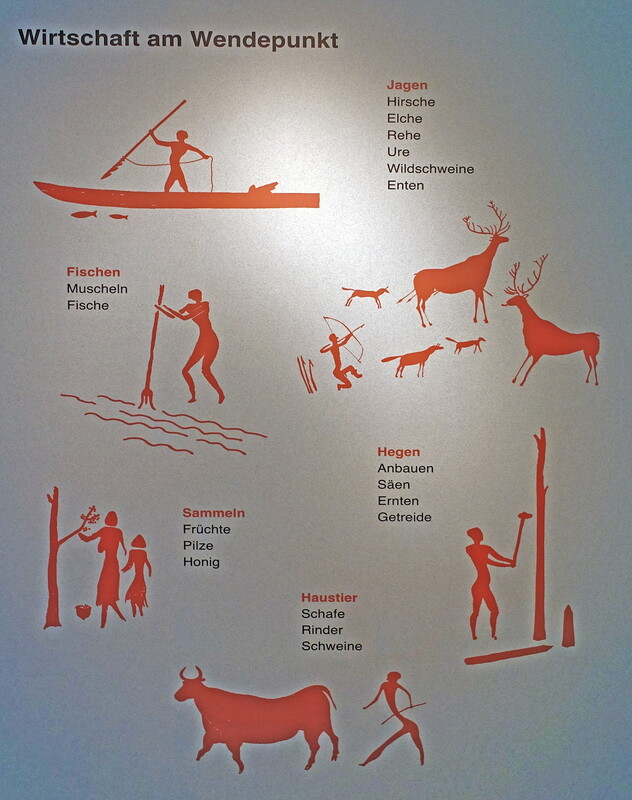 Here, besides reindeer, other game including fish and birds were hunted. 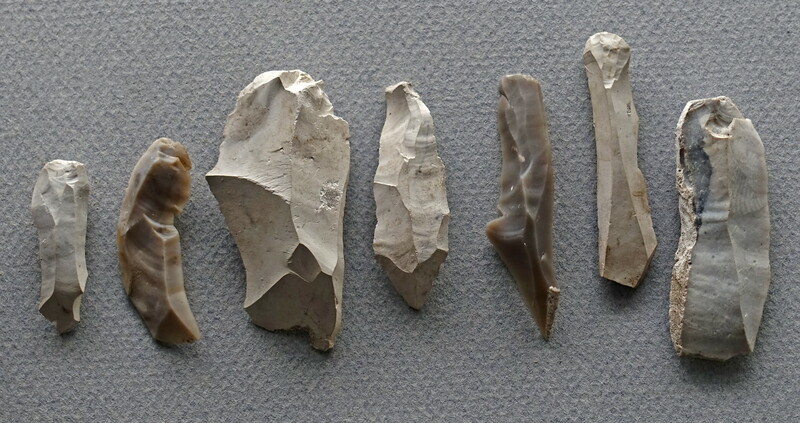 Perhaps the many scattered sites outside the Ahrensburg Tunnel Valley were such short-lived hunting stations. Flint debitage and the flint tools of a find site often do not match. Apparently not all the necessary equipment of the reindeer hunters was made locally, but a small basic assortment was brought along with them ( including the arrow shaft smoother shown here, essential for replacing broken arrow shafts - Don ). 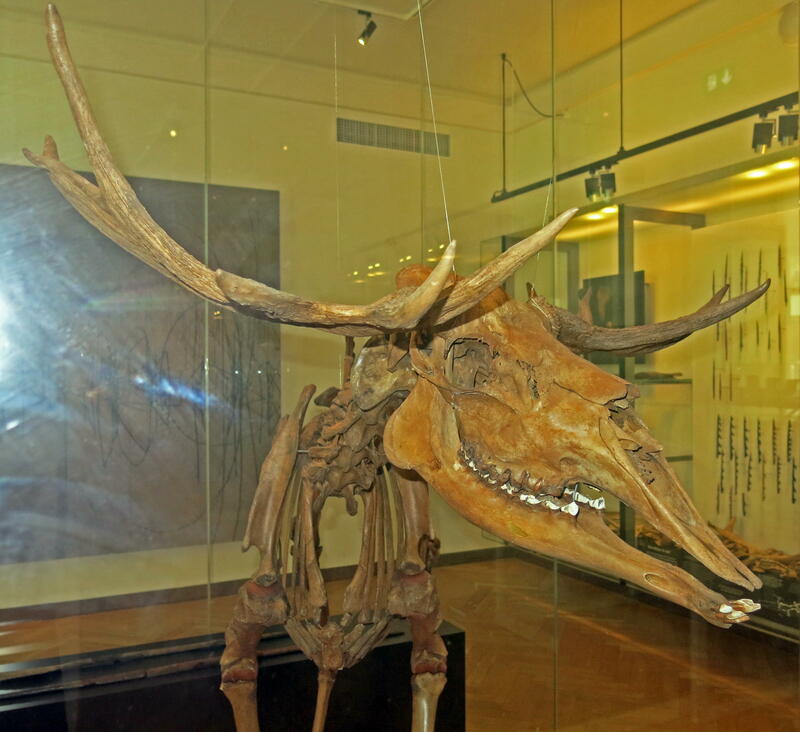 The favourable conservation conditions at Stellmoor have preserved over 20 000 bones and antlers. 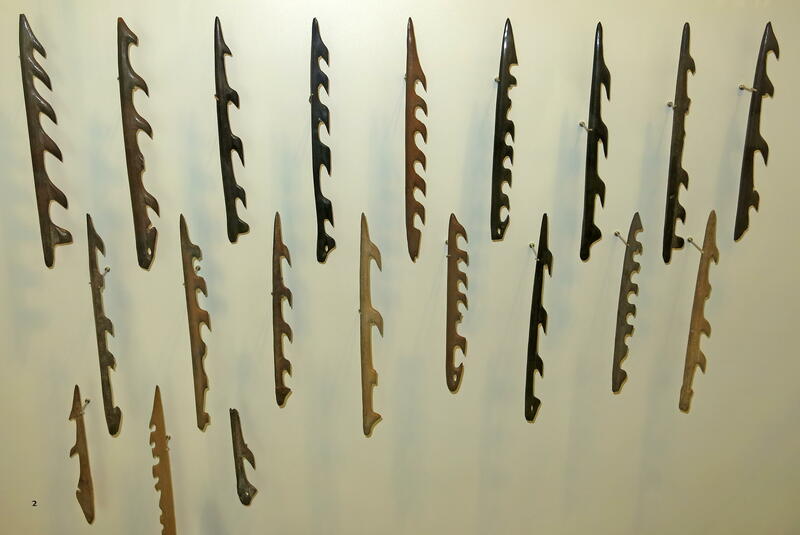 Among them is a large number of hatchets from reindeer antlers, which are suitable both as hunting weapons and for woodworking. 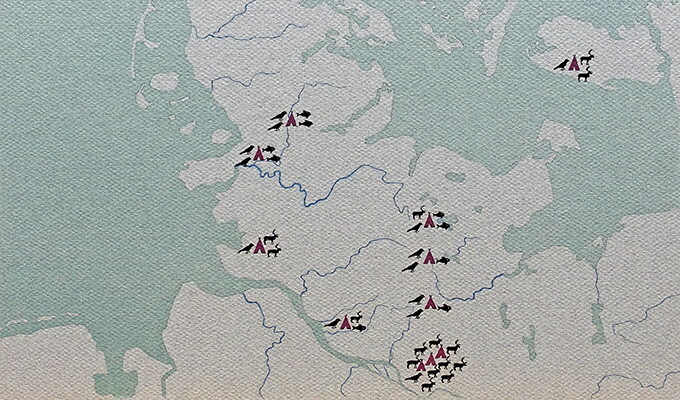 The map shows the distribution of reindeer antlers used in this way. 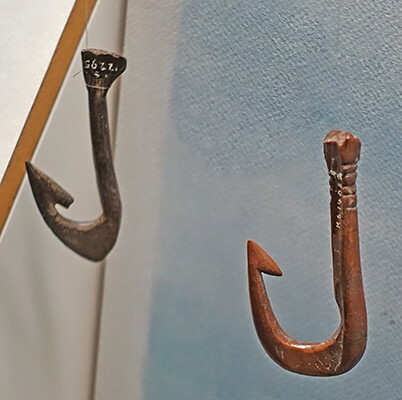 Harpoon head, method of attachment. When attached to a string, and whirled around in the air, this bone produces a loud, piercing sound. 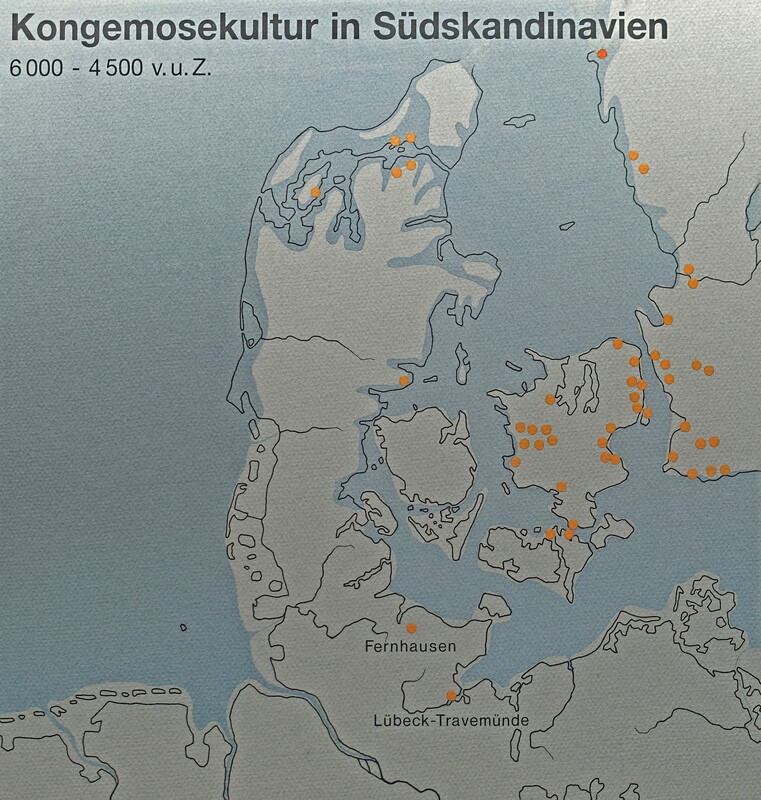 Southern Scandinavian and Northern German Maglemose sites. Preboreal sites: 1. 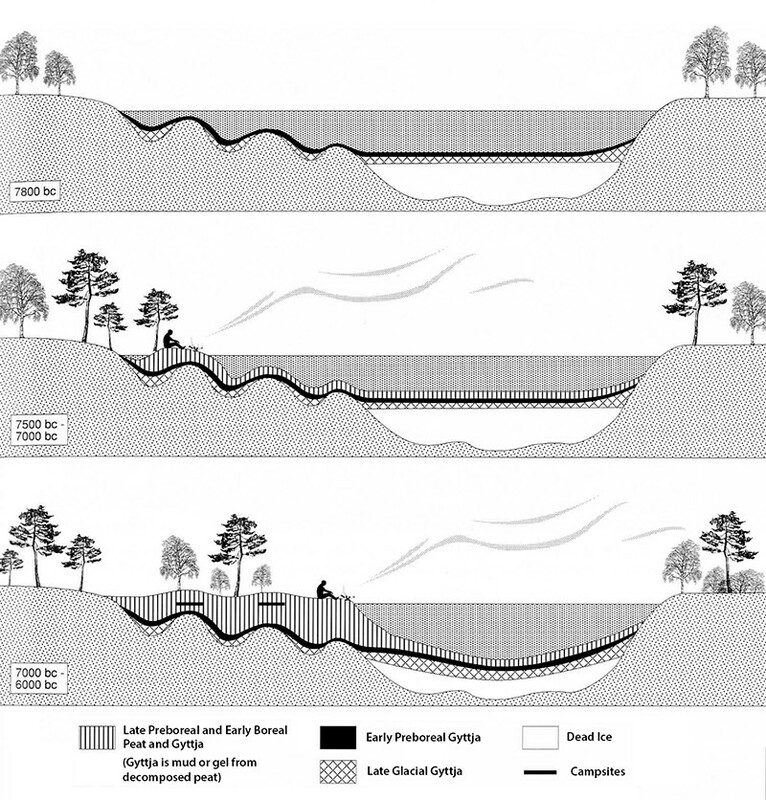 Lundby kettle hole lake deposits (Hansen et al. 2004; Jessen et al. 2015); 2. 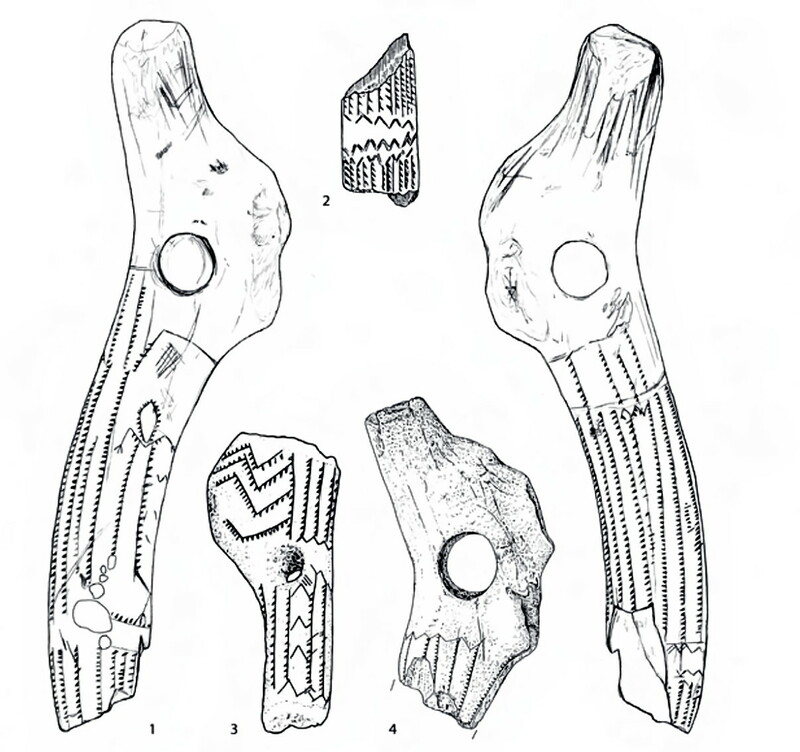 Skottemarke elk deposits (Møhl 1980; Sørensen 1980; Fischer 1996); 3. 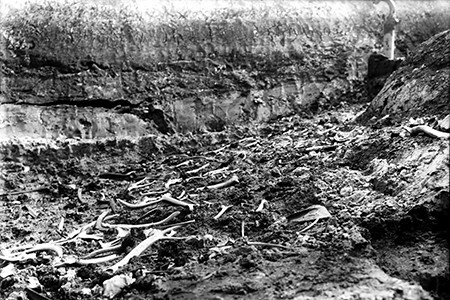 Favrbo elk deposits (Møhl 1980); 4. 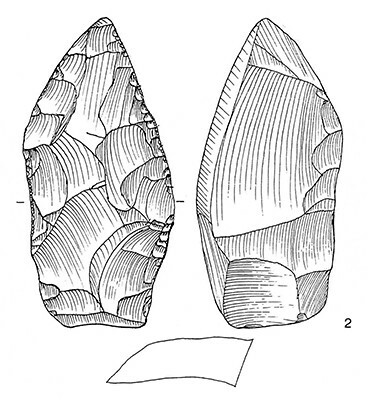 Vig aurochs deposit (Hartz and Winge 1906); 5. Nørregaard VI (Sørensen and Sternke 2004); 6. Årup contexts 1, 2 and 3 (Karsten and Nilsson 2006); 7. Barmosen I (Johansson 1990); 8. Bjergby Enge (Andersen 1980); 9. Klosterlund (Mathiassen 1937; Petersen 1966); 10. Gl. Ullerød (Jensen 2002); 11. Draved 611, 604s and 332 (Sobotta 1991); 12. Henninge boställe (Althin 1954); 13. Hasbjerg II (Johansson 1990); 14. Flaadet (Skaarup 1979); 15. Mullerup; 16. Sværdborg; 17. Holmegaard; 18. Åmosen; 19. Pinnberg 7 (Rust 1958a); 20. Duvensee; 21. Hohen Viecheln (Schuldt 1961); 22. 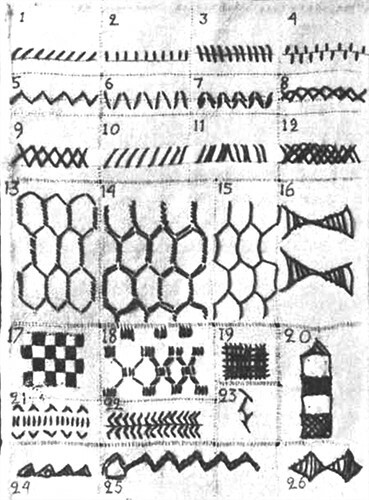 Rothenklempenow 17 (Schacht and Bogen 2001); 23. 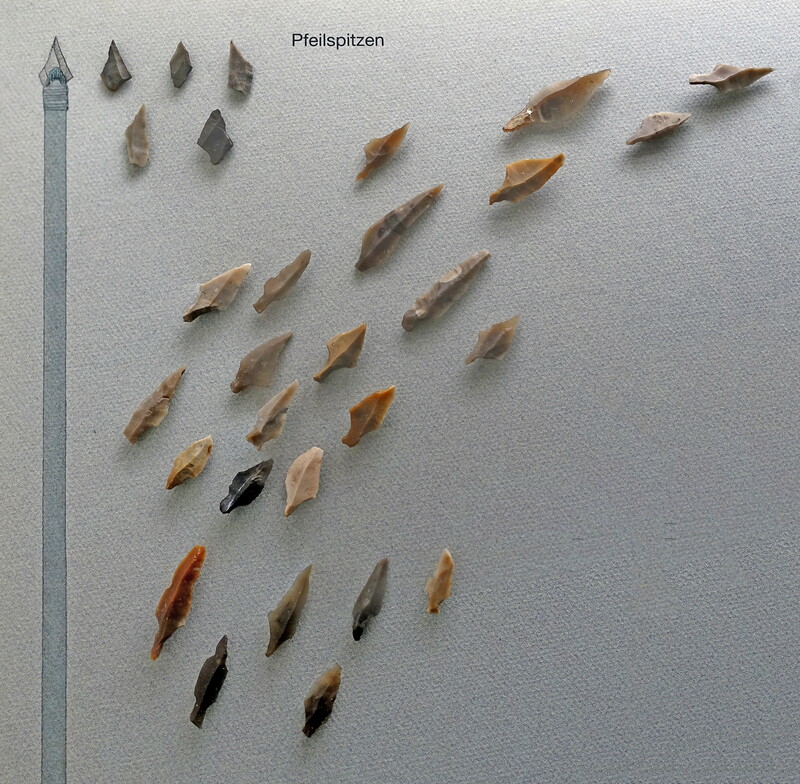 Potsdam-Schlaatz (Benecke et al. 2002); 24. Friesack (Gramsch 2002); 25. Bedburg Königshoven (Street 1989); 26. Mönchengladbach-Geneicken (Heinen 2014). The map illustrates the land masses at the Pleistocene/Holocene transition (compiled by Grimm 2009 after Björck 1995a; Boulton et al. 2001; Lundqvist and Wohlfahrt 2001; Weaver et al. 2003; Clarke et al. 2004; Brooks 2006b; Ivy-Ochs et al. 2006; with further additions from Woldstedt 1956; Björck 1995b; Björck 1996; Zahn 1996; Coope et al. 1998, figure 4H; Kobusiewicz 1999, 190; Gaffney et al. 2007, 3–7 and 71) (Copyright Daniel Groß, CC BY-NC 4.0). 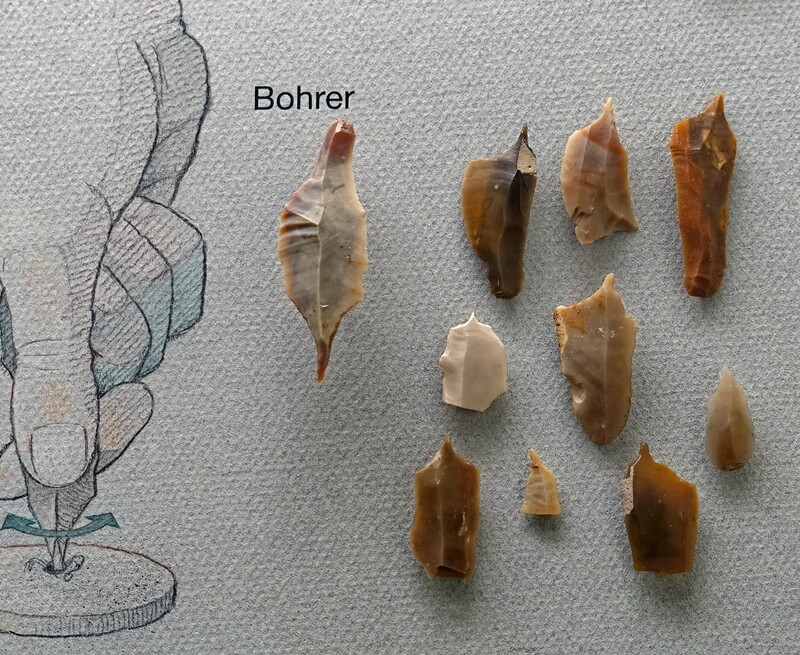 Before the Maglemose culture was defined, Stone Age archaeology was already well established in Southern Scandinavia, arising from the discovery of coastal shell middens which were investigated by the ‘Kitchen midden commissions’ and dated to the Ertebølle culture (Late Mesolithic). However, in 1900 a new type of site was discovered by the National Museum trained botanist and archaeologist Georg Frederik Ludvig Sarauw (1862–1928). On the 8th of June 1900 he was sent by the National Museum to the bog of Mullerup in Western Zealand. Here a local teacher (M. J. Mathiassen) had reported unusual, well-preserved finds of ancient bones, charcoal and lithics from the bog during peat cutting. 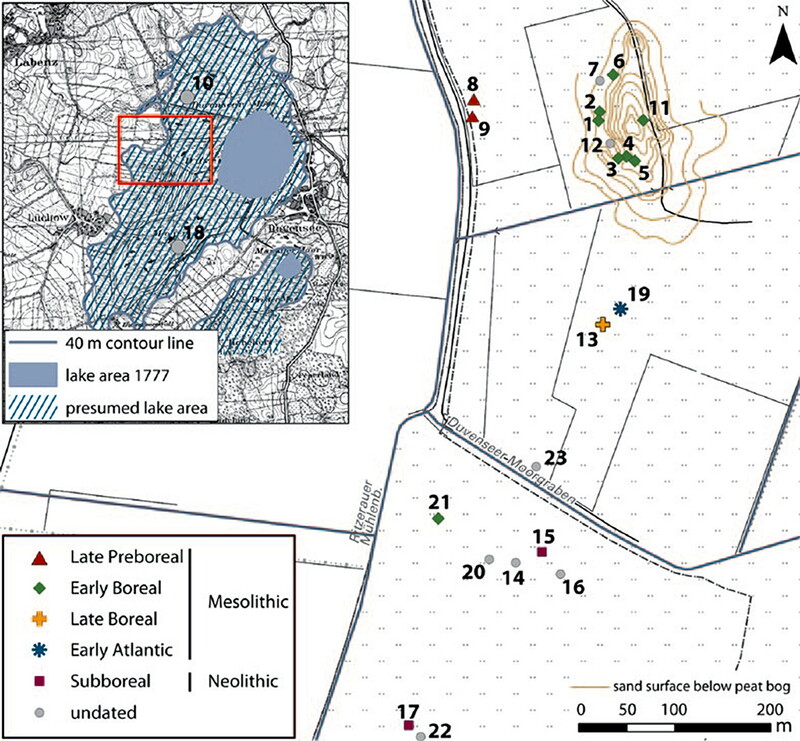 Sarauw immediately undertook an excavation to an unusually high quality standard for the time, examining the geological layers and botany within the bog as well as the spatial distribution of the artefacts and their stratigraphic position. 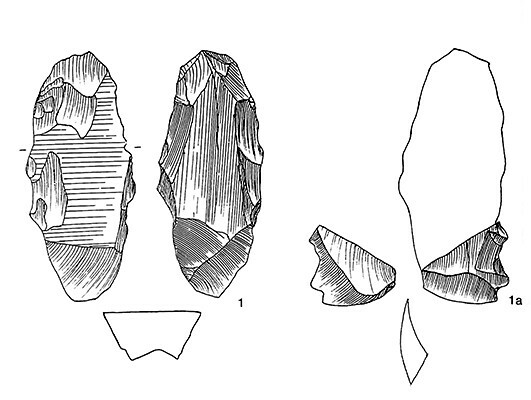 In 1903 he published a thorough account of this excavation and coined the term 'Maglemose'. 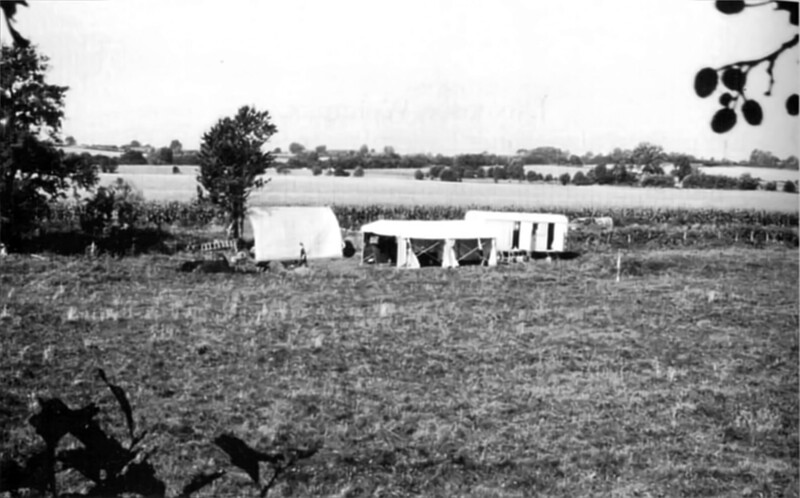 He argued that what he had found was not an Ertebølle cultural site but something older: an inland culture that lived within large bogs and had an economy based on aquatic and terrestrial resources (Sarauw 1903). The culture was first called 'Mullerup', after the nearby village; however, as the local bog was called 'Maglemose' the culture was finally named after the bog. In fact, 'Maglemose' means 'large bog' in Danish and there are many Maglemose place names all over Southern Scandinavia. 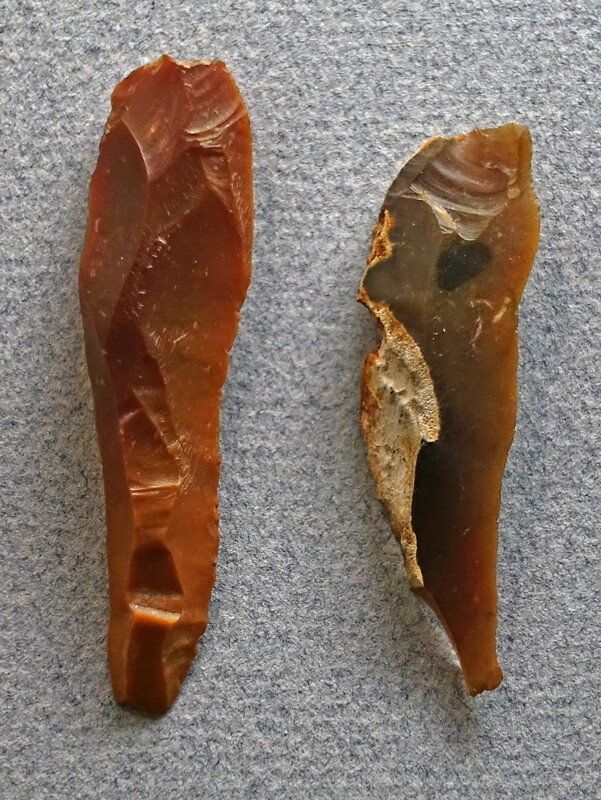 Thus, in the Danish language the Maglemose culture simply means the Stone Age culture found in large bogs. 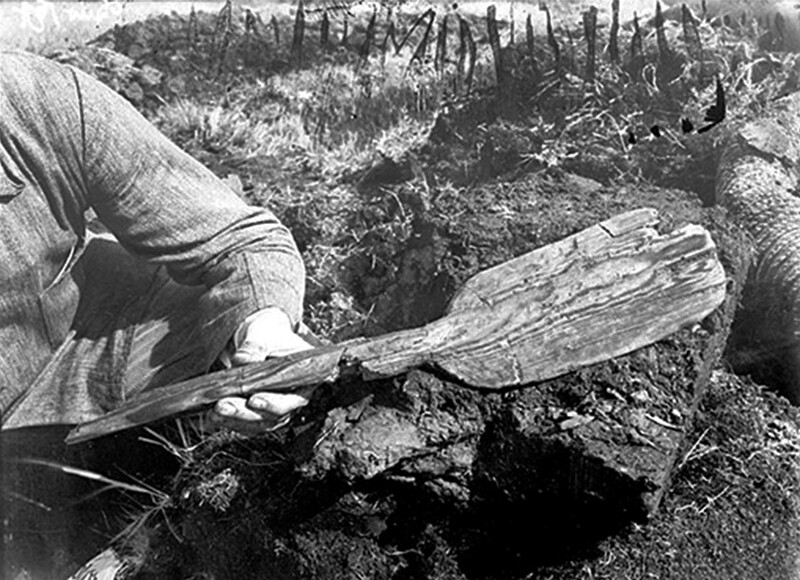 In 1904 a new site was found in the Maglemose bog of Mullerup just north of the first one. This was investigated in the same year and then again in 1915. 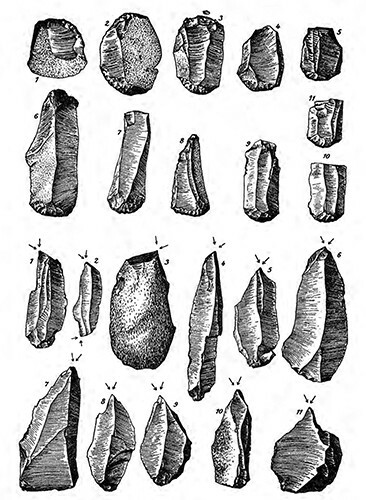 Elk antler axes, wedges and chisels. 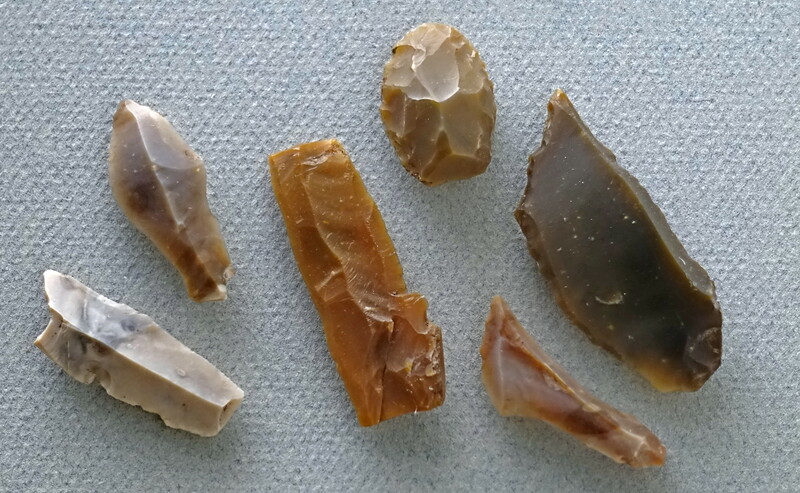 Found during peat-digging at various bogs. 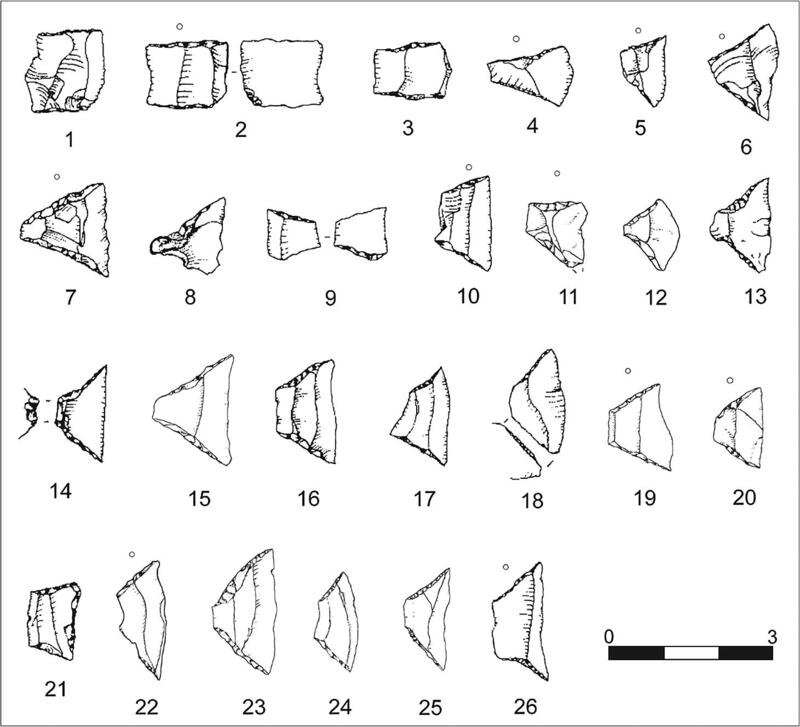 Early Maglemose Culture, 10 700 - 9 000 BP. 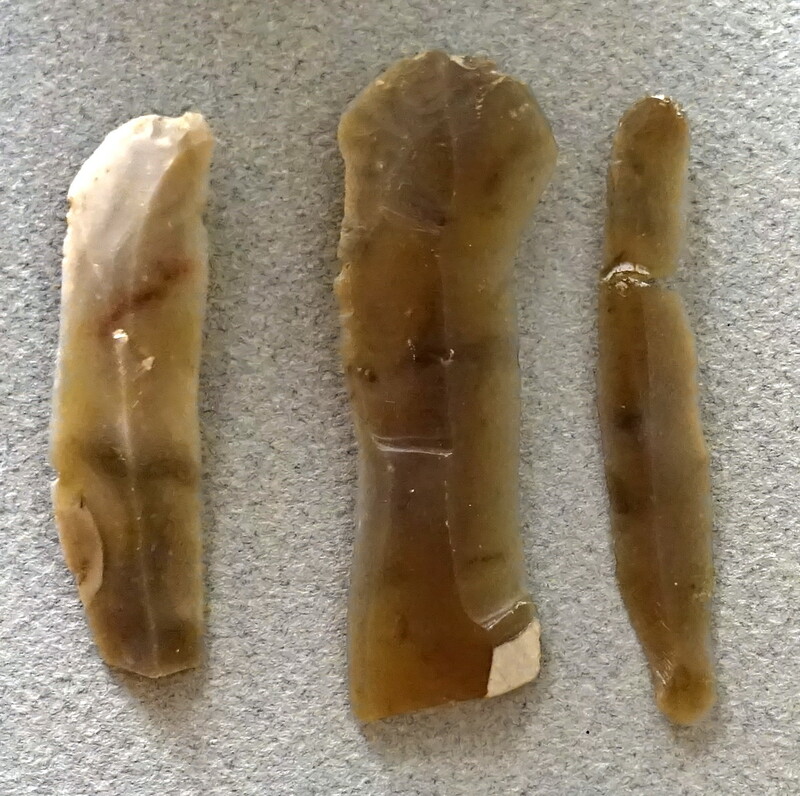 Elk antler wedges from the same display above. 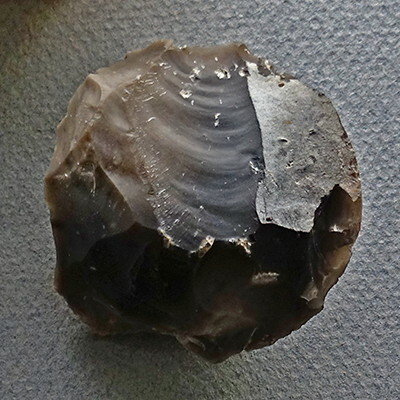 Found during peat-digging at various bogs. 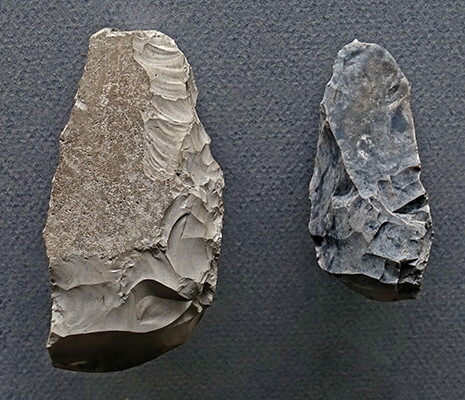 The tool on the left, apparently a facsimile, appears to be either an adze, or a handled wedge for splitting timber, made from moose /elk antler. 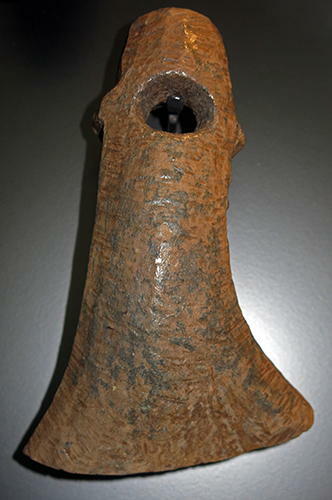 Note that the maker has carefully put the hole for the handle at a thickening in the antler, to provide more strength at the junction, where much stress would be applied. The tool on the right is an adze, and may be original. A wounded elk (moose) sank exhausted to the bottom of a lake at Tåderup on Falster 8 700 years ago. In 1922 the skeleton was found in a peat bog. Among the bones was a broken bone point that may have been used in the hunt. Later a harpoon was found in the same peat bog. Several kinds of tools and weapons were made from the large animals' antlers and slender bones. 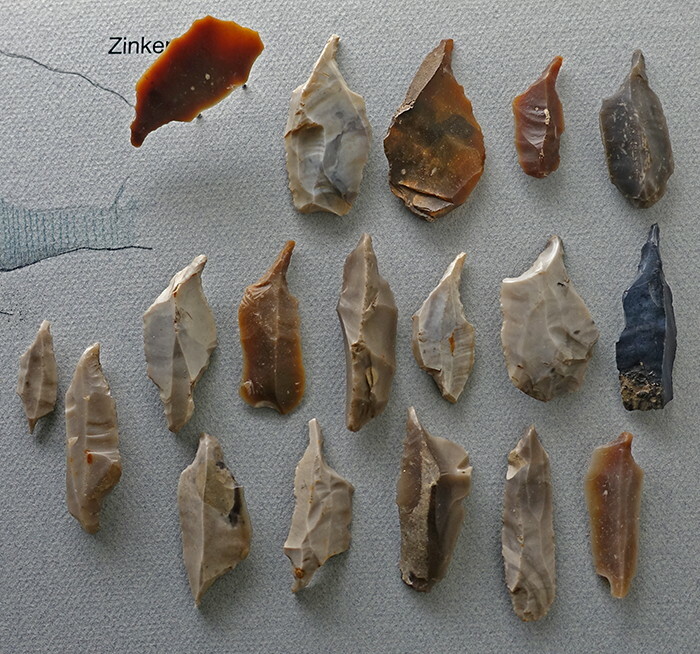 The hunting was so intensive that the species was wiped out in Zealand ca 8500 years ago. However the elk still played an important role in the hunters' mythology. Tooth beads, and tools of elk antler and bone were valuable barter objects. Source and text: Københavns (Copenhagen) Museum, National Museum of Denmark. 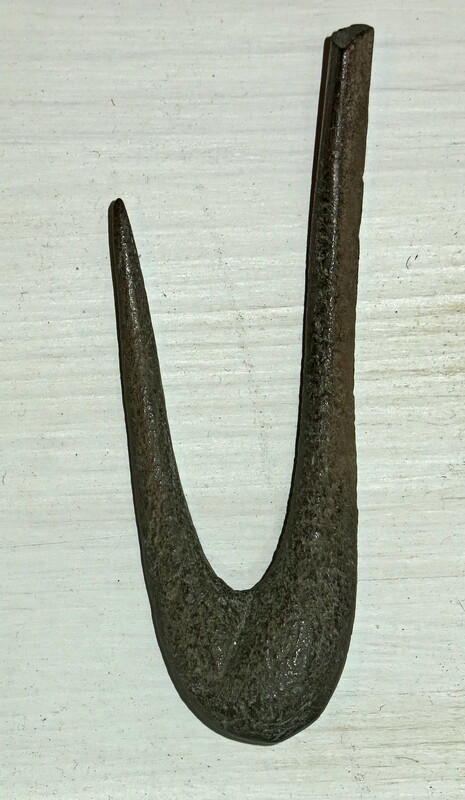 Bone harpoon, found near the elk skeleton. Tåderup, Falster, ca 8 700 BP. 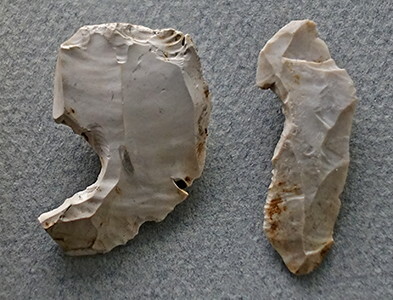 Bone point, broken, found among the elk's remains. Tåderup, Falster, ca 8 700 BP. Source and text: Apparently facsimiles, Københavns (Copenhagen) Museum, National Museum of Denmark, on loan from Lolland-Falsters Stiftsmuseum. 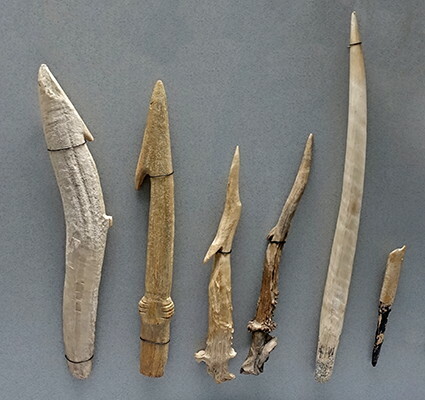 Harpoons made of elk or red deer bone/antler. Found during peat-digging in various bogs. 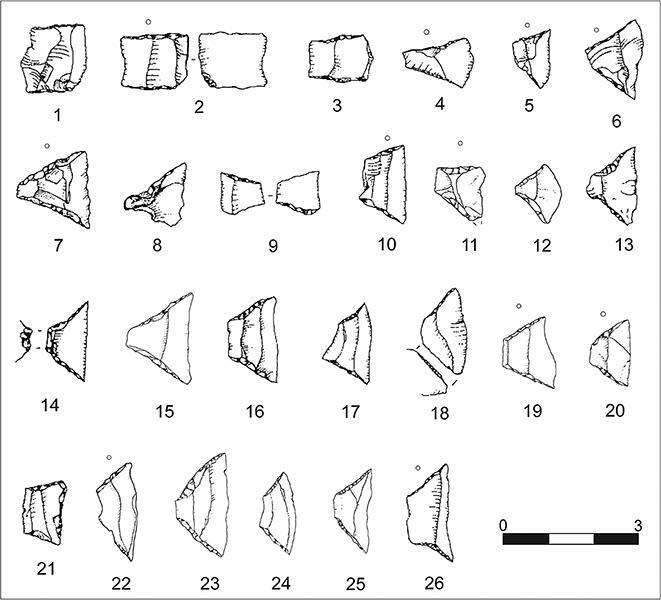 Maglemose Culture, 10 700 - 8 500 BP. Source and text: Apparently originals, Københavns (Copenhagen) Museum, National Museum of Denmark. 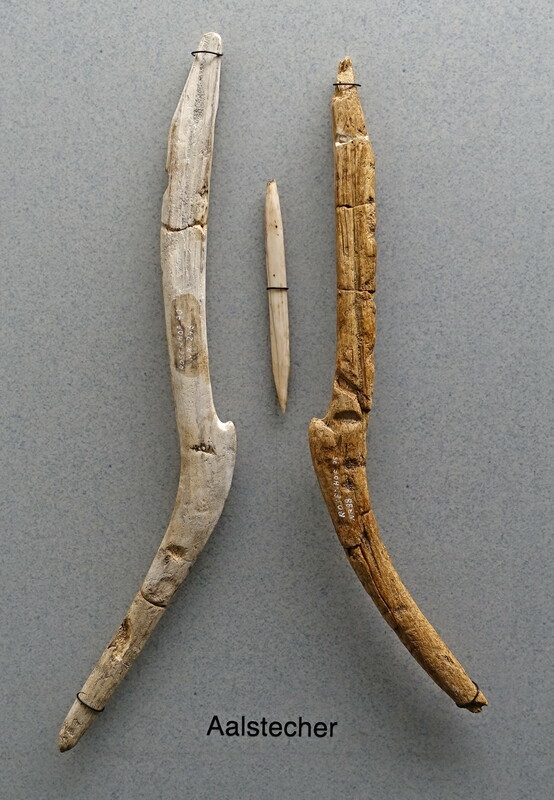 Fish spears of bone from an elk-hunting site at Skottemarke, Lolland. Early Maglemose Culture, 10 700 BP. Source and text: Originals, Københavns (Copenhagen) Museum, National Museum of Denmark. 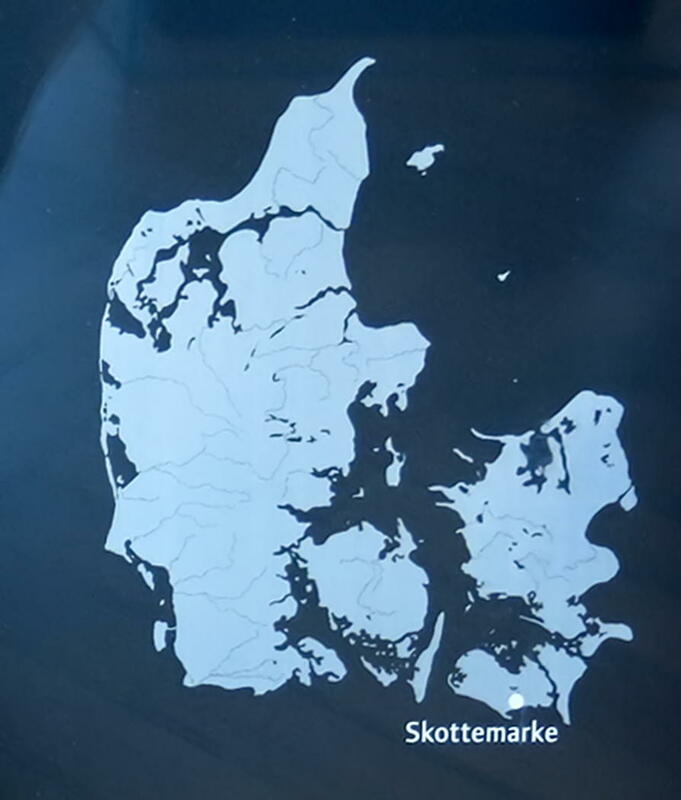 Map showing the position of Skottemarke. Source and text: Display, Københavns (Copenhagen) Museum, National Museum of Denmark. 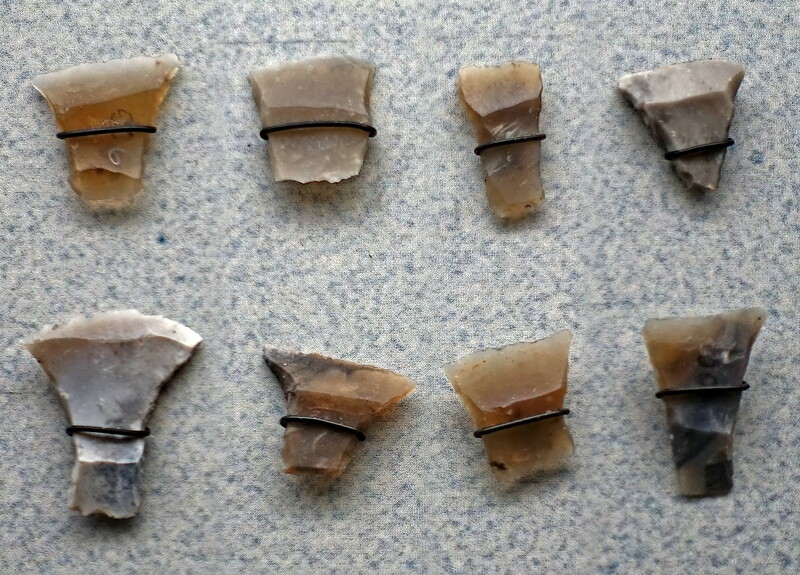 Flint axes from an elk-hunting site at Skottemarke, Lolland. 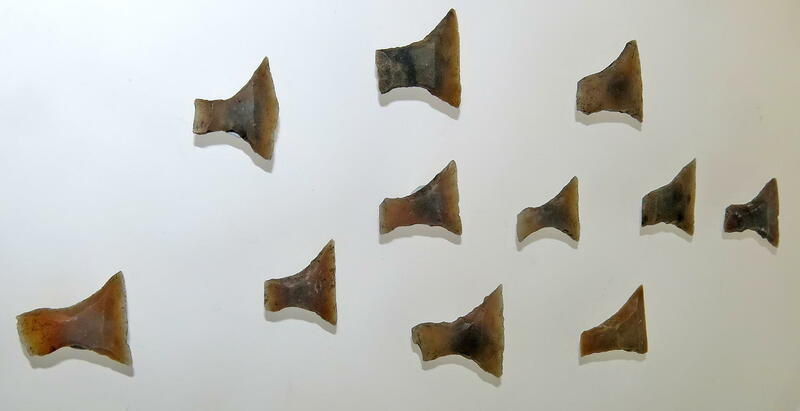 Serrated bone points, thought to be used on fish in particular. 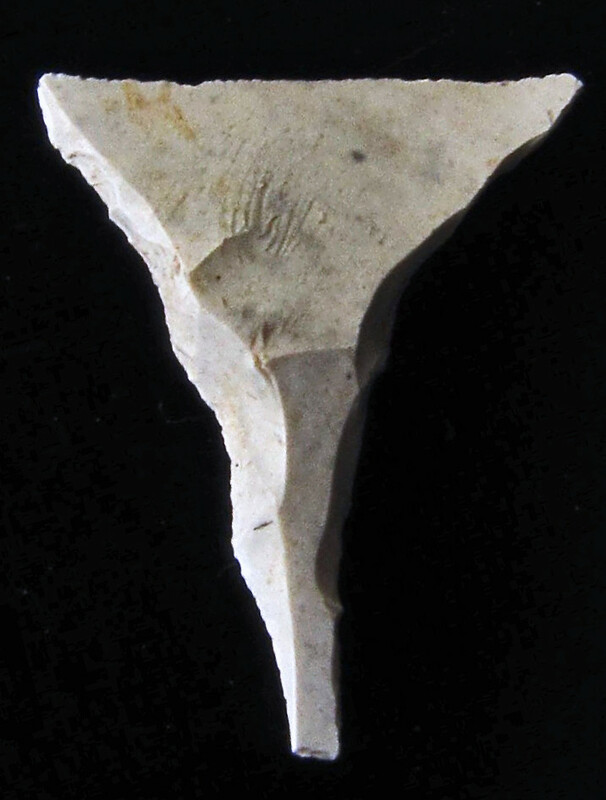 Serrated bone point dredged from the Dogger Bank, of the same type as those above. In the early and late Ice age Northwestern Europe formed one coherent landmass. Sea level was more than 50 metres lower than today. As the climate warmed, the ice melted and flooded what is now the North and the Baltic Sea. Schleswig-Holstein gradually assumed its present form. The people of the Mesolithic hunted, fished, and collected according to the season. Preferred settlements were the banks of rivers and lakes, as well as islands in the middle of larger bodies of water. When the Maglemosian culture flourished, sea levels were much lower than now and what is now mainland Europe and Scandinavia were linked with Britain. The cultural period overlaps the end of the last ice age, when the ice retreated and the glaciers melted. 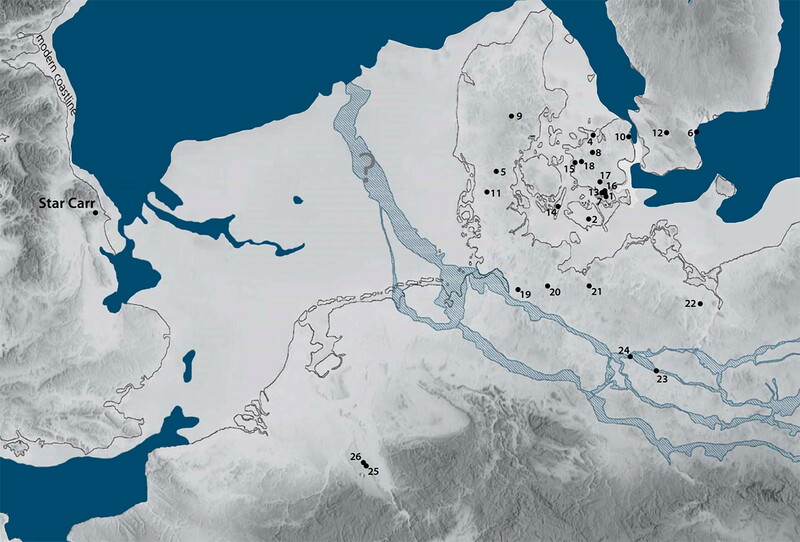 It was a long process and sea levels in Northern Europe did not reach current levels until almost 8000 BP, by which time they had inundated large territories previously inhabited by Maglemosian people. Therefore, there is hope that the emerging discipline of underwater archaeology may reveal interesting finds related to the Maglemosian culture in the future. 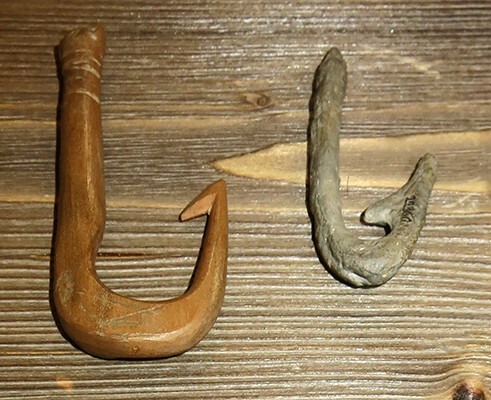 Bone fishing hooks, from Schinkel, Kr. 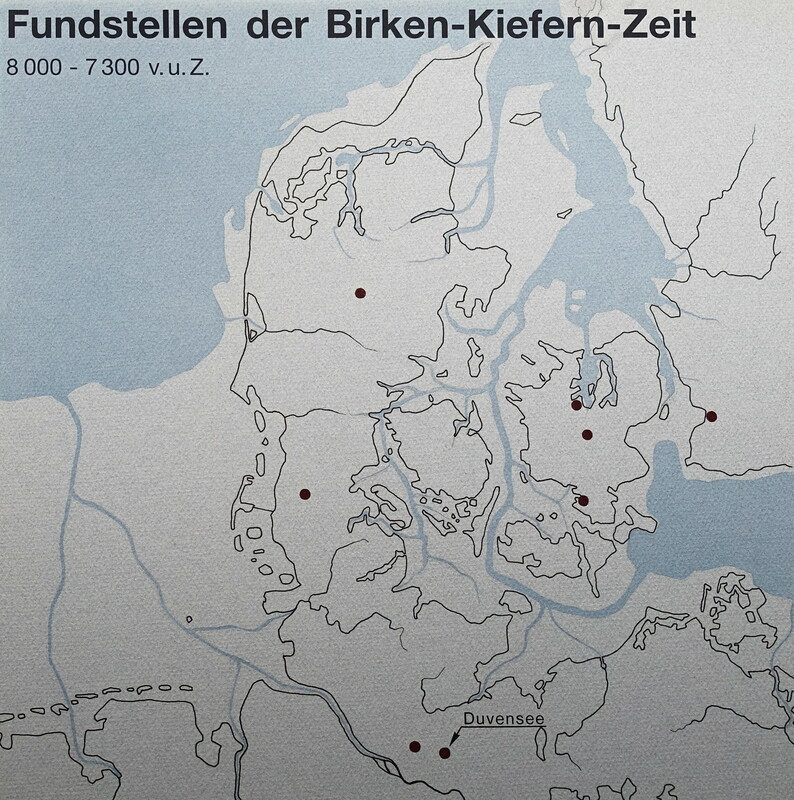 Rendsburg-Eckernförde, and Kleinsolt, Kr. Schleswig-Flensburg. 10 000 BP - 7 000 BP. On loan from the Staatliche Museen zu Berlin, Museum für Vor- und Frühgeschichte. 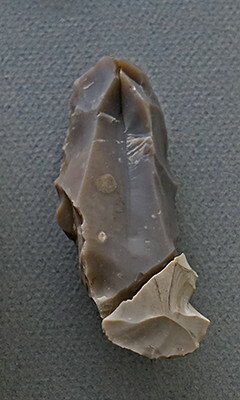 (below) Blunt needle used for threading, made of antler. 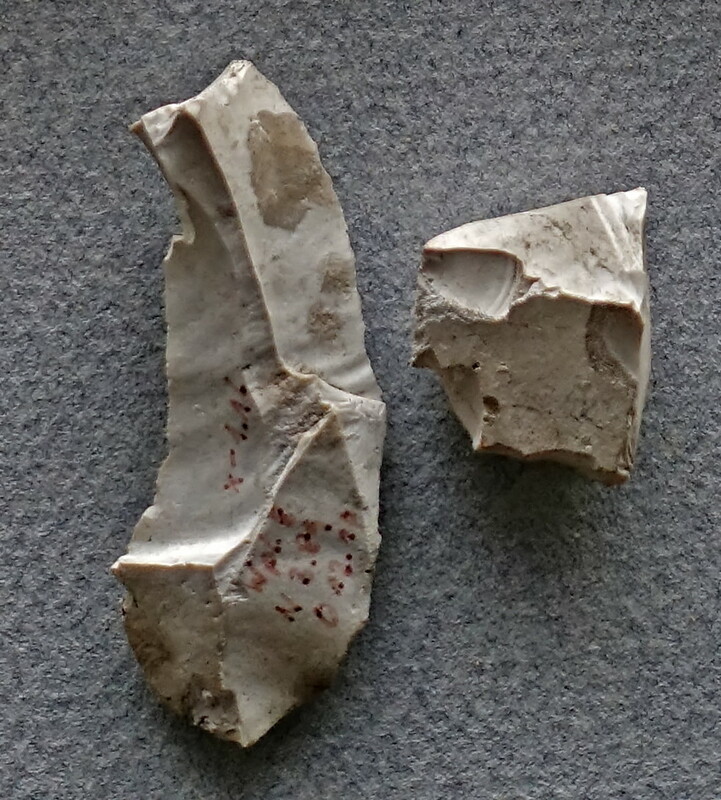 Decorated pieces of bone and antler, and a piece of a decorated scoop. 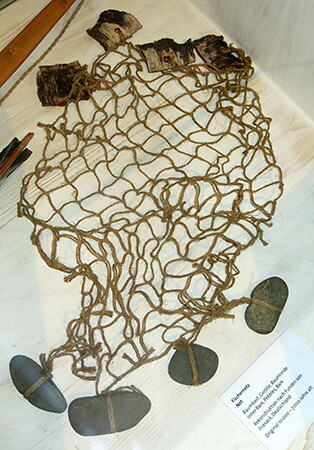 Fishing net, 10 000 BP - 7 000 BP. 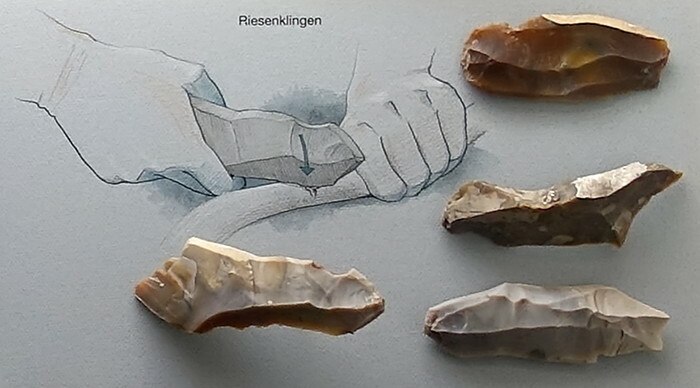 Reconstruction from a find in Friesack, Germany. 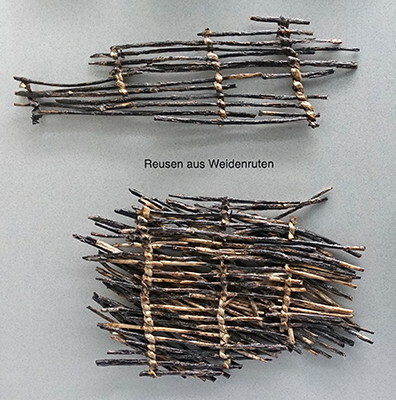 Materials: bast (inner bark fibre), outer bark, pebbles. 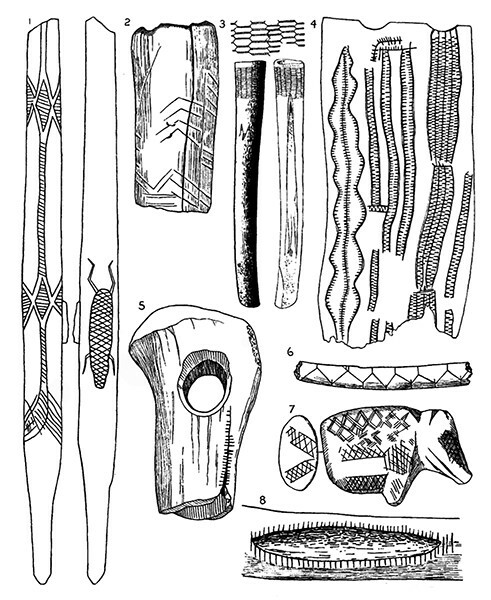 Typical designs for engravings on bone and antler by the Maglemose Culture. These have been described by Hultén (1939) as being based on the patterns formed when stitching and repairing leather garments. 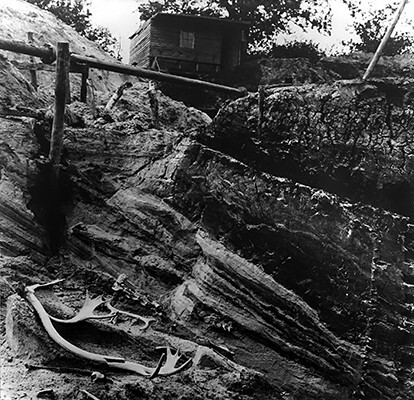 ( Here, Hultén (1939) posits that the engraved designs on Maglemose bones and antlers were representations of the already existing patterns on clothing, where seams and stitching were used to join and strengthen leather garments. Modern embroidery abounds with more or less stylised naturalistic motifs, which were quite unknown to the Maglemose people. This allowed only the seam to be a suitable reinforcement of the hide. This reinforcement effect is further increased by the fact that the front and back side patterns must not be congruent, but alternating, which often characterises these motifs. (Compare below, however, about some different designs of the chess pattern!) Reinforcement of the hide was so much more necessary, as this in itself must have been very fragile because of the imperfect preparation methods. Probably they tried to get it soft only by scraping and chewing. Possibly, however, the Inuit urine method was also used, in which case the lack of earthenware was remedied by the use of hollowed-out tree trunks. The findings of oars both in Duvensee and Holmegaard show that they had boats, and adzes, which were suitable for carving out tree trunks, especially if the wood was first burned. The Maglemose patterns are easy to sew without any previous marking other than holes or marked points. They remind one of contemporary embroideries, which are sewn over counted threads and are generally considered more valuable than those sewn in a drawn pattern. In the following respects, on the other hand, the Maglemose patterns deviate from the currently used embroidery patterns: They almost never consist of finished motifs, but are detached pieces of borders or surface patterns, which could be continued indefinitely. Very often, the carvings not only depict the stitches, but also the edge of the leather lying beneath them. Sometimes the seam is surrounded by two parallel lines, which are likely to either represent an applied strip of leather or the fine creases that arise if the stitches in thin skins are drawn together tightly. As long as the small oblique or transverse lines were engraved in immediate connection to a place that needed to be reinforced, the intention was fully clear and the magic effect thus ensured. But when the decoration was intended to increase the object's strength and durability in general, these short continuous strokes were not always considered sufficiently clear. It was then preferred that either the engraving should also depict an underlying tear or splice or choose a type of stitch with a more pronounced character. This method of decorating a completely undamaged object with both cracks and seams to thereby magically increase its durability appears to be rather quirky and far-fetched. 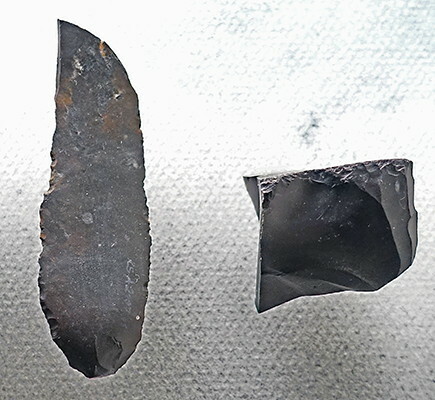 However, the culture's perception repairs must have been quite different from ours, because at that time they did not know of any other material to sew on than skins, and on leather a repaired tear is always stronger than the material itself. Even today, the cutter first cuts the skin and then sews it together again, so that it will not tear. 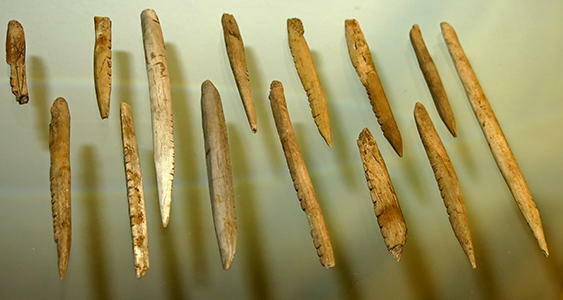 Barbed lines of different kinds occur on more than one third of all carved items from the Maglemose time. However, the zigzag line is even more common. It can be done in two ways: with a short stitch on the wrong side of each angle or using only long stitches. Both variants constitute good reinforcement seams, whether they are made stand-alone or if they are laid over a join. However, the one with only long stitches entails an impractical waste of thread, because it must be sewn twice and then exactly the same on both sides. 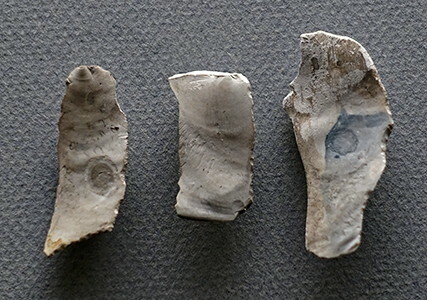 It is therefore more likely that the piece of bone here, as in so many other primitive drawings, depicts what he knows is there, namely the part of the thread running in the opposite direction. On a horn tip from Svärdborg are two lines of zigzag lines, in which one line is always simple, while the other is double to quadruple. Here, the design has either with a simple line tried to indicate the thread on the back, or also imagined a seam performed twice, one with single and the other with multiple thread. Exactly the same line is also found on a richly decorated 'netstick' from Travenort in Holstein, but here one side lines are almost consistently double. On the same piece, there is a beautiful chess pattern. 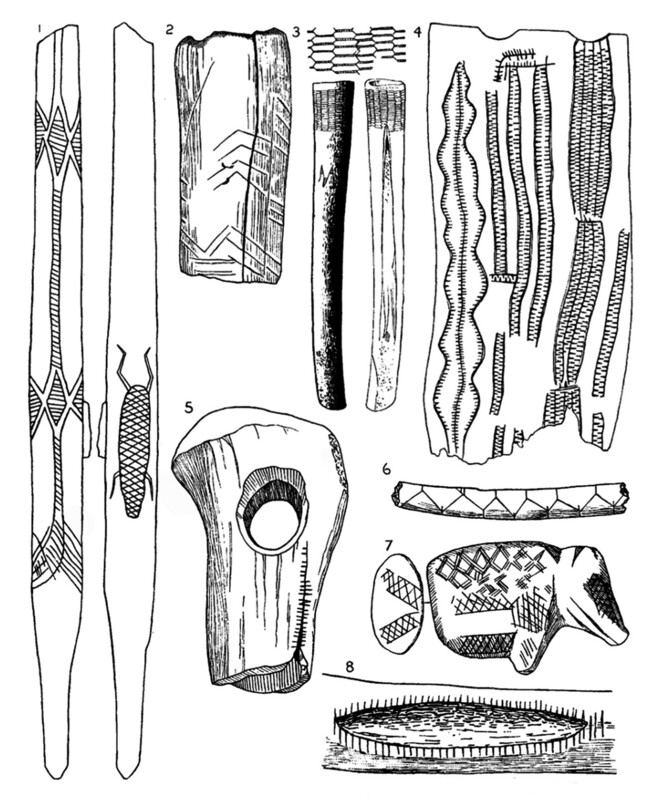 Art designs from the Maglemose Culture. Decorated antlers with the barbed line motif in combination with a horizontal zigzag-line. 2. Grotte du Placard, France. 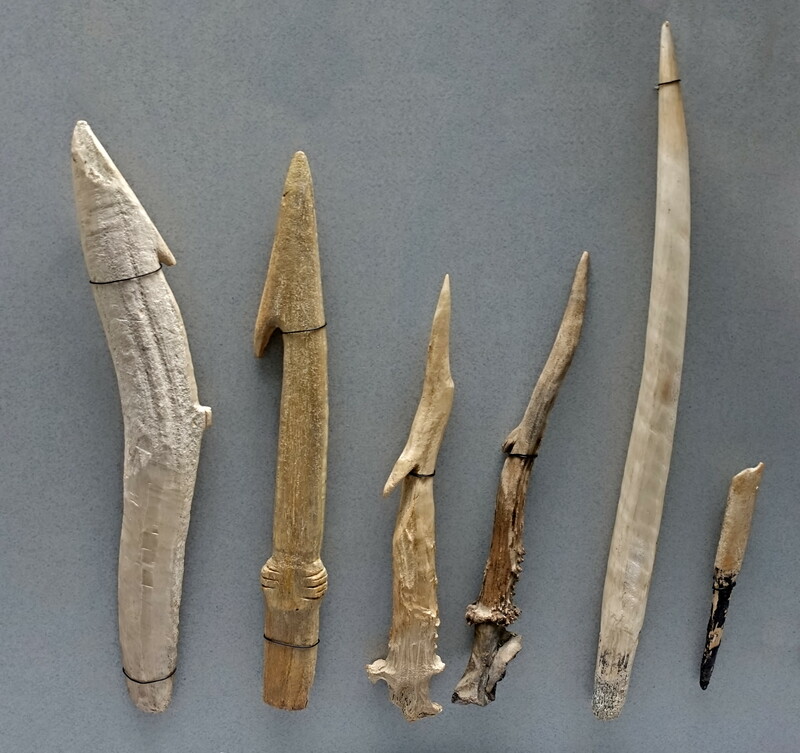 Wooden, antler and bone tools. 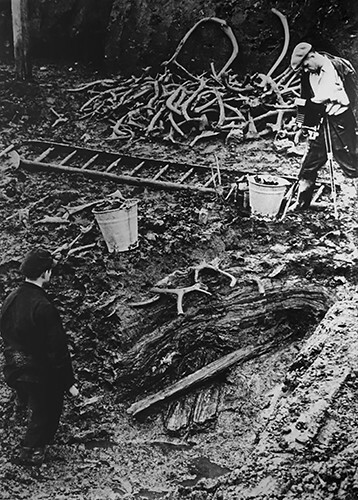 Occasionally, pieces of wood, bone or antler are discovered by dredging in bogs or watercourses. More rarely, ornamented weapons and equipment are found. In the Mesolithic, the Middle Stone Age (10 000 BP - 5 000 BP), between the Palaeolithic and Neolithic periods, at the end of the last ice age, we encounter geometric decorative motifs: lines, angles and notched rows or triangles. Figurative representations are rare. 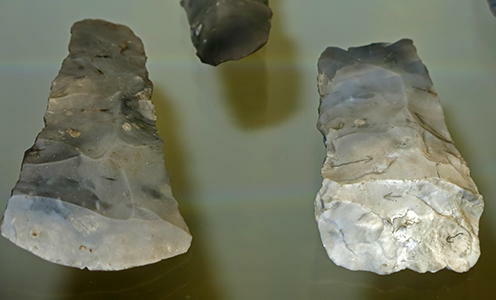 During the Mesolithic, the emphasis was on small or even tiny tools, microliths, rather than the larger tools used previously. There was also greater use of wooden handles for tools, including the adze. Domestication of animals had begun, including the dog. Decorated reindeer bones. Described in Rust (1943), but not from Stellmoor. They are from the Maglemose Culture. Closeups of the decorated bones and their engravings. 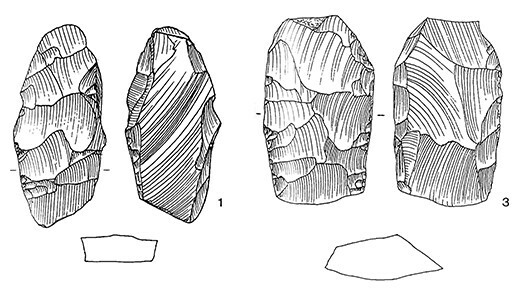 Reconstruction of a box found at Friesack, Germany. 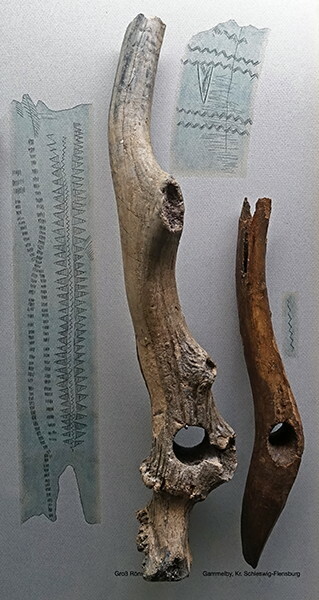 Bow of elm from Holmegaard, southern Zealand, circa 9 000 BP. The original Holmegaard bow, from the Maglemose culture. 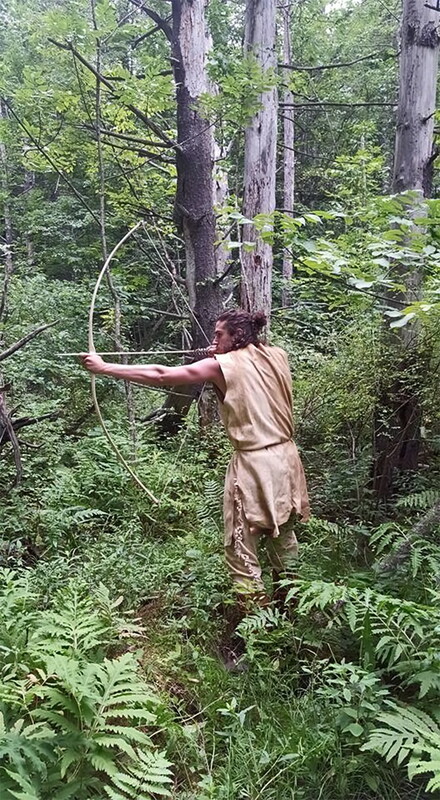 The bow and arrow were the technological innovations that made hunting very efficient. In the forest throwing spears was difficult, but with weapons like the bow from Holmegaard the game could be shot even in thick vegetation - in fact, with care, this allowed the hunters to get very close to their prey, making the shot much easier to make accurately. This is a replica of the oldest preserved bow , from the Holmegaard Moor in Denmark. It is made by Greg Anderson, an avid lover of the outdoors and also a primitive skills and wilderness survival expert. It is from these passions that he came to study the ancient art of bow making. He founded North Wood Traditional Archery LLC in 2010. The original Holmegaard bow is 1540 mm long, made from the trunk of an elm tree, that had been split down the middle. The weapon has a 26 mm wide grip, which possibly didn't bend. Its limbs have a maximum width of 45 mm. 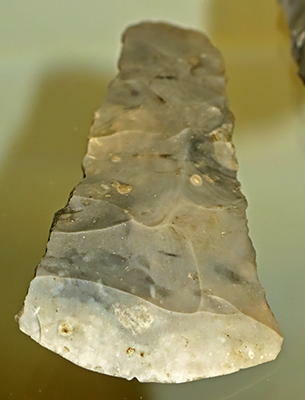 Another reproduction of the bow, as well as an arrow that may have been of the type used, on display in the Neanderthal Museum, Mettmann, Germany. This is an excellent photo of the Holmegaard bow in action, with the archer in period costume. Note the environment - the bow and arrow have many advantages over spearthrowers and darts, even on the steppes, but it is in a forested setting that they become clearly superior. This particular reconstruction is 62 inches long. It pulls 55 pounds at 27 inches of draw (1575 mm, 25 kg, 686 mm). 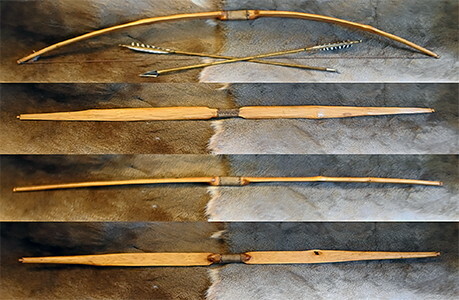 The bowstring is twisted deer rawhide. 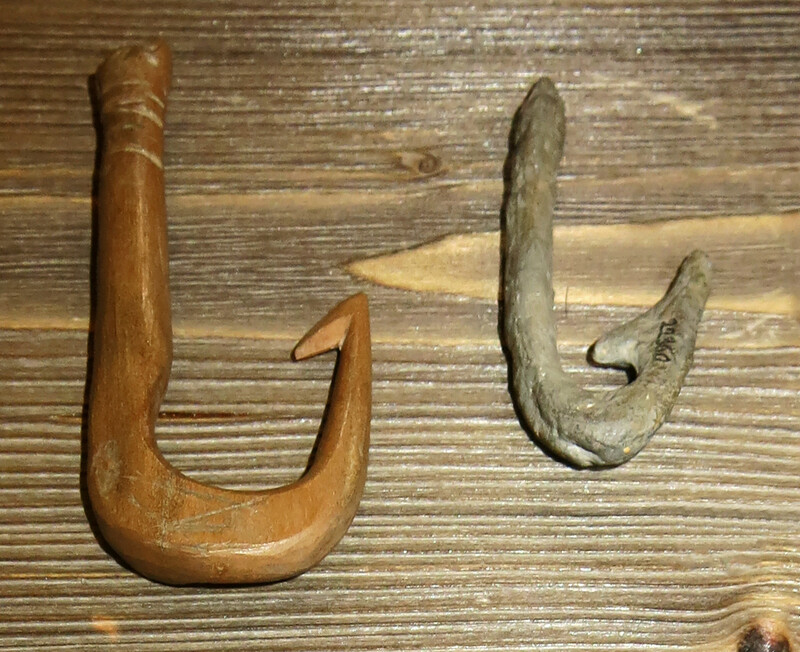 The nocks are built up with twisted cordage, pine pitch, and sinew, the original artefacts having no carved nocks. The handle is wrapped in twisted elm bark cordage. For the original, the belly of the bow has a flattened shape. On the back of the object there are some marks that are interpreted as the evidence of strengthening the bowstring made of sinews, by fixing it firmly to the edge of the bow. The limbs of the bow taper gradually toward the end. 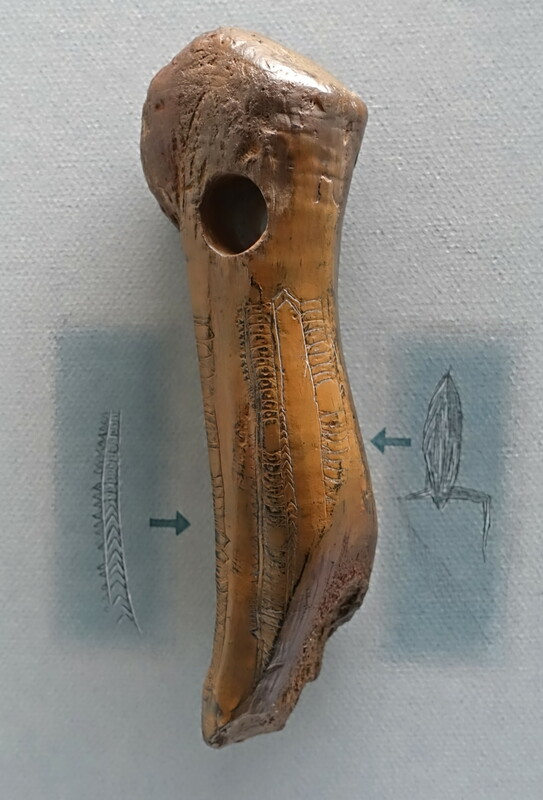 This hunting tool was carved out from the tree so that its back was the flexible sapwood while the belly was the harder heartwood. 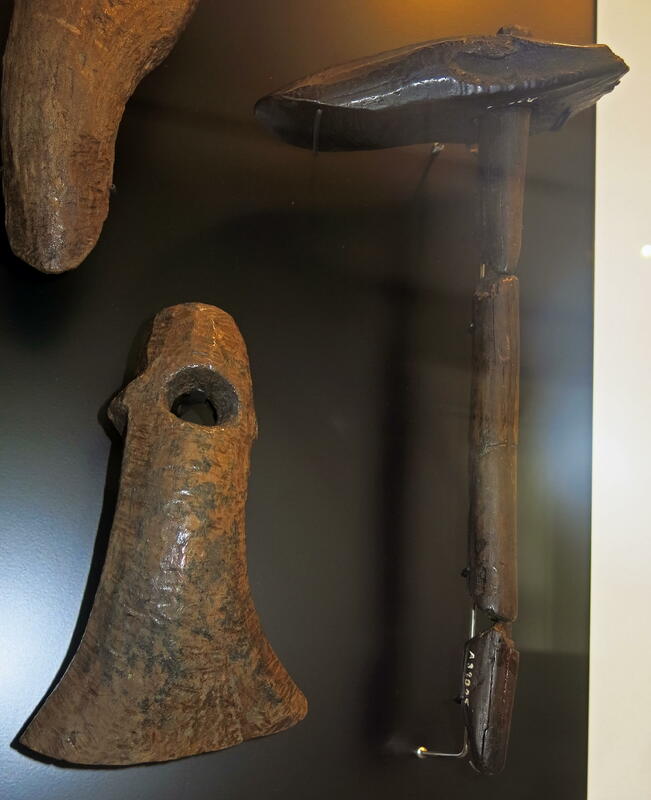 This wasn’t the only bow that was discovered in Holmegaard Moor, four other very similar objects were also found, all of them are made from elm. One of the other bows was larger, originally around 1620 mm long. The grip is 21 mm wide, the maximum width of the limbs of this bow is 60 mm. 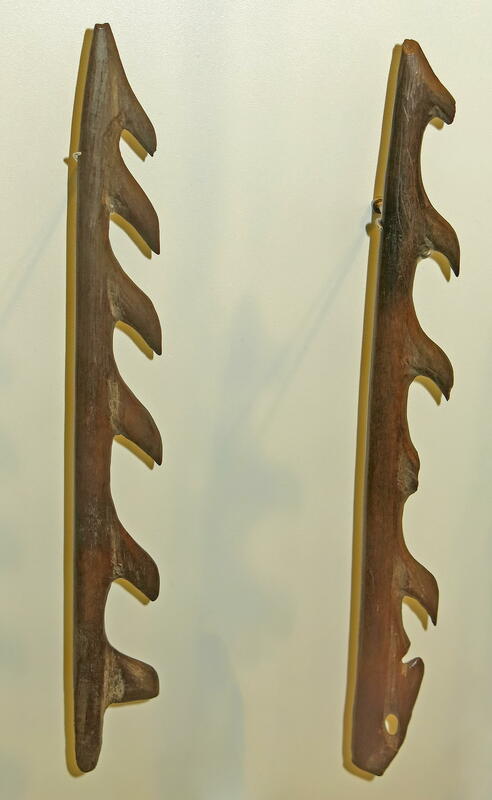 These bows are considered as wide-limbed bows. This broad-limb feature is for reinforcing, useful to reduce strain from the bow, keeps the string more durable and altogether increases the efficiency of the weapon. The narrow grip makes the bow easier to handle while being used. The trees that the bows were made of were chosen from those that grew in the shade, so that they did not have any branches or knots. 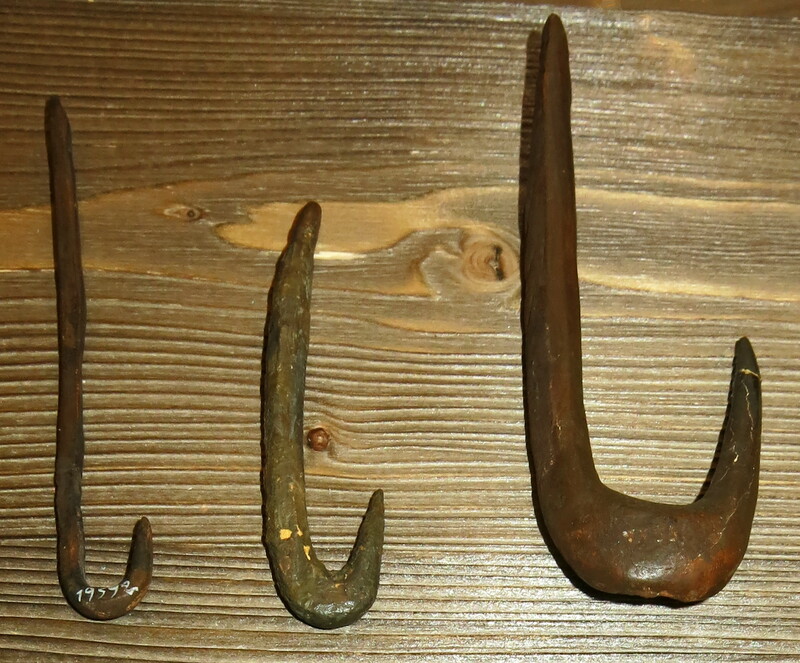 These hunting weapons are dated to around 9 000 BP. Forearm protection plate for an archer, as protection against chafing from the bowstring. The ancient lake bed at Duvensee was formed during the Older Dryas as a dead-ice kettle hole left by the retreating Fennoscandian ice sheet. The water level rose during the Allerød and the lake reached its largest extent during the early Preboreal. 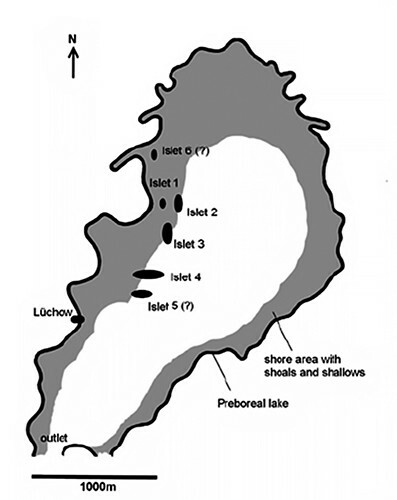 The water level fluctuated during the late Preboreal and Boreal, but over the course of the Holocene the lake gradually silted up and was overgrown by peat. Sites of the Birken-Kiefern-Zeit - The Birch-Pine Period. The Duvensee bog, or Lake Duvensee, is located at the edge of the Duvensee municipality in the Herzogtum (Duchy of) Lauenburg district in the southern part of Schleswig-Holstein. 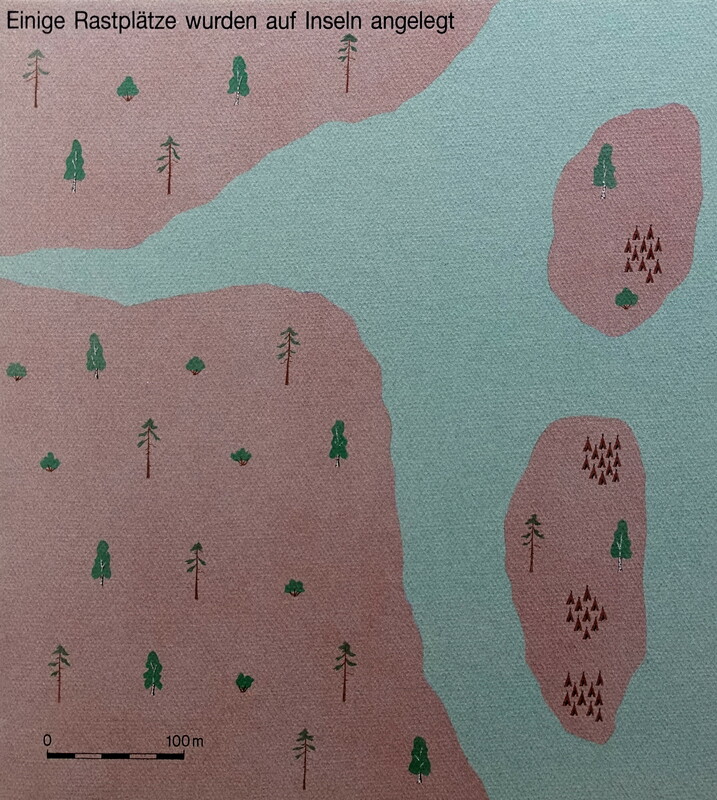 The bog formed from a paludifying (peat-forming) lake that originated as a kettle hole (ice left behind as the ice sheet retreated, surrounded and often covered with sediment, thus forming a lake when the ice eventually melted) during the early pre-boreal, and which once covered an area of more than 4 square kilometres. Siltation set in during the late pre-boreal and the lake was (intentionally) drained in its entirety during the 19th century. The north-western banks of the lake served as areas for human activity during the early Mesolithic. 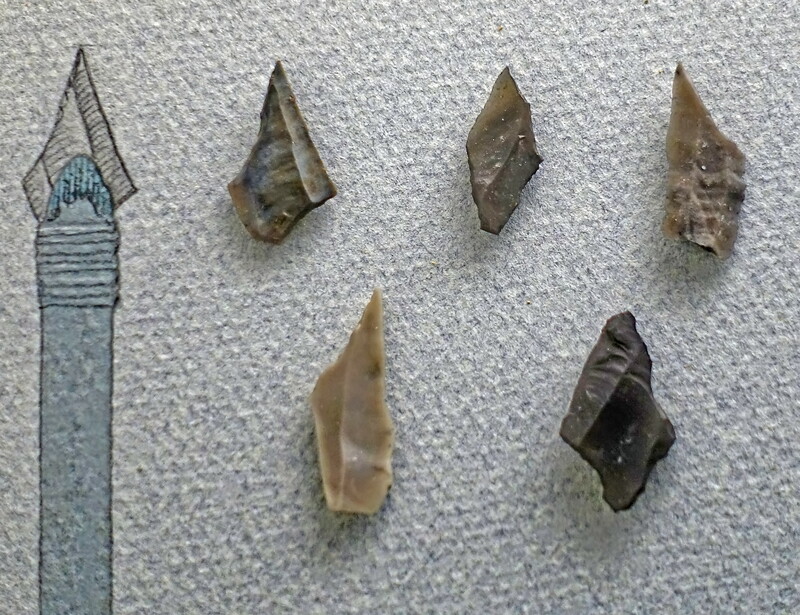 On two peninsulas the remains of small to medium-sized sites in close vicinity to one another were found. With increasing formation of peat, which is thought to have set in during the periods of occupation, the sites were covered and protected by the thick layers of peat and survive in excellent condition. Due to increased peat harvesting during the 19th and 20th centuries, the as yet unexcavated portions are now close to the surface and are no longer protected by this natural cover. 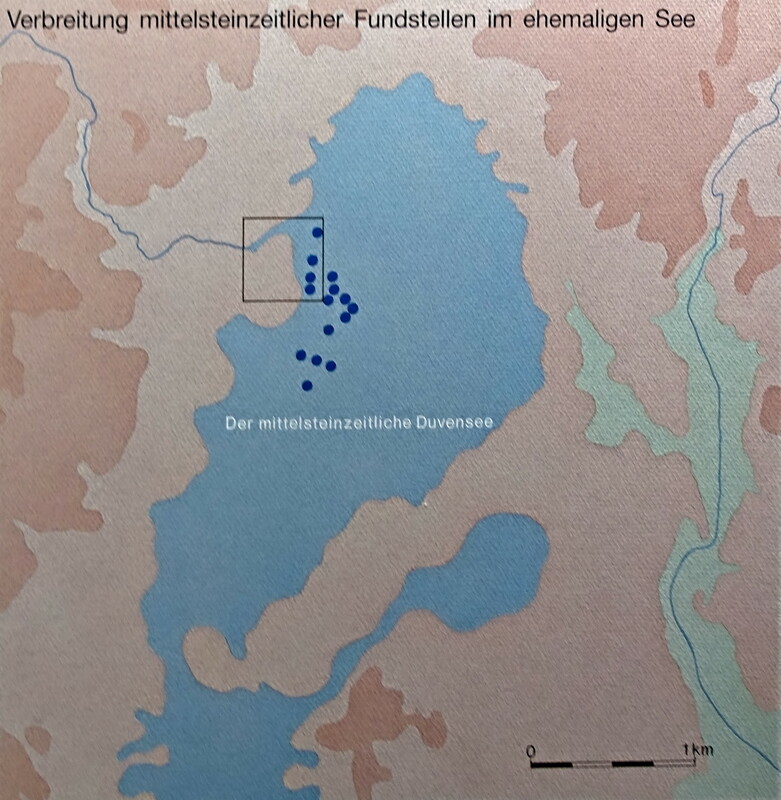 Dating and location of sites in the central western area of the ancient lake Duvensee. Small map: the maximum extent of the lake in the early Holocene (base maps: © GeoBasis-DE/LVermGeo SH). The Preboreal Duvensee lake with islets, shallows and the Lüchow site. 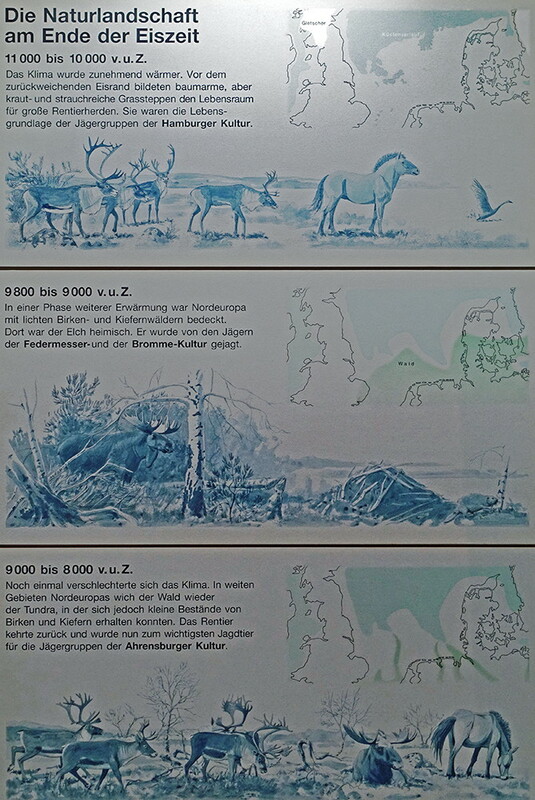 Development of the Duvensee bog, Schleswig-Holstein, from the Preboreal to the Atlantic. 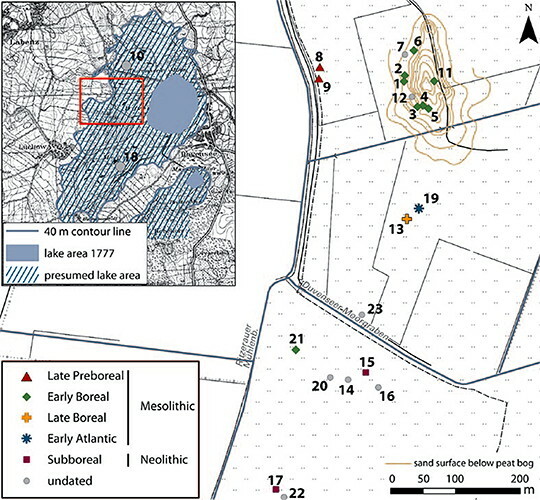 (left) Distribution of Mesolithic sites in the former lake. (right) Some camps were made on islands. View of the western 'shore' of the Duvenseer Moor. The left tent is partially on the edge of the former lake, the corn field in the middle ground has been sown on the preboreal Gyttja. To the right of the survey rod is Duvensee, Wohnplatz 8. 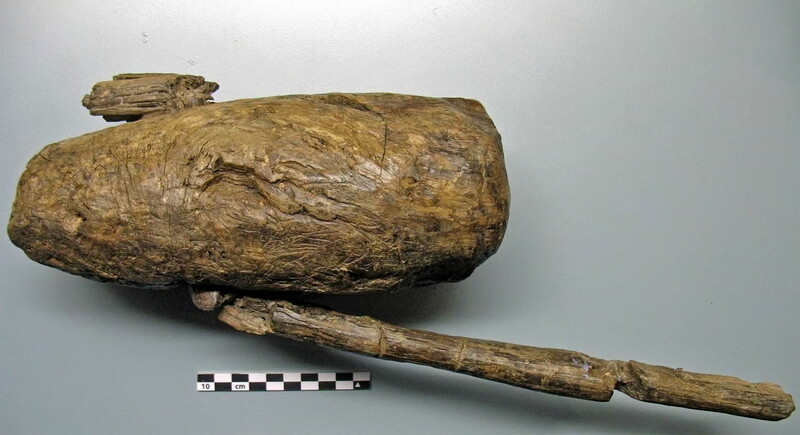 An extraordinary find from Lake Duvensee was this wooden axe made from root wood with the wooden handle still preserved. Drawing of the axe from Duvensee WP 1 (© Archaeological State Museum Schleswig-Holstein). Wooden axe from Lake Duvensee. 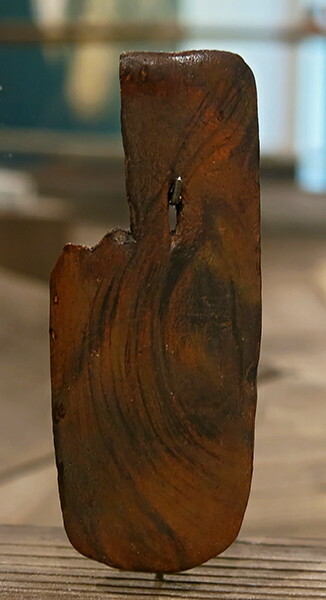 One of the world's oldest surviving wooden paddles. 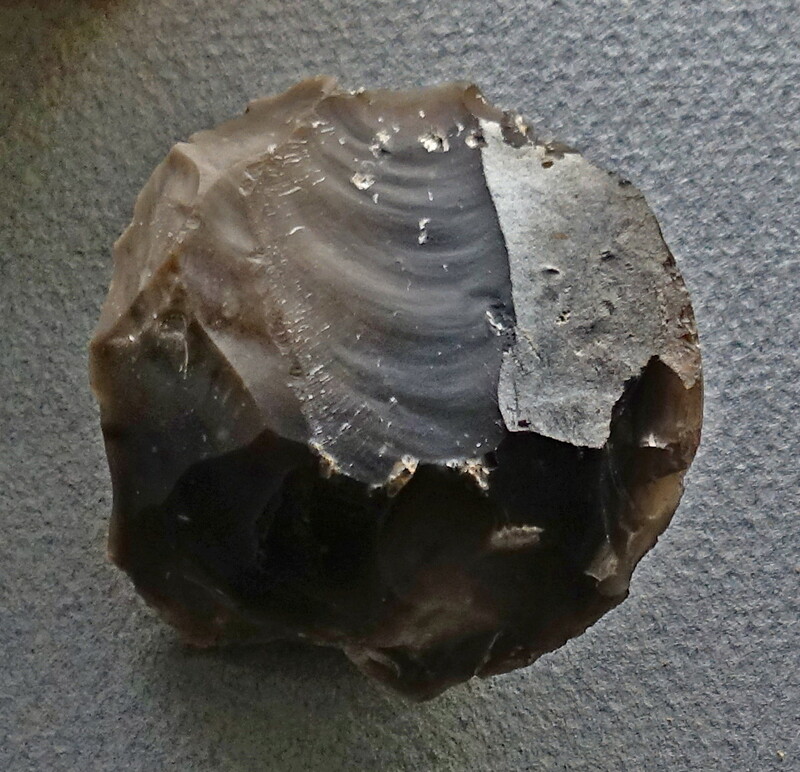 Date	circa 8 200 BP (Mesolithic). Dimensions:	Length: 520 mm. Width: 182 mm. Depth: 35 mm. Weight : 331 g (11.67 oz). Permission: This file is licensed under the Creative Commons Attribution-Share Alike 3.0 Germany license. 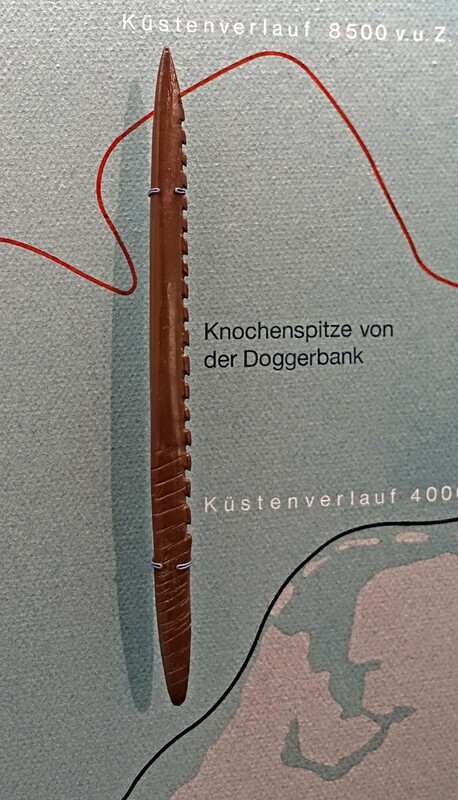 The back of the Duvensee Paddle. (-Wpl. 2) LA 18, Kr. Hzgt Lauenburg: pine, fragment. Blade: length 340 mm, width 140 mm, thickness 20 mm. Shaft: length 330 mm, diameter 33 x 28 mm. The Duvensee paddle made from pine wood was found in Wp2 and is among the oldest direct evidence for water transport. Pine and birch bark mats of up to 5 square metres in size were discovered at several sites (Wp 8, Wp11, Wp13 and Wp19) in association with hearths and roasting fires. They may have served as insulation against the dampness emanating from the bog. 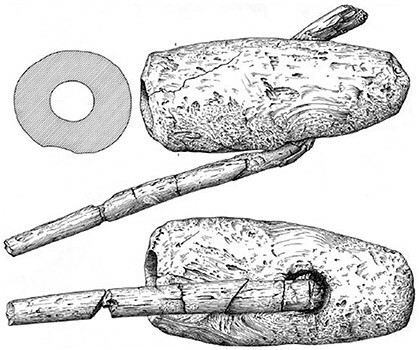 Two arrow shafts made from hazel and pine wood were discovered at Wp6. 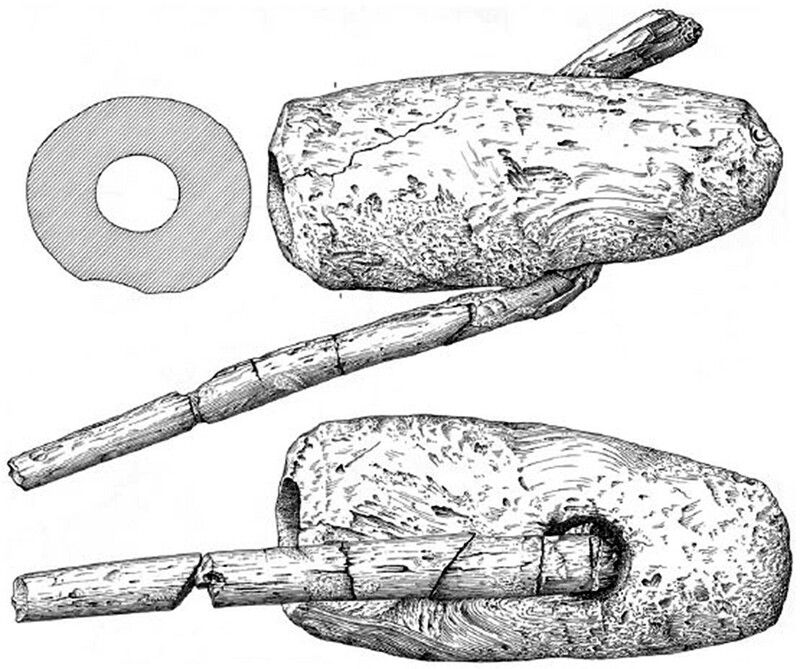 An axe shaft made from pine wood preserves evidence for the preparation of shafts of Mesolithic axes (tranchet axe and core axe). 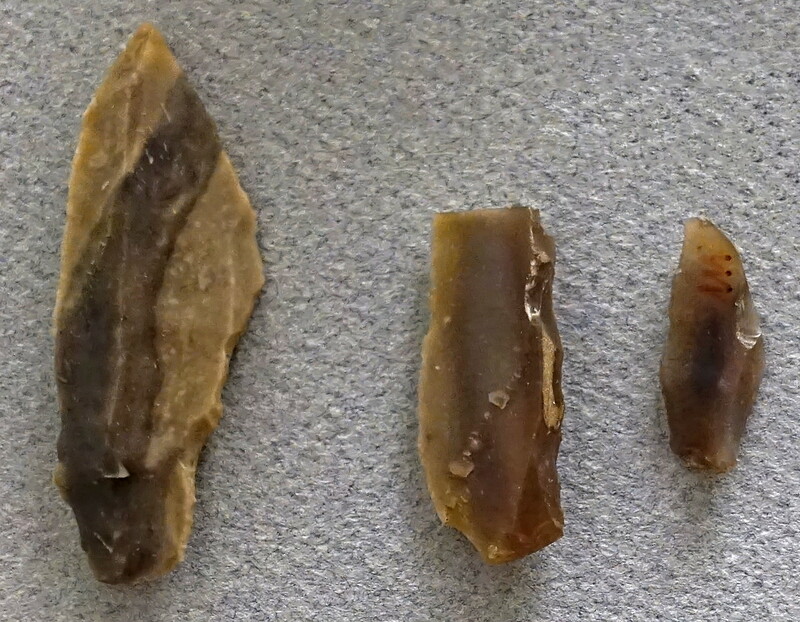 However, the majority of finds are lithic tools and by-products of their production made from flint. 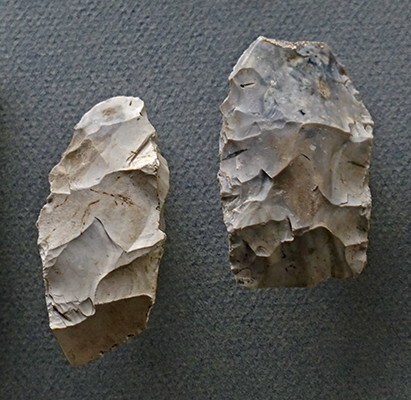 These form the basis for technological and spatial analyses at the site. The paddle and all finds from Wp1 through Wp5 are curated at the Archaeological Museum Hamburg, whilst all other finds are stored at the Archäologisches Landesmuseum Schleswig. 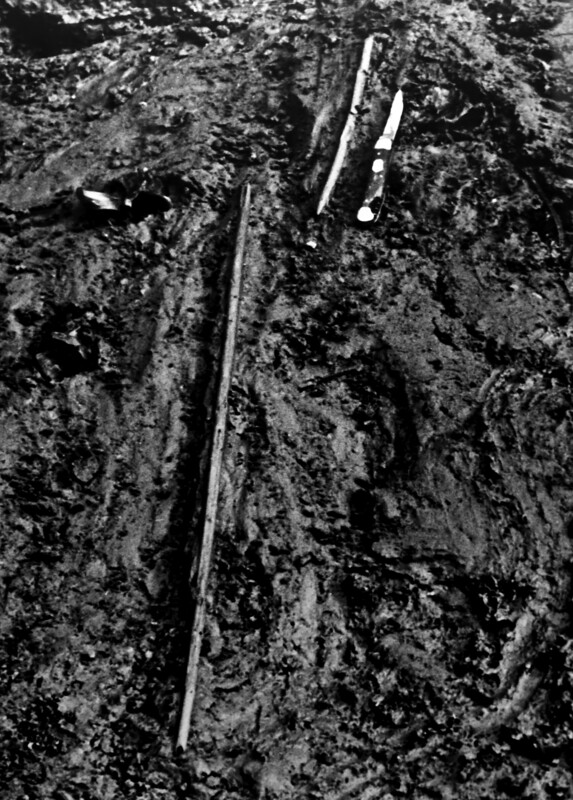 The Duvensee Paddle at the time of its discovery in the 1920s. The paddle of Duvensee is the second oldest paddle worldwide after the paddle of Star Carr and is considered one of the earliest records of the use of water vehicles in the Middle Stone Age. The former Duvenseer Moor is located directly west of the village Duvensee in a young moraine landscape and had an extension of 3.5 km north-south and 1.2 km in west-east direction. Originally, it was a shallow, open lake that gradually filled with peat and eventually silted up. 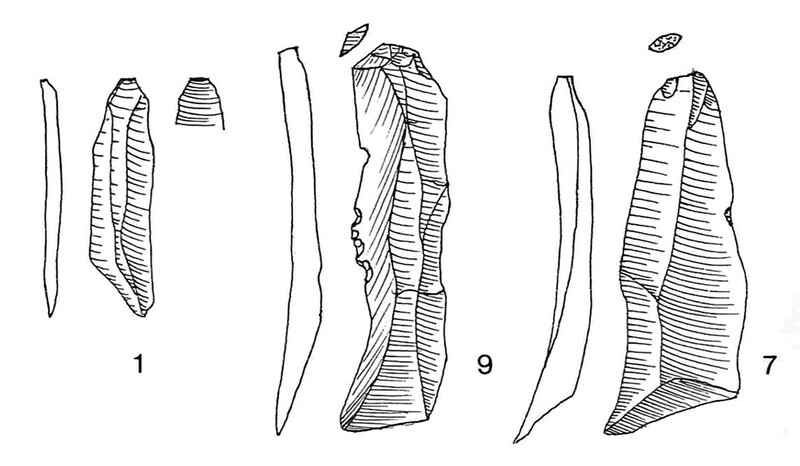 During mapping work in 1923 , the geologist Karl Gripp accidentally discovered a Mesolithic settlement site in the Duvenseer Moor. In the following years, the site was extensively archaeologically examined. 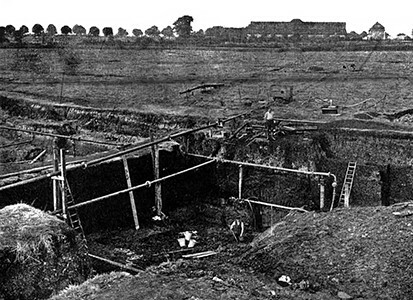 In the years 1924-1927 Gustav Schwantes , 1946 Hermann Schwabedissen and 1966-1967 Klaus Bokelmann made archaeological excavations in the moor, and numerous residential sites were documented. 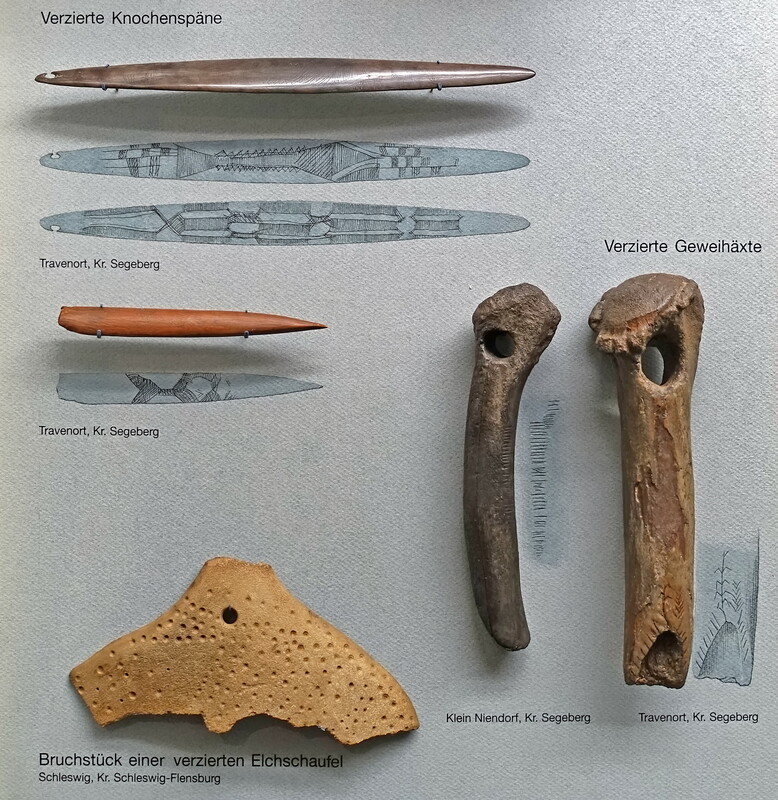 In addition to numerous stone artefacts, the excavations produced very few wooden tools, among them the paddle found in 1926 in the Schwantes excavation campaign, which lay in a former riparian zone in the area of ​​Wohnplatz 2. 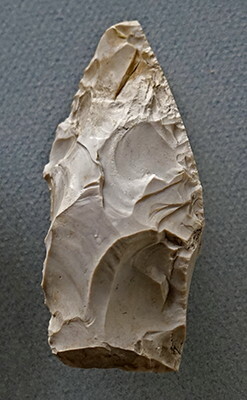 The paddle of Duvensee is one of the most outstanding finds from the Duvenseer Moor. 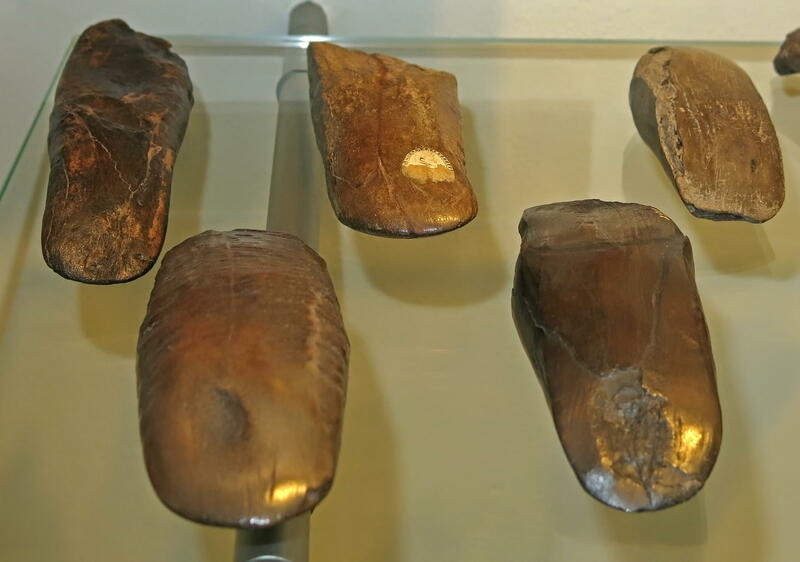 The elementary school teacher Ernst Bornhöft, who teaches in nearby Schiphorst, found two more paddles before 1925, which he first incorporated into the prehistoric collection of his school. Both paddles, however, went to the museum in 1925. 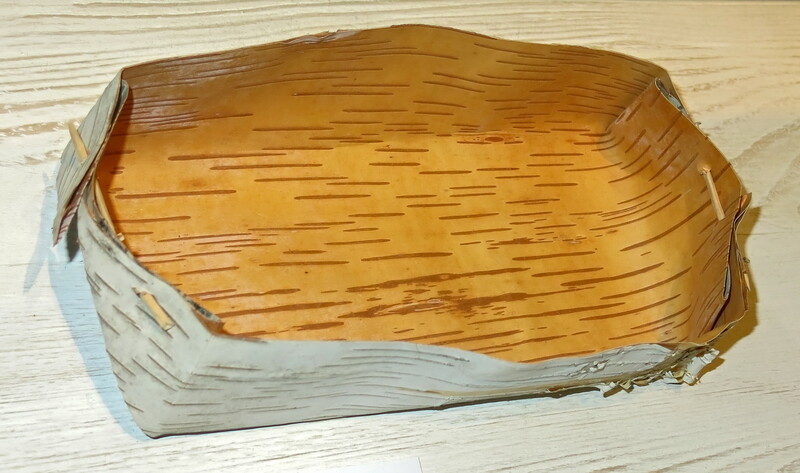 The one large-leaved paddle made of oak wood has the dimensions 790 × 182 × 35 mm with a weight of 613 g and is still in the inventory of the museum. It was established in 2008 by means of 14 C-dating to 1121 ± 22 BP in the transition period from the early to late Middle Ages. The second paddle is lost today, there are only a few written records and a photo of the find. 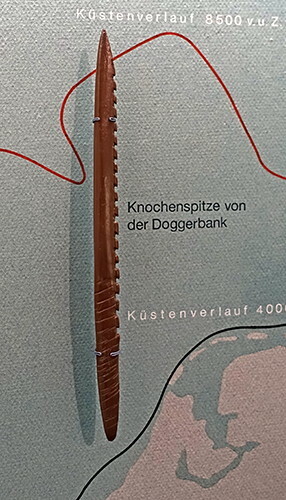 The Duvensee paddle was broken several times during its discovery but it is exceptionally well preserved apart from a few defects. The paddle is missing only the end of the handle and the blade has a corner broken stepwise. The present paddle now has a length of 520 mm, a width of 100 mm and a thickness of 35 mm. The long rectangular blade with wide rounded corners has a length of about 260 mm and merges asymmetrically into the shaft. The weight of the paddle is now 331 g. The paddle was made from the carved trunk of a pine tree. After recovery, the paddle was not accurately documented, and was preserved with a waxy substance. 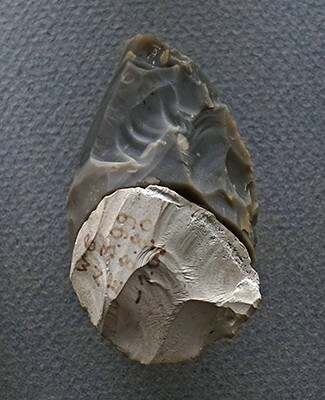 Radiocarbon dating in the 1980s on several hazelnut shells and wood remnants at the place of discovery resulted in an average dating of 9 390 ± 80 BP. 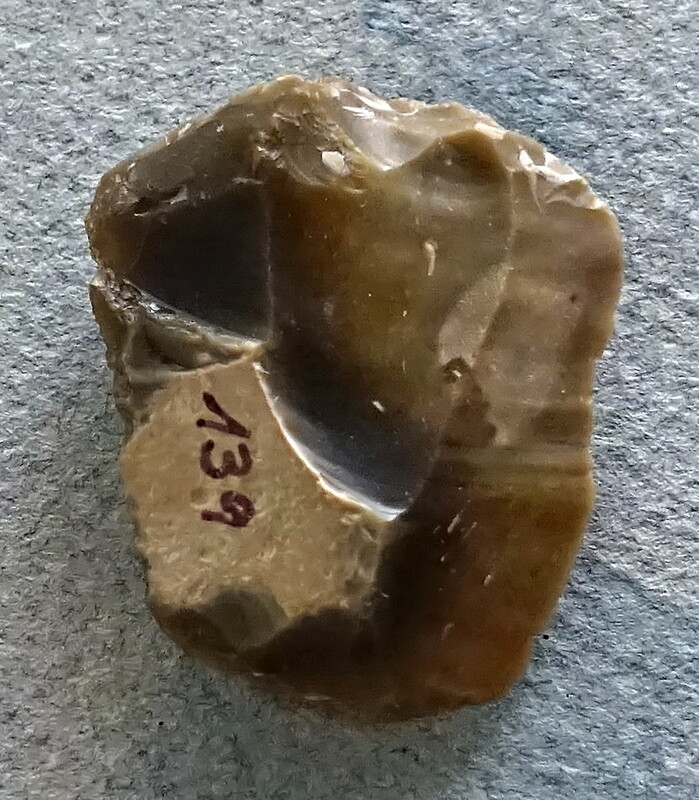 The 2008 radiocarbon dating of two samples from the Duvenseer paddle using accelerator mass spectrometry ( 14 C-AMS) yielded calibrated age of 8 477 ± 49 BP and 8 261 ± 38 BP. Both sides and the cross section of the hatchet on the left in the image above. 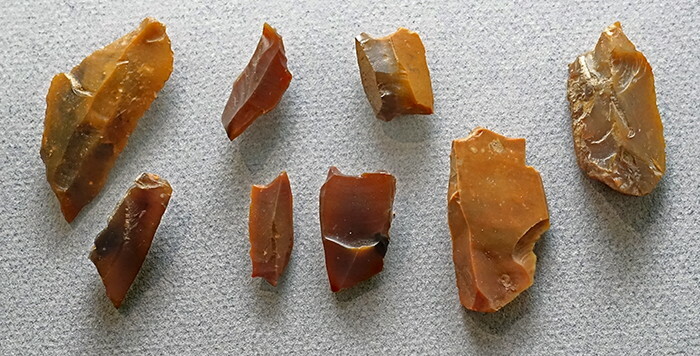 Waste pieces from the manufacture of arrowheads. Scrapers, 6, 10, Taf. 3. Hatchets, 1, 3, Taf. 7. Resharpened hatchet 1, 1a, Taf. 4. Resharpened hatchet 2, Taf. 6. The Kongemose culture was a mesolithic hunter-gatherer culture in southern Scandinavia from 8 000 BP to 7 300 BP, and the origin of the Ertebølle culture. It was preceded by the Maglemosian culture. In the north it bordered on the Scandinavian Nøstvet and Lihult cultures. 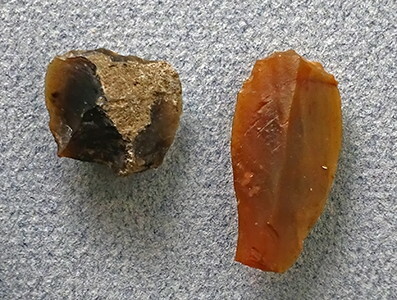 Fundamental tools of the Kongemose culture. 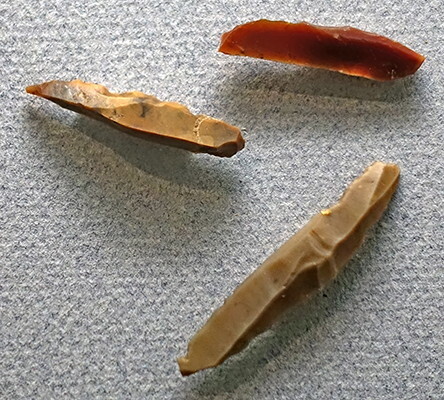 (left to right): arrowhead, core hatchet (adze), tranchet axe, burin, microblade core with a microblade. 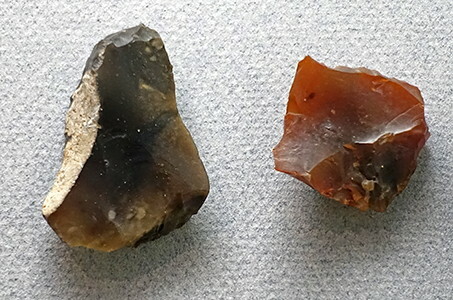 These were made by striking off very large flakes from a core. The flakes were then retouched to their final form. The cutting edge was positioned so that the tool could be used as an adze to work wood. Tranchet axes are large Mesolithic or Neolithic chisel-ended flint artefacts with a sharp straight cutting edge, produced by the removal of a thick flake at a right angle to the main axis of the tool. The technique was used for the manufacture of axes and adzes and allowed a blunted tool to be resharpened by removing another flake from across the edge. 1. 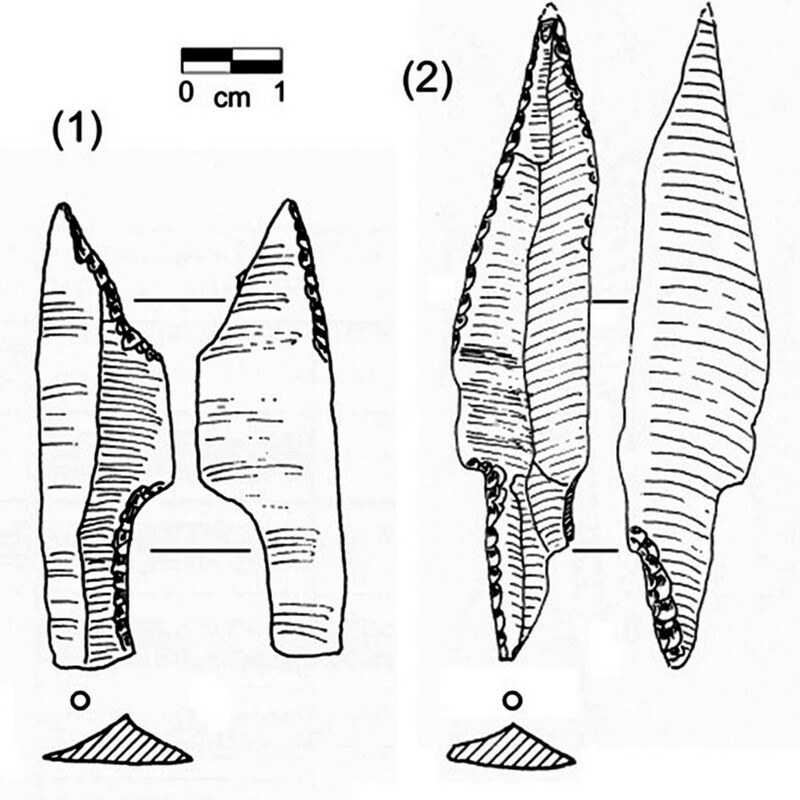 The removal of a large flat flake from the tip of a biface to form a straight cutting edge from the edge of the tranchet flake scar. 2. 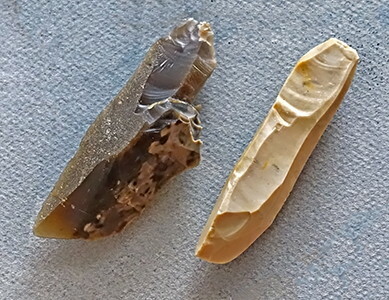 The technique used to create or resharpen the ax or adze's cutting edge. 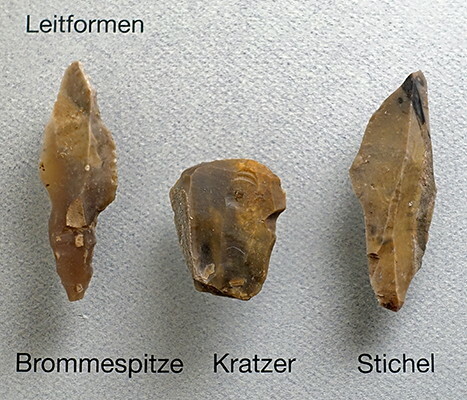 Kratzer (scrapers) and Stichel (burins). 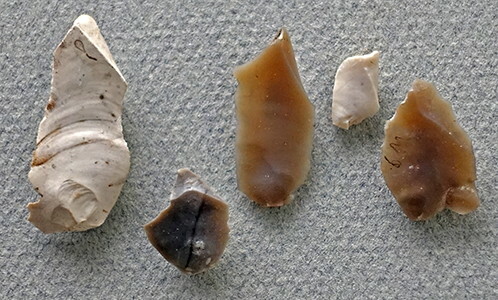 Small blades, set laterally into grooves in arrows and spears, tore wide wounds. (left): Recreation of a multi blade spear head. 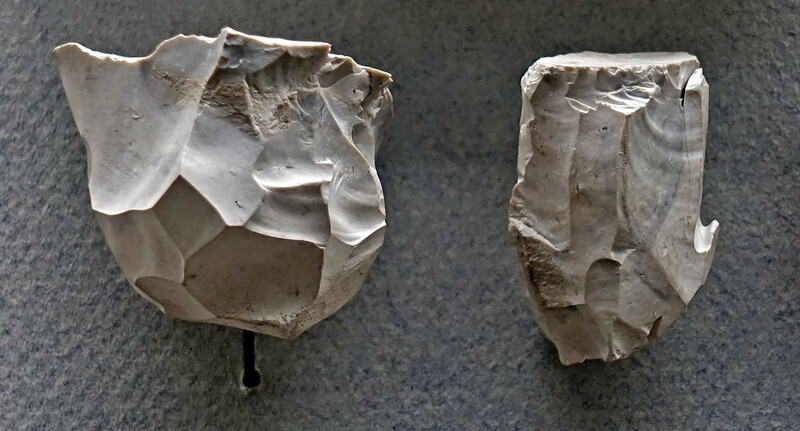 (right): Original spear head from Wangels Ostholstein, as found. 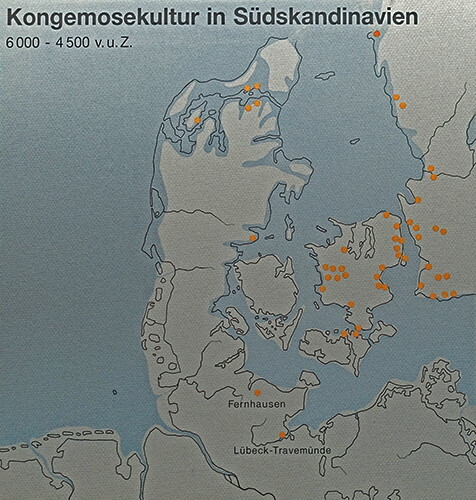 Map of the Kongemose Culture in Southern Scandinavia. 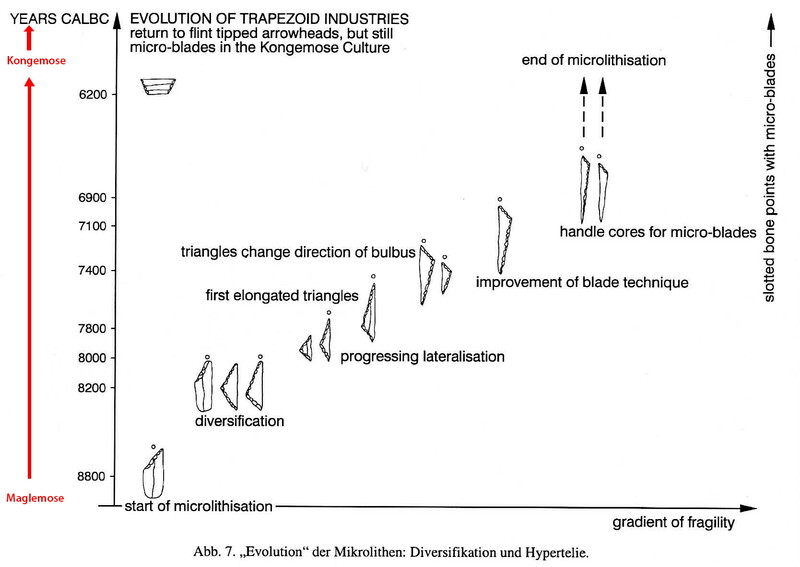 The evolution of microliths, from the Maglemose to the Kongemose cultures. In the Ertebølle period the temperature was up to three degrees higher than today, and the sea surface level was correspondingly higher, about 3 metres higher than today. After the kilometer-thick ice-shelf melted away, the land slowly normalised. The area south-west of the line is sinking and the area north-east of the line is rising. This process is a result of the land once under the ice rising once the weight of the ice is removed, in a process called glacial isostasy. The tectonic plate is tilting up where the ice sheets once weighed it down, and down where there were no ice sheets, since the plate is fairly rigid. The typical transverse Ertebølle arrowhead must have been designed to produce a large wound on the prey and thus a substantial loss of blood, so that the hunters could avoid the situation that they hit the animal, yet it runs away with the arrow and lays down to die elsewhere. The Ertebølle culture hunted and fished mostly along the coasts, and used their bows and arrows and other tools to hunt animals, birds, fish and shellfish. The interior of the peninsula was heavily forested, and was apparently less inhabited. My thanks to Thomas Quinn, who pointed out that these blades were used as arrow points, especially for birds and small game. (left) Trapezoid microliths and an arrow with a trapezoidal microlith used as an arrow tip, found nearly three metres deep in a peat bog at Tværmose, Eising Sogn, Ginding Herred, North Jutland (Denmark). 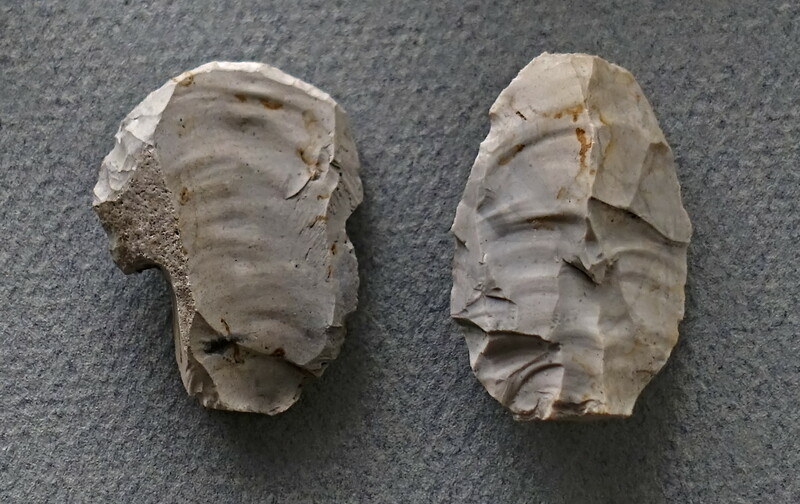 (right) Transverse arrowheads with their hafting still intact are very rare. This one is also from Tværmose near Ringkøbing on the west coast of the Denmark (Jutland) peninsula. 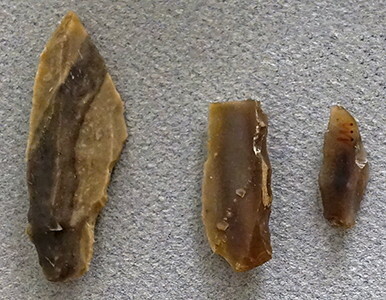 Some of the most well-known flint objects from the Stone Age are arrowheads. They can be found all over Denmark, in places where the Stone Age hunters missed their targets. These have then been discovered thousands of years later; the arrowheads of flint are well preserved, whereas the wooden arrow shafts have decomposed. 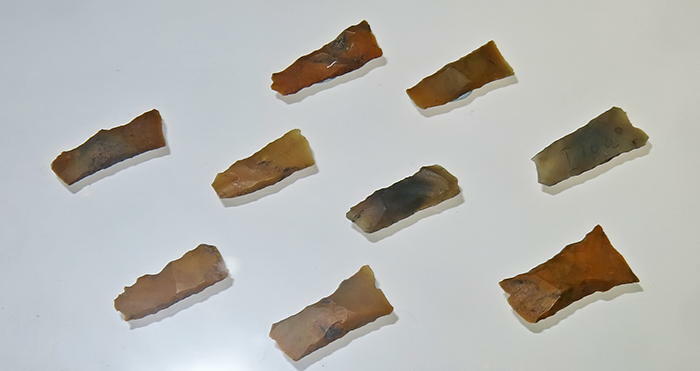 The so-called transverse flint arrowheads are shaped so that they have a very broad cutting edge. This is useful when hunting large prey. The broad cutting edge causes severe injuries to the animals, that bleed to death relatively quickly and are unable to move far away from the hunter. Arrowheads are sometimes found which have been exposed to heat. Apparently these have remained lodged in the body of the animal when it was cooked. 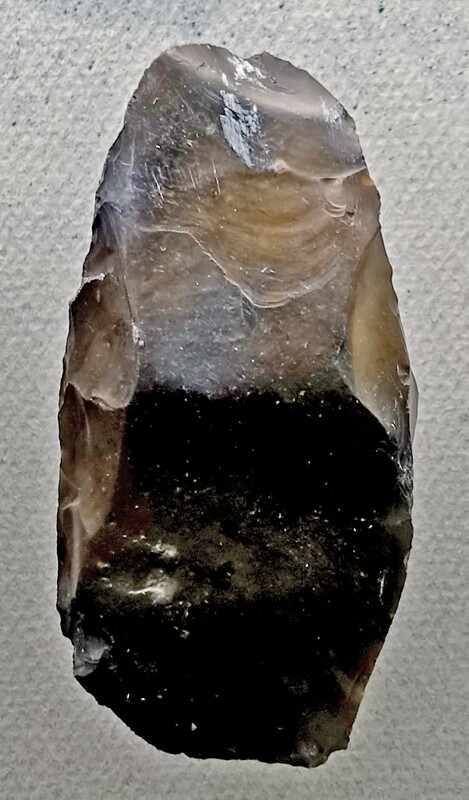 This is an extreme form of a trapezoid microlith from Denmark belonging to the late Kongemose or Ertebölle culture, which is part of the late Mesolithic of this region. It could only have been used as a point on a chisel ended arrow. 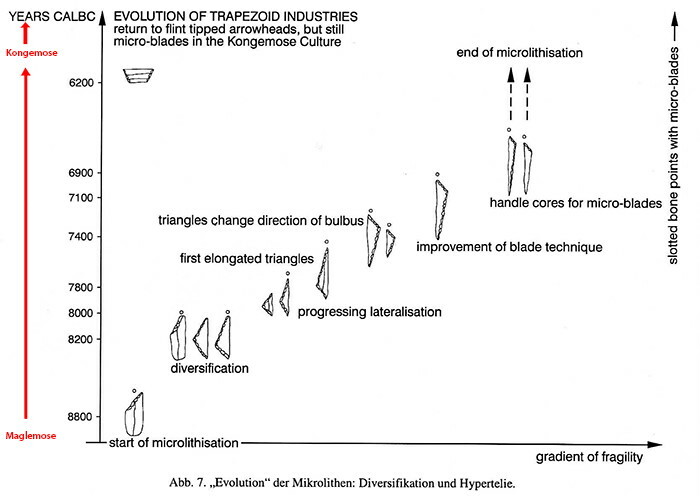 These drawings show that the typical trapezoidal microblade was 15 mm to 20 mm on the longest side. Drawings: G. Almerigogna, S. Ferrari, A. Paolillo. 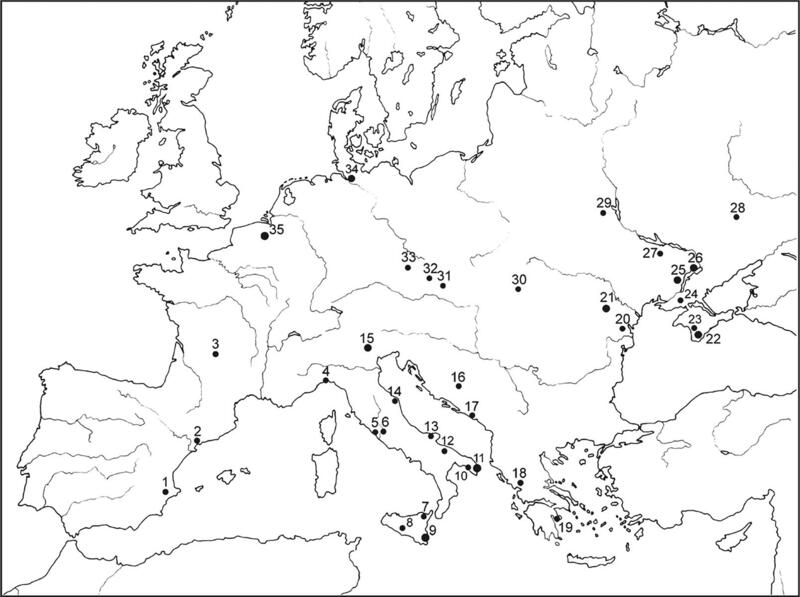 Late-glacial sites with trapezoids in Europe. Bigger points correspond to groups of sites. 1 Pinar de Tarruella. - 2 L’Areny. - 3 La Gare de Couza. - 4 Grotta delle Arene Candide. - 5 Grotta di Palidoro. - 6 Grotta Polesini. - 7 Grotta di S.Teodoro. - 8 Grotta dell’Acqua Fitusa. - 9 Grotta Giovanna, Grotta Corruggi. - 10 Grotta del Cavallo. - 11 Grotta Romanelli, Grotta Zinzulusa. - 12 Grotta Santa Croce. - 13 Grotta Paglicci. - 14 Grotta del Prete. - 15 Riparo Soman, Riparo Villabruna, Bus de La Lum, Val Lastari, Riparo La Cogola and Riparo Dalmeri.. - 16 Kadar. - 17 Crvena Stijena. - 18 Asprochaliko. - 19 Franchti. - 20 Nova Kakhovka. - 21 Tsarinka, Ivashkovo VI. - 22 Shan-Coba, Fatma-Coba, Zamil-Coba, Vodopadny, Buran-Kaya, Alimivsky, Sy-At III. - 23 Suren II. - 24 Bilolissya. - 25 Leontivka, Drimajlivka. - 26 Osokorivka 3B, Progon. - 27 Molodova I. - 28 Rogalik. - 29 Pisochny Riv. - 30 Nezvisko. - 31 Pavlov. - 32 Kulna Cave. - 33 Kvìc. - 34 Borneck, Stellmoor. - 35 Zonhoven, Grotte de Remouchamps. 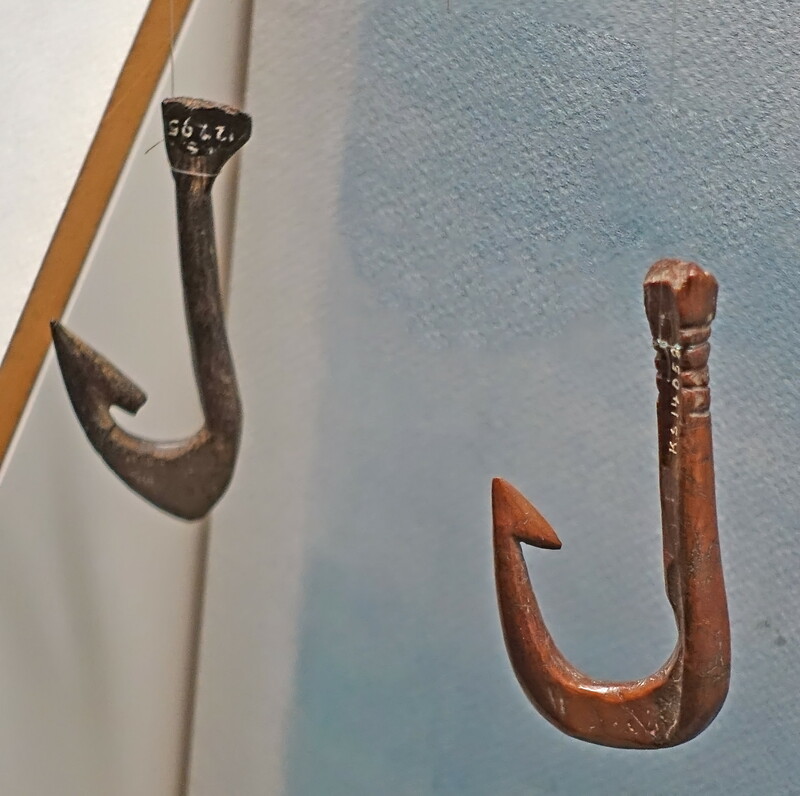 The Aalstecher (or luster, lyster) is a type of trident- based fishing tool for eel fishing. Eels bury themselves in the mud of stream beds in autumn and winter, but also whenever the streams dry up. With the Aalstecher one stabs into the mud, the forearms of the tool guide the spike to the middle of the eel, it is caught on the spike, and the eel can then be pulled out of the mud. 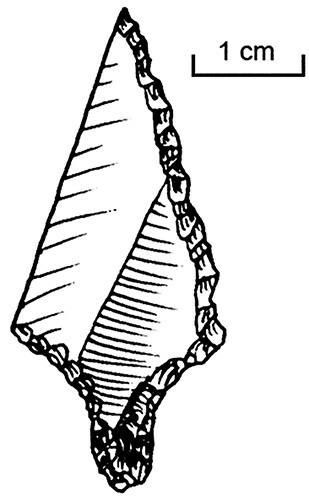 Reconstruction of a luster found on the seabed at Skjoldnæs on Ærø. The shaft is made of hazel and the side branches are made of hawthorn. It is believed that it was mostly used for spearing eels. It is not clear if it is from the Kongemose or Ertebølle Culture. 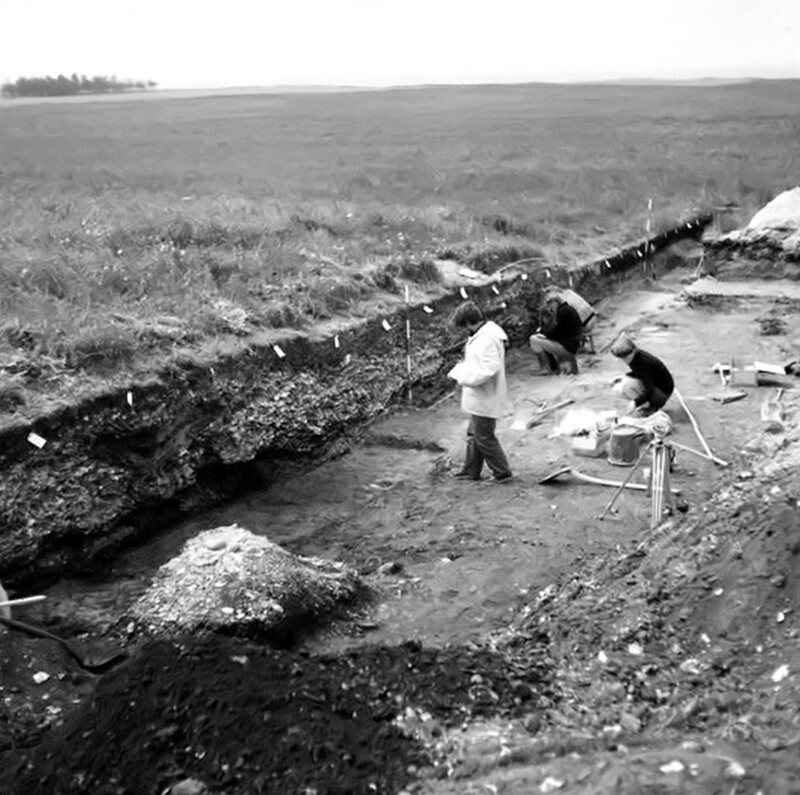 Excavation of a shell midden in Ertebølle, Denmark. Harpoons of deer bone and deer antler. 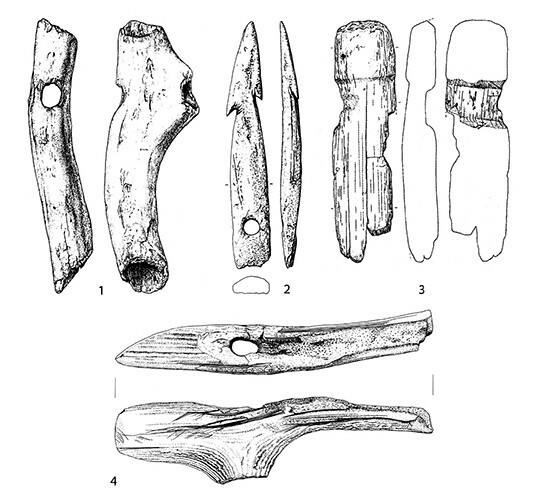 The second harpoon from the right is from Travenbrück, a municipality in the district of Stormarn, in Schleswig-Holstein, Germany, as identified by Hartz et al. (2007), see below. Organic artefacts of the early Ertebølle culture from Travenbrück (1–2), Jäckelberg-Nord (3) and Stralsund (4). 3. Part of a wooden shaft. 4. T-shaped antler axe, of red deer antler, a characteristic artefact of the terminal Mesolithic Ertebølle culture. 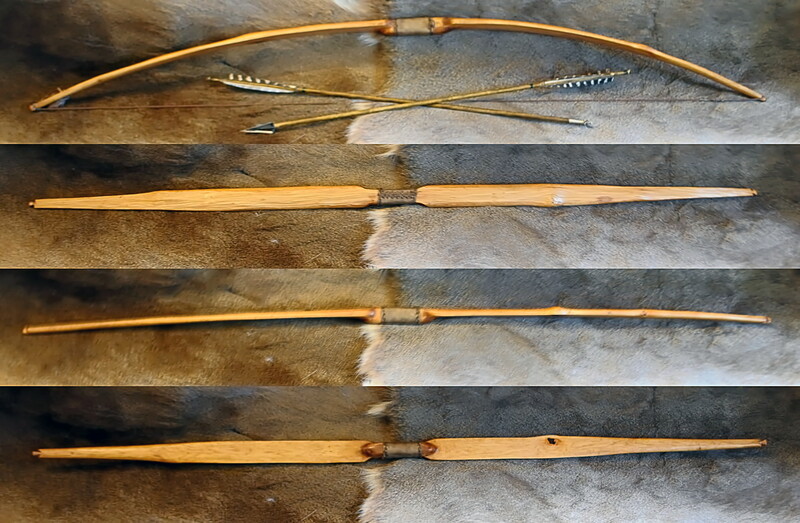 Elm wood bow, and arrow shafts. Parts of fish traps made of willow rods. The settlements and camps of the Ertebølle culture, 7 300 BP – 5 950 BP, were on the banks of rivers and lakes, but mainly beside the sea. Large parts of the coast of Schleswig-Holstein have been flooded since this time, eroded or covered by layers of mud. Thus sites of this culture are difficult to discover. Often they are under water today. 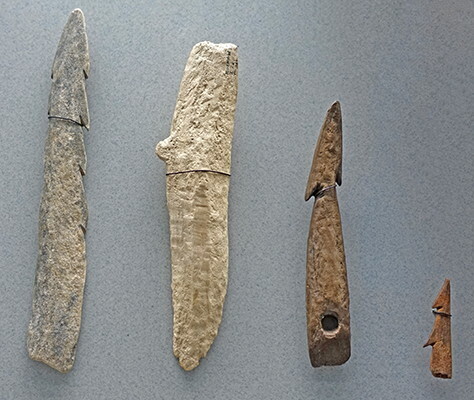 The Ertebølle culture (ca 5300 BC – 3950 BC) is the name of a hunter-gatherer and fisher, pottery-making culture dating to the end of the Mesolithic period, between the (ice ages) Upper Paleolithic and the Neolithic. 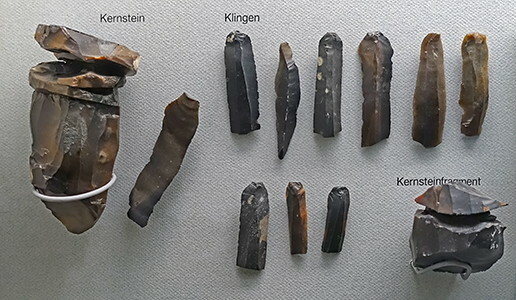 The culture was concentrated in Southern Scandinavia, but genetically linked to strongly related cultures in Northern Germany and the Northern Netherlands. Diorama of a typical Mesolithic site. The economy at the turning point, at the end of the Mesolithic. 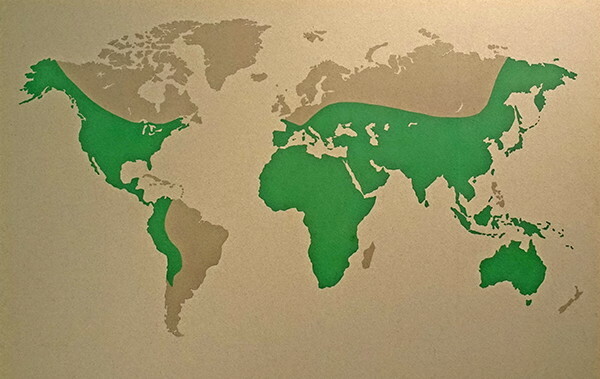 The proportion of hunters and gatherers in the world's population 12 000 years ago. 100% of about 10 million people. The proportion of hunters and gatherers in the world's population today. 0.001% of 4 billion people. Bibby, G., 1956: The Testimony of the Spade, Alfred A. Knopf, 424 pp. Bokelmann, K. et al., 1981: Duvensee Wohnplatz 8. Neue Aspekte zur Sammelwirtschaft im frühen Mesolithikum, Offa, 38: 21–40. Bokelmann, K., 1991: Duvensee Wohnplatz 9. 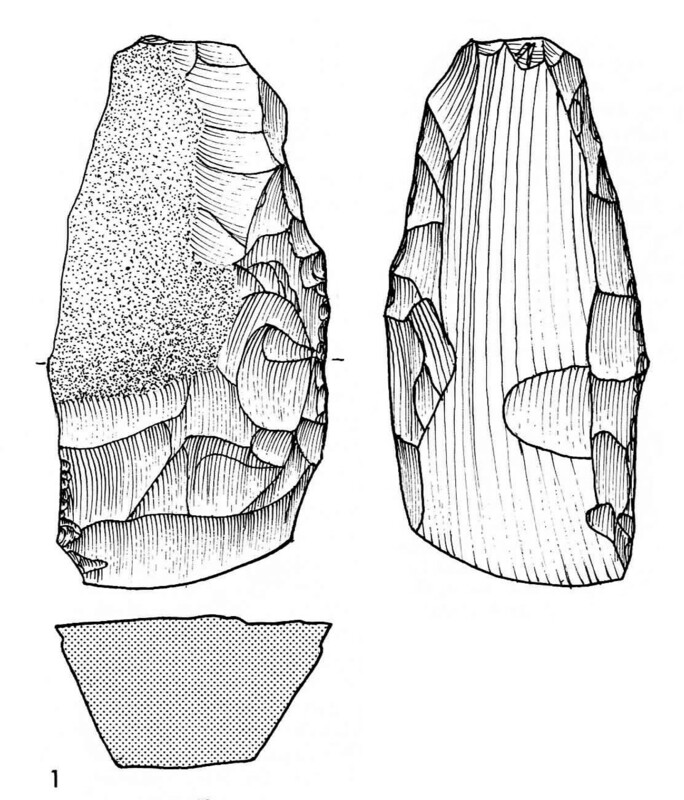 Ein präborealzeitlicher Lagerplatz in Schleswig-Holstein, Offa, 48: 75–114. 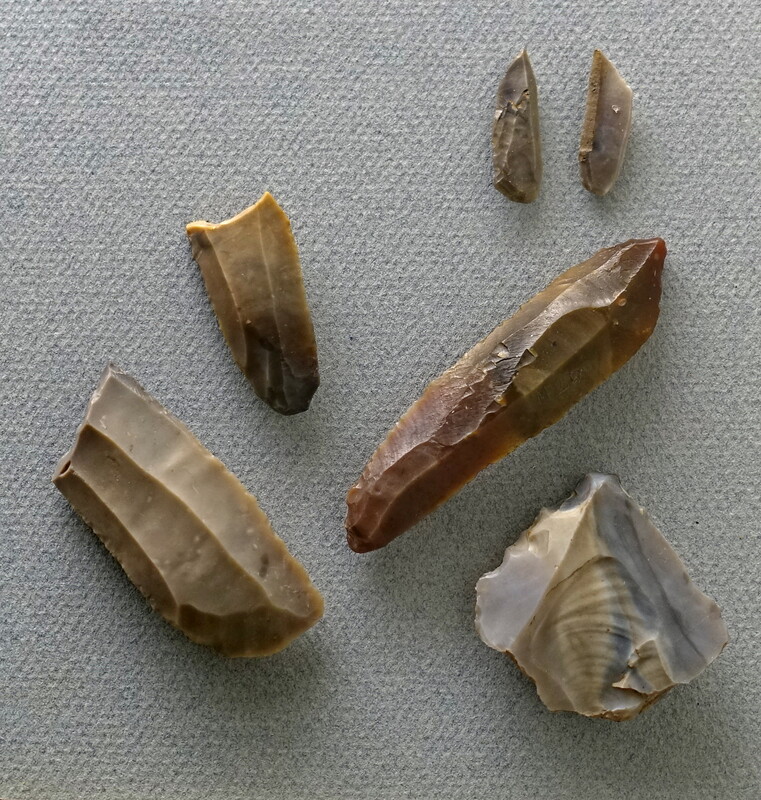 Clark, J., 1936: The Mesolithic Settlement of Northern Europe, Cambridge. Cambridge University Press. 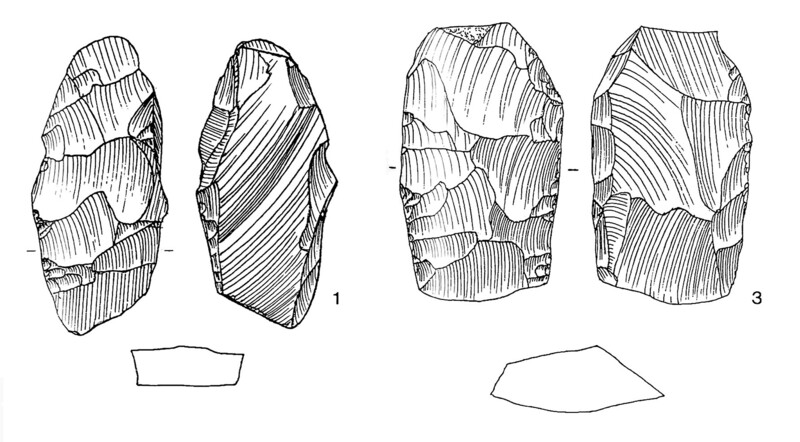 Clark, J., 1975: The Earliest Stone Age Settlement of Scandinavia, Cambridge. 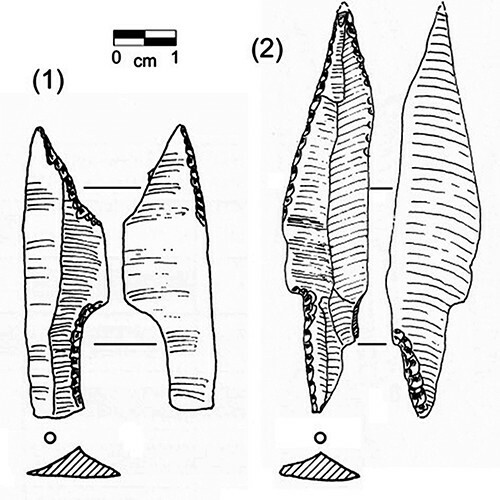 Dalmeri, G., Peresani, M., Ferrari S., 2002: Rise and fall in the utilization of trapezoidal microliths during the late Upper Palaeolithic in Europe : an overview from the italian recordHunters in a changing world : environment and archaeology of the Pleistocene-Holocene transition (ca. 11000-9000 B.C.) in northern central Europe, Workshop of the UISPP-Commission XXXII at Greifswald in September 2002 / edited by Thomas Terberger and Berit Valentin Eriksen. - P. 243-251 : ill.
de MoIyn J., 1954: The Bromme Culture. 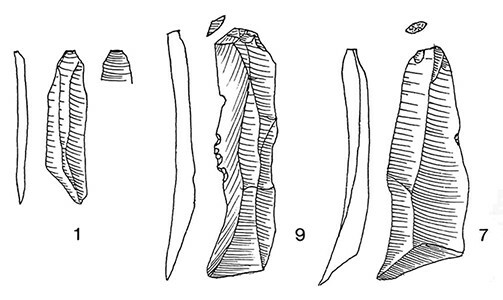 Notes on Denmarks most ancient culture, Quartär, 6:109-117. 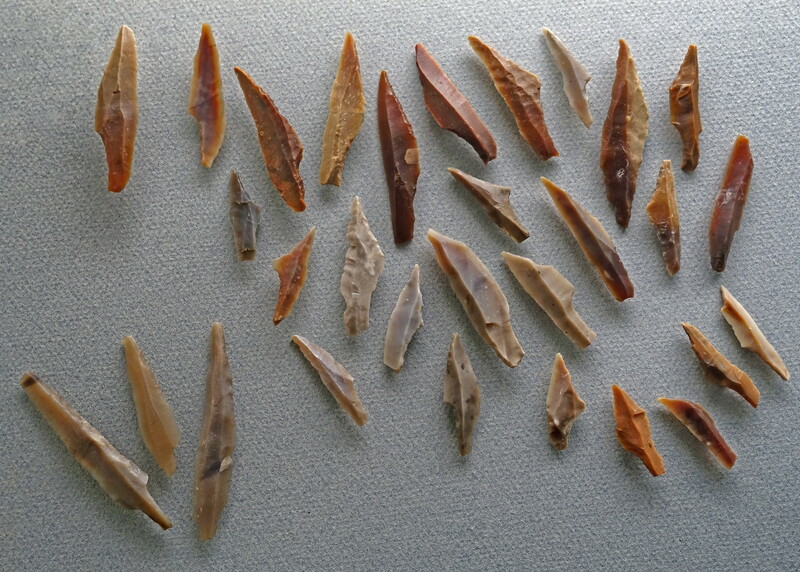 Newell R., Constandse-Westermann T., 1996: The Use of Ethnographic Analyses for Researching Late Palaeolithic Settlement Systems, Settlement Patterns and Land Use in the Northwest European Plain, World Archaeology, 27:372-388. Niekus M., 1995: The archaeological resolution of the Bromme in an anthropological context, MA dissertation, Groningen University. 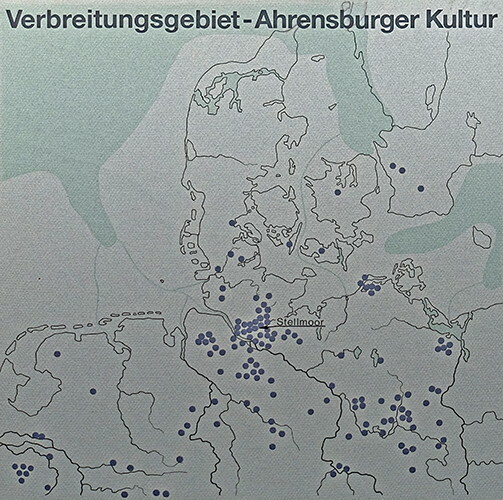 Rust A., 1943: Die alt- und mittelmesolitischen Funde von Stellmoor, Neumünster, Archaeologisches Institut des deutschen Reiches. Schwantes G., 1939: Die Vorgeschichte Schleswig-Holsteins (Stein- und Bronzezeit), Geschichte Schleswig-Holsteins I. Neumünster. Schütrumpf R., 1968: Die Datierung der beiden steinzeitlichen Moorfunde aus Schleswig-Holstein, in: M. Claus/W. Haarnagel/K. Raddatz (eds. ), Studien zur europäischen Vor- und Frühgeschichte, [Festschrift H. Jankuhn], 22-27. Neumünster. Schwabedissen H., 1968: Zwei Moorfunde der Steinzeit aus Schleswig-Holstein, in: M. Claus/W. Haarnagel/K. Raddatz (eds. 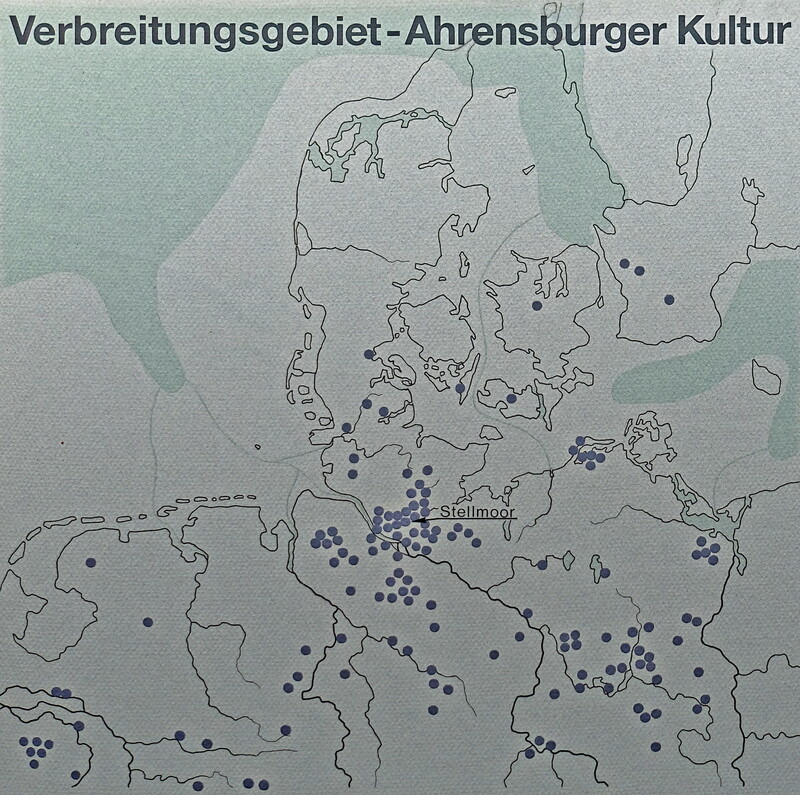 ), Studien zur europäischen Vor- und Frühgeschichte, [Festschrift H. Jankuhn], 16-21. Neumünster. 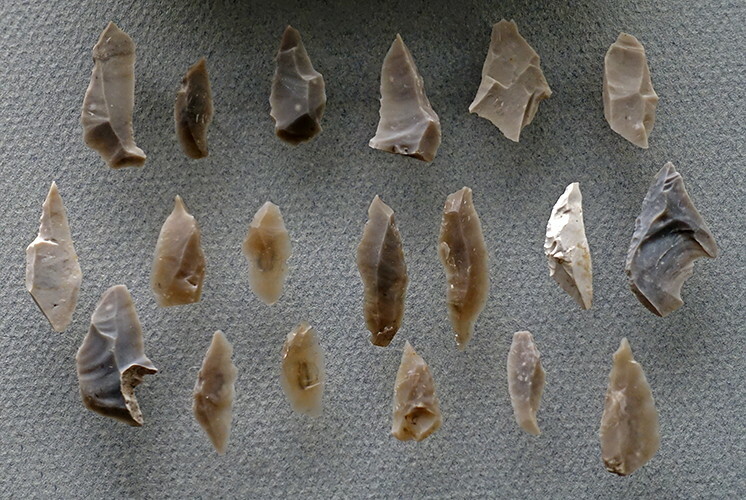 Sunyol A., circa 2009: Transverse arrowheads, Society of Archer-Antiquaries, Institut de Préhistoire et d’Archéologie Alpes- Méditerranée. 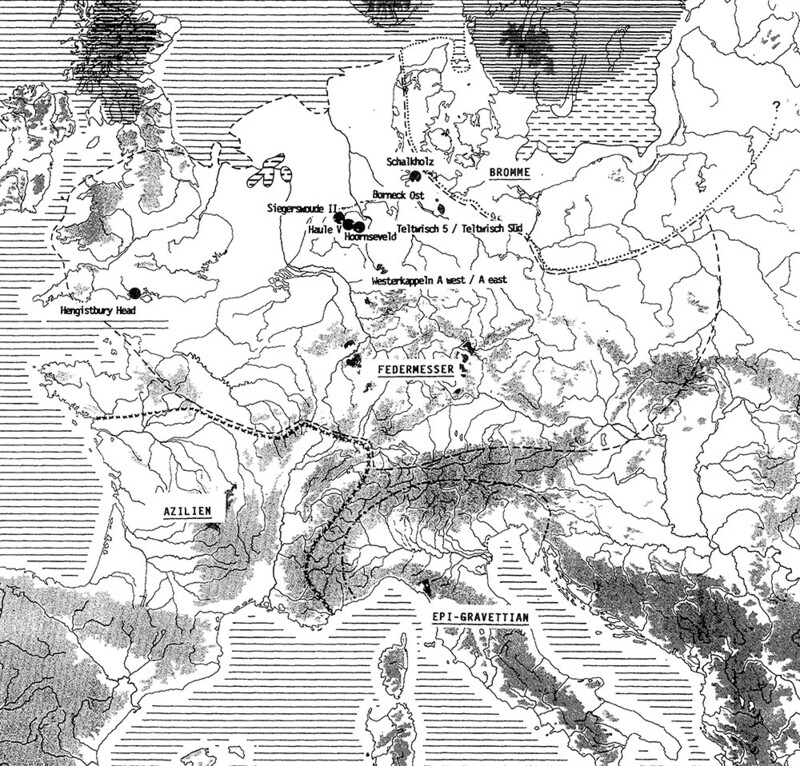 Terberger T., Hartz S., circa 2003: Across the western Baltic, in (eds Hansen K. and Pedersen B.) Proceedings of the archaeological conference 'The Prehistory and Early Medieval Period in the Western Baltic', in Vordingborg, South Zealand, Denmark, March 27th – 29th 2003, Sydsjællands Museum. 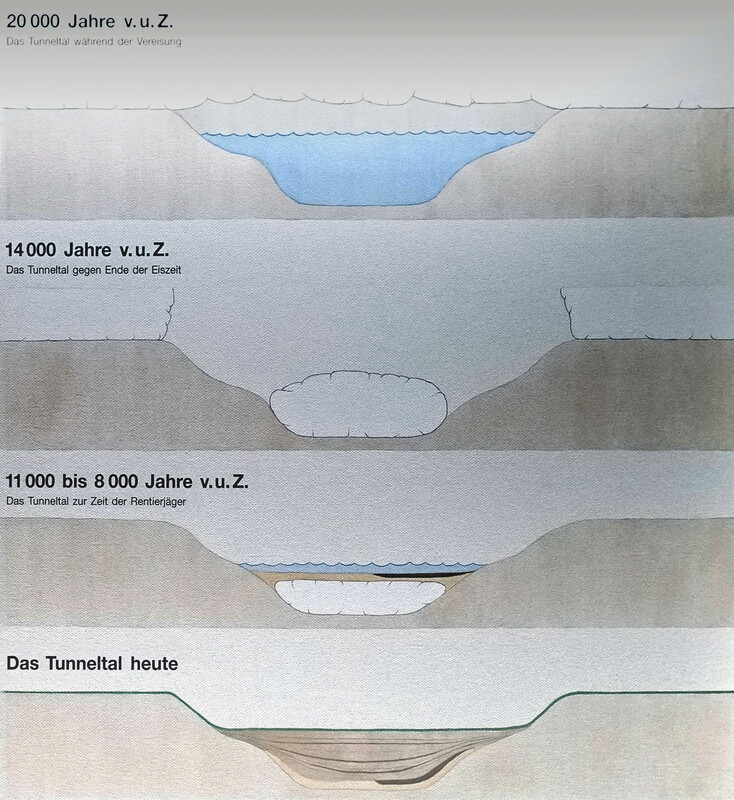 Tromnau G., 1975b: Neue Ausgrabungen imAhrensburger Tunneltal. Ein Beitrag zurErforschung des Jungpaläolithikums im Nordwesteuropäischen Flachland, Neumünster: Karl Wachholtz Verlag GmbH.